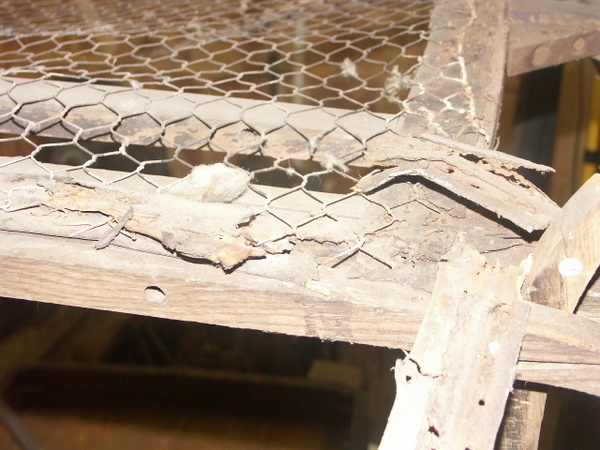 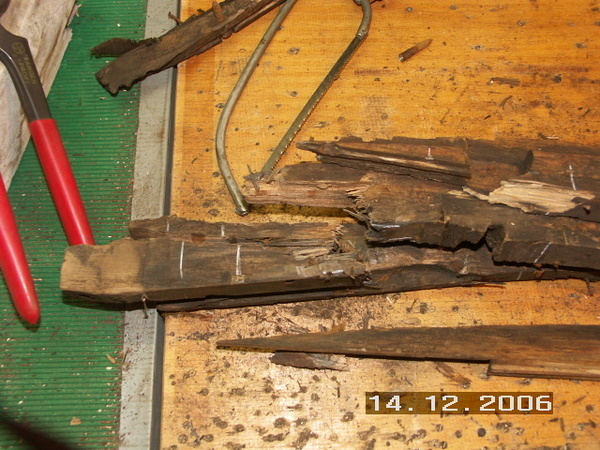 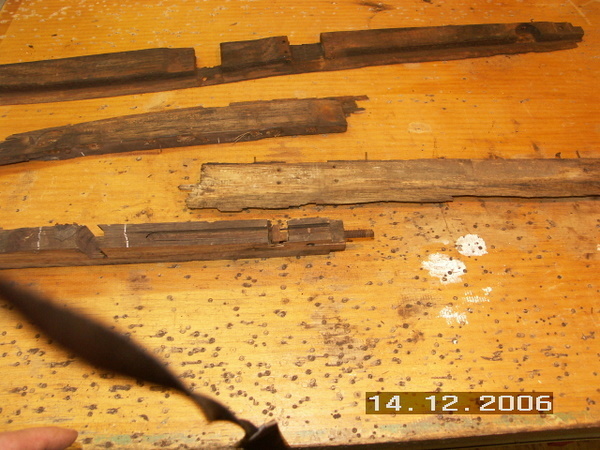 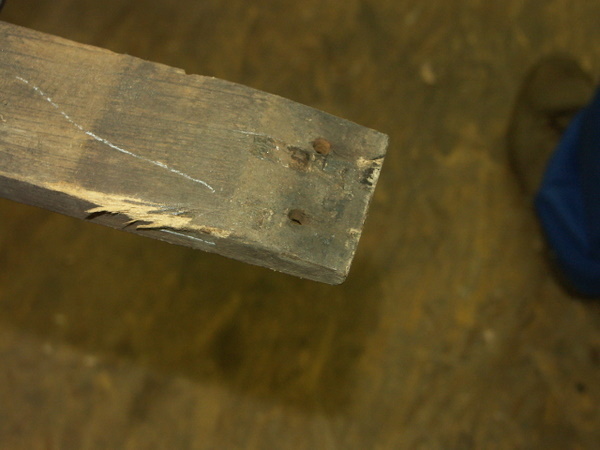 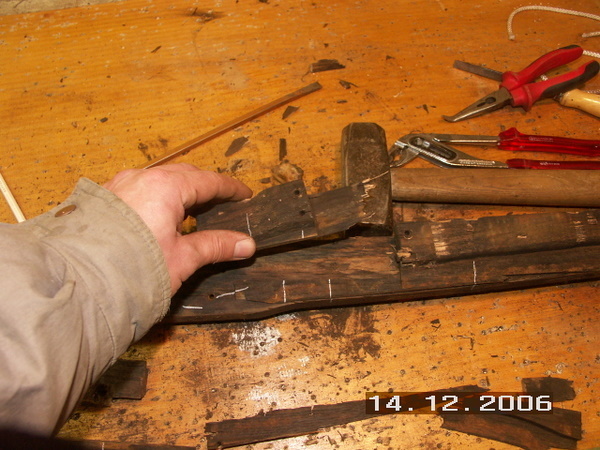 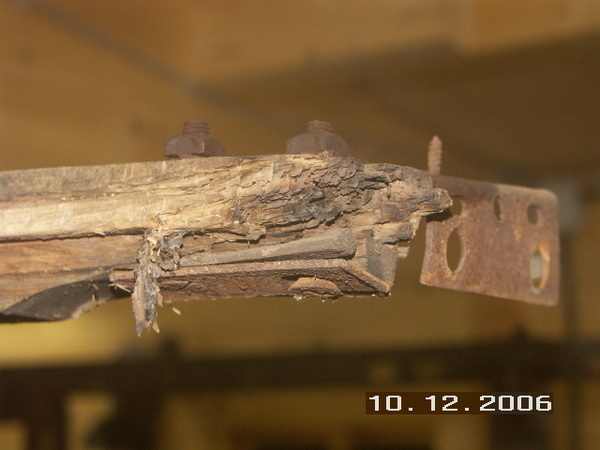 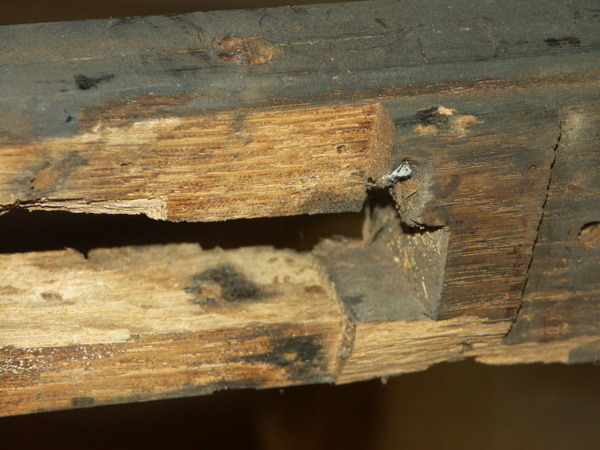 The entire wood has to be replaced. 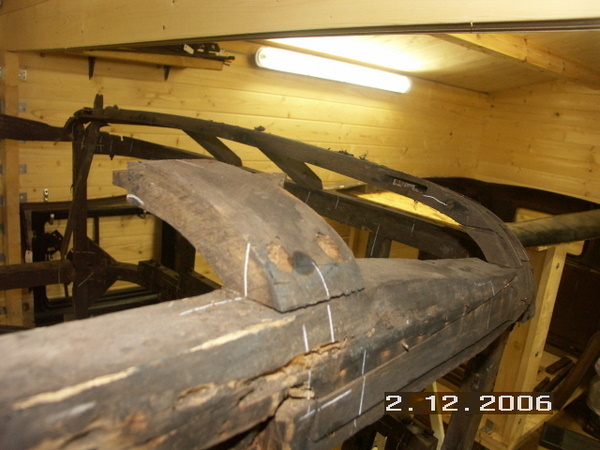 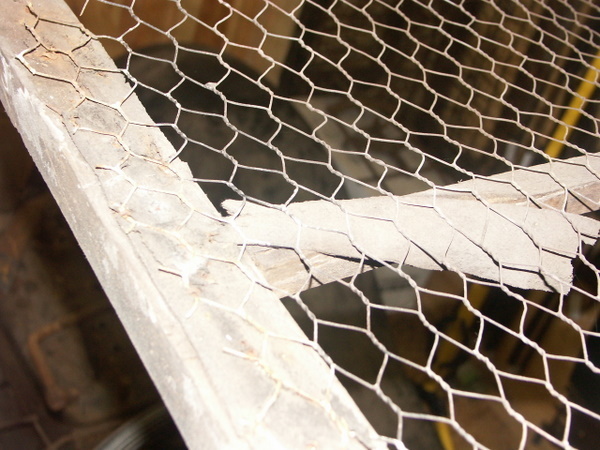 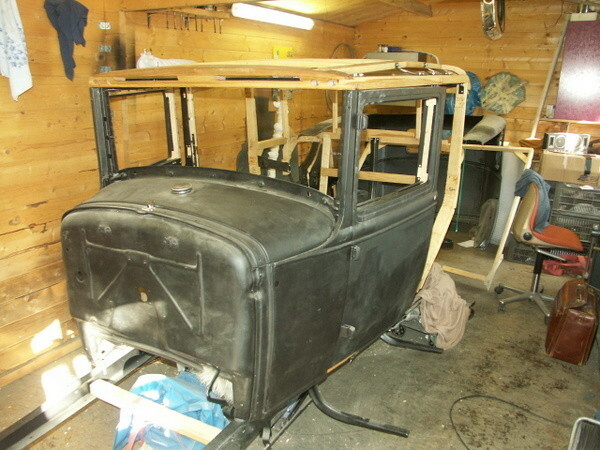 At the moment we copy the original parts in new dry ashwood. 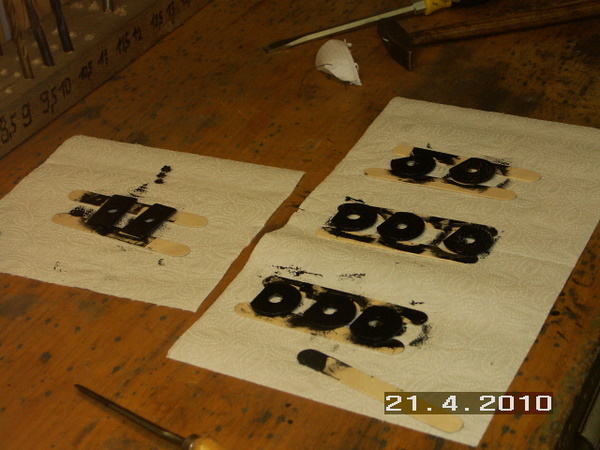 The basis for copying is in most cases accectable. 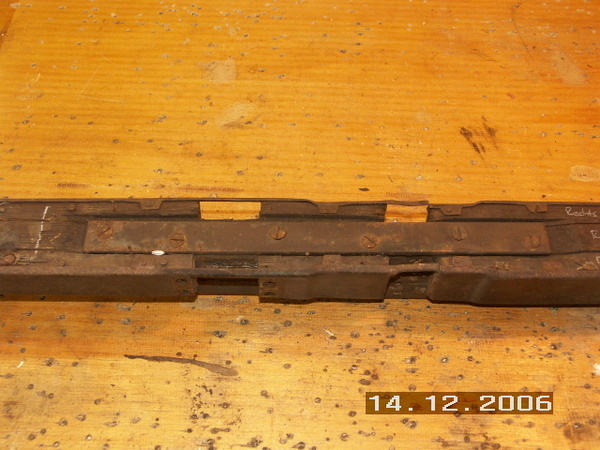 The header was gone beyond any chance of copying and has to be acquired at MACs. 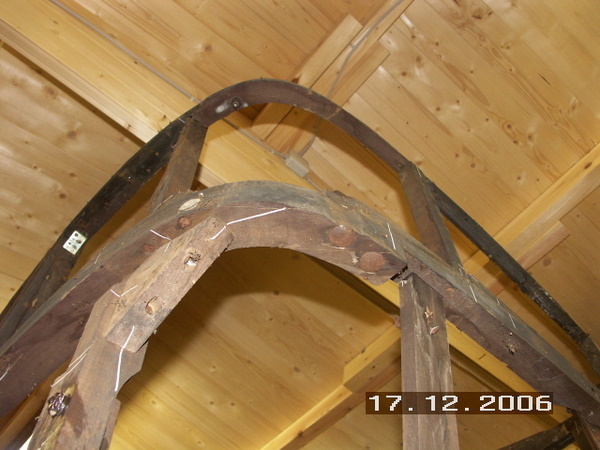 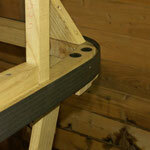 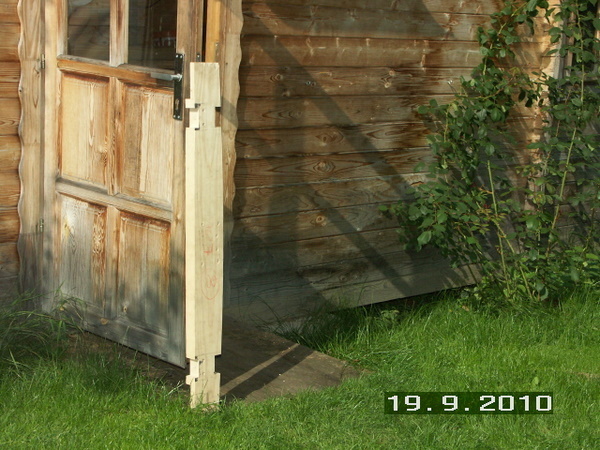 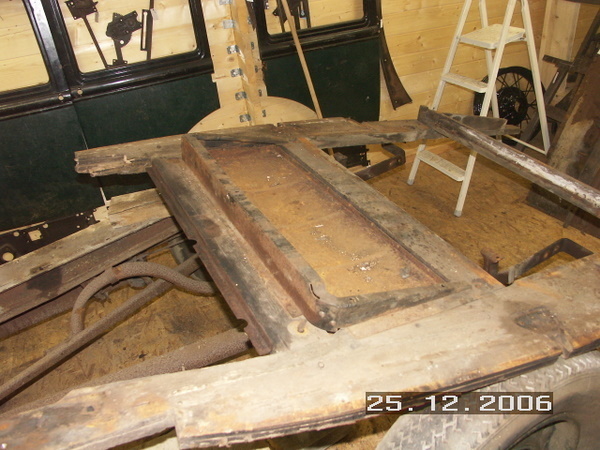 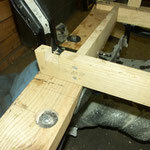 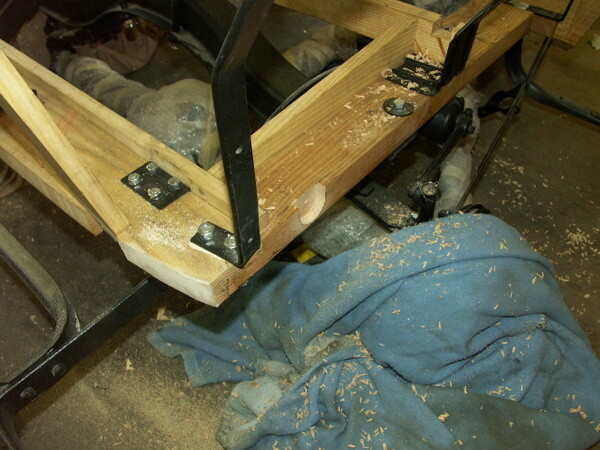 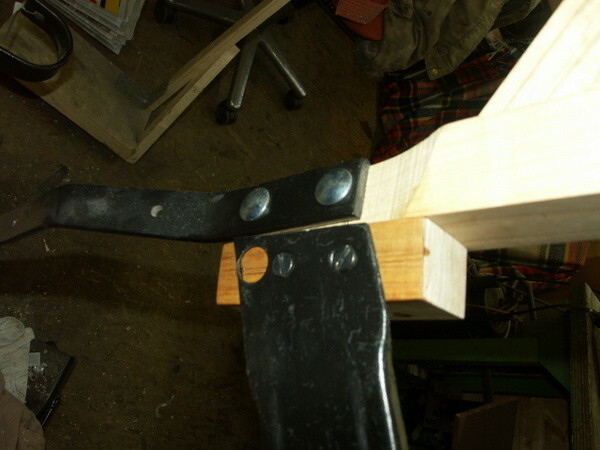 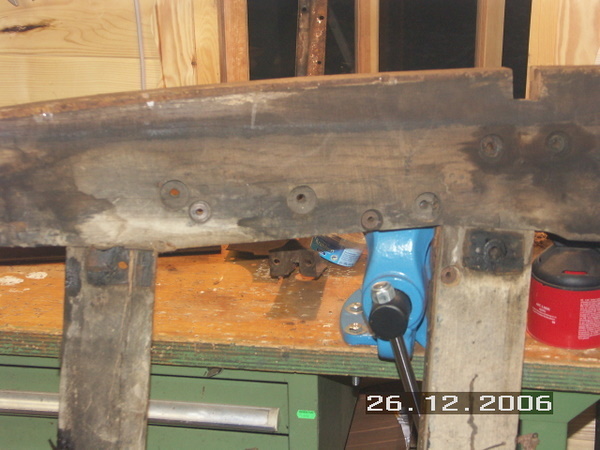 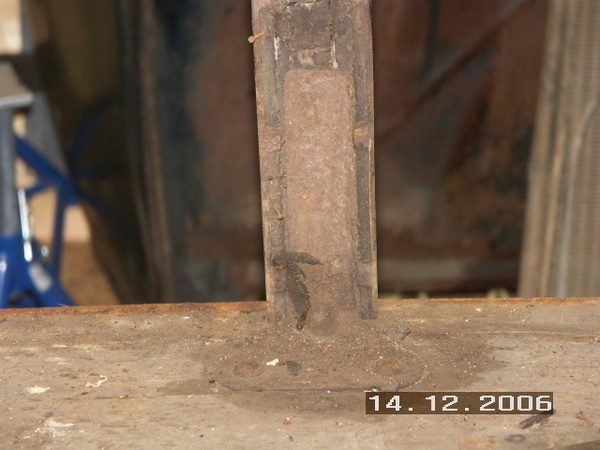 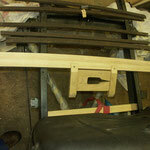 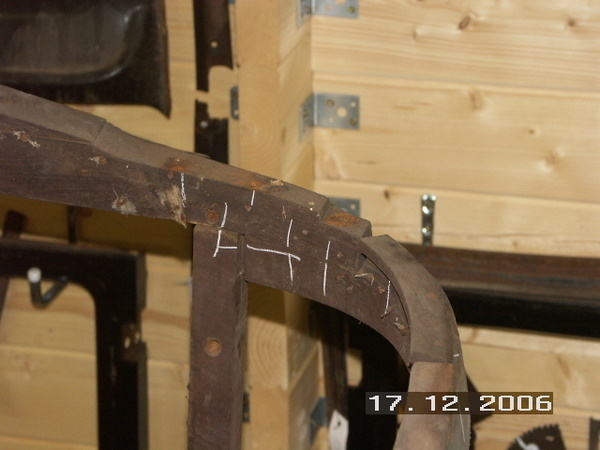 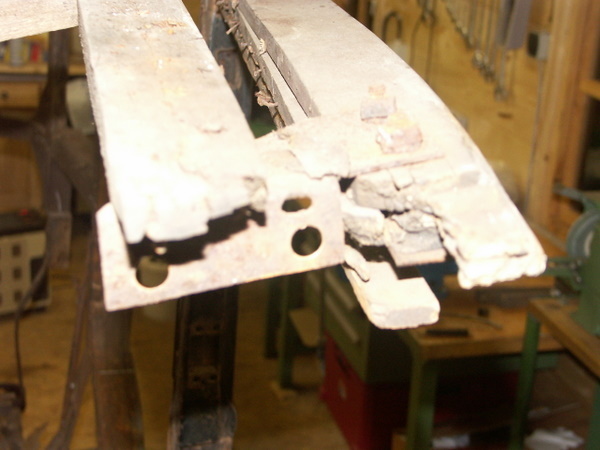 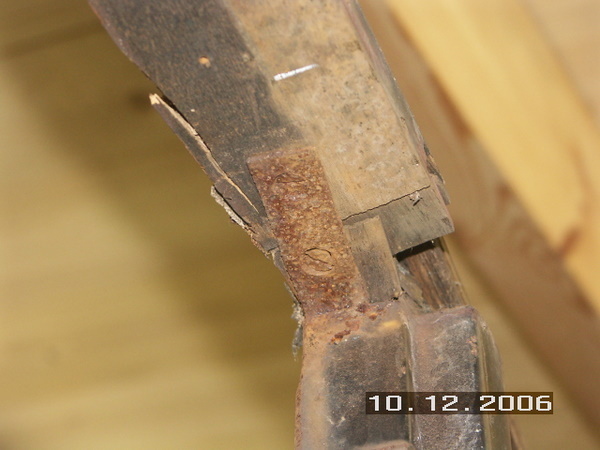 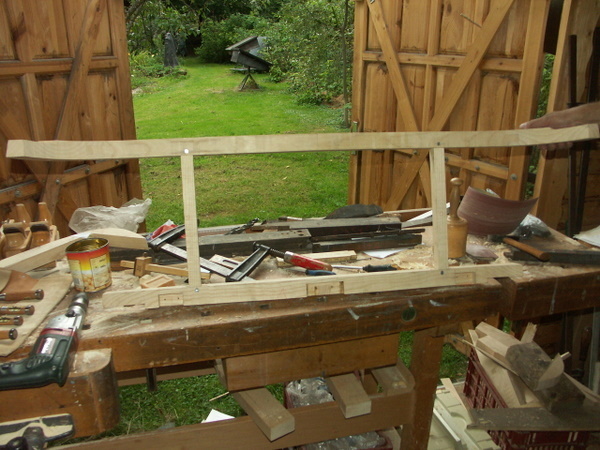 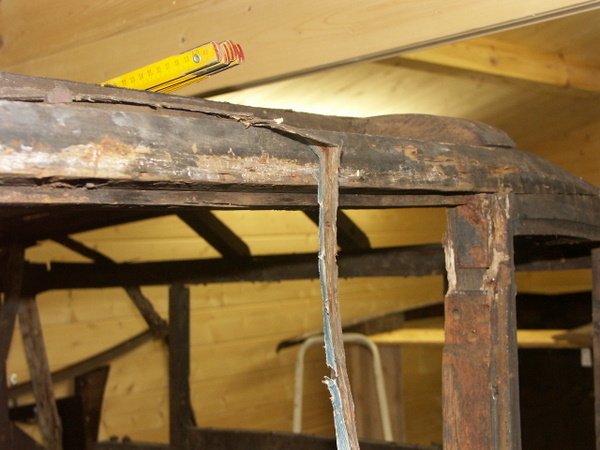 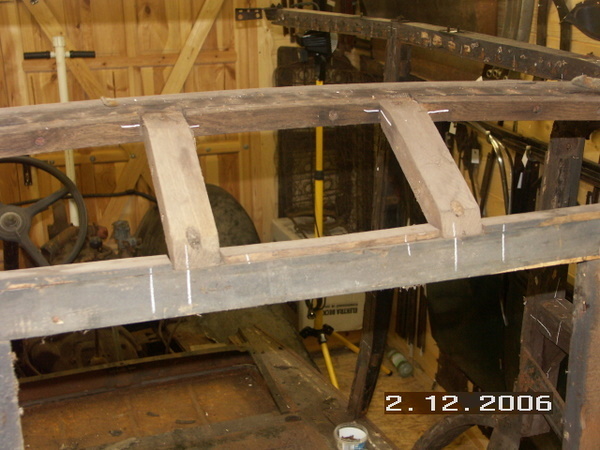 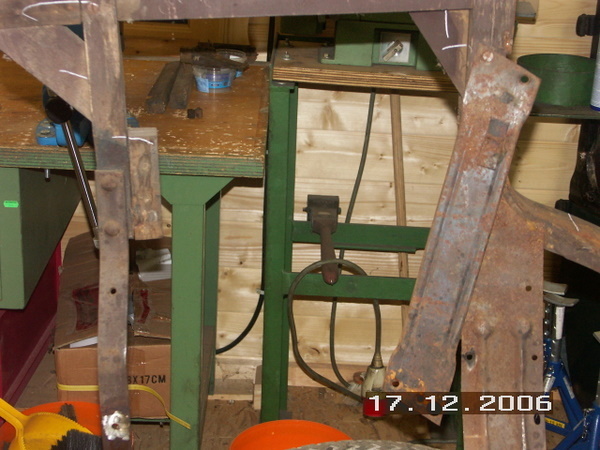 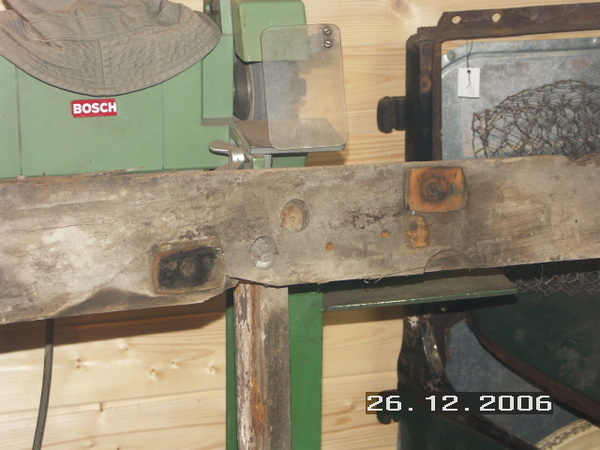 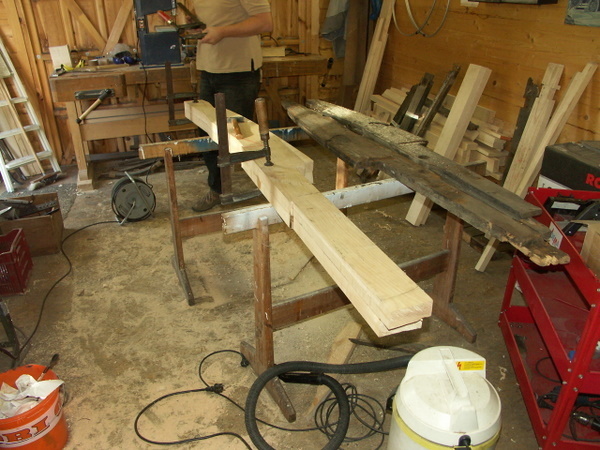 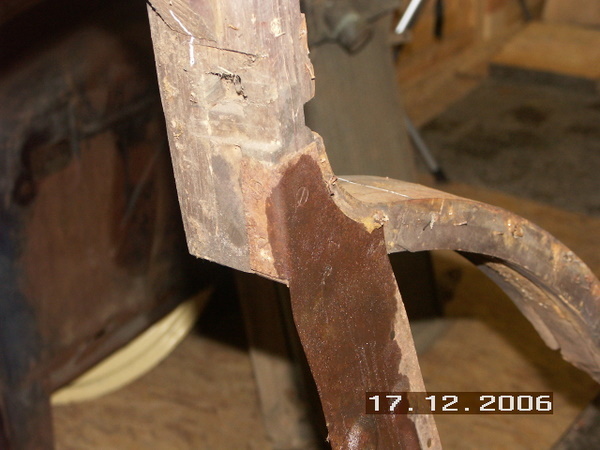 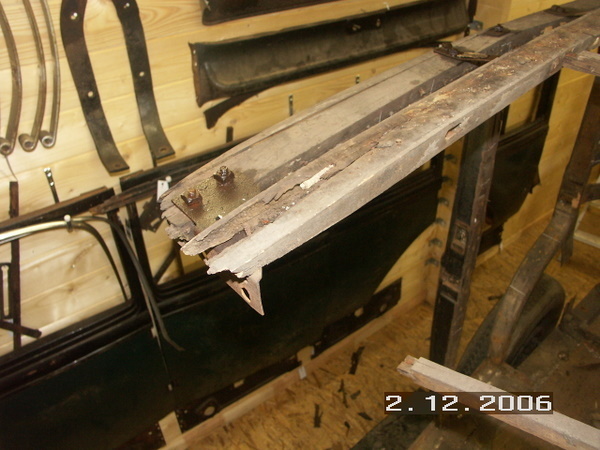 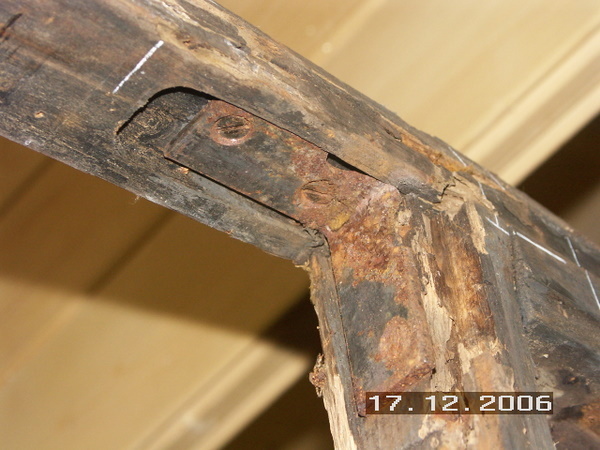 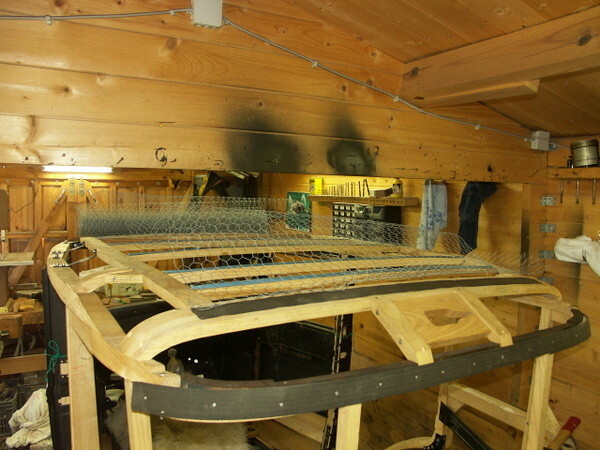 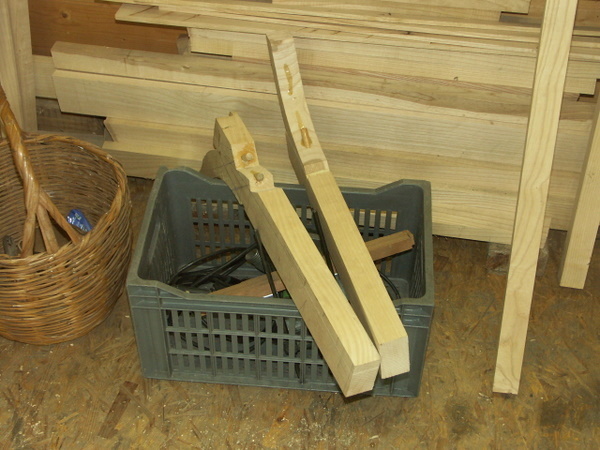 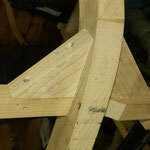 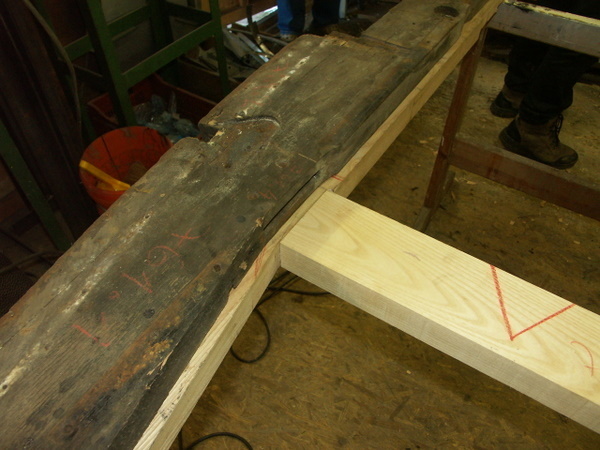 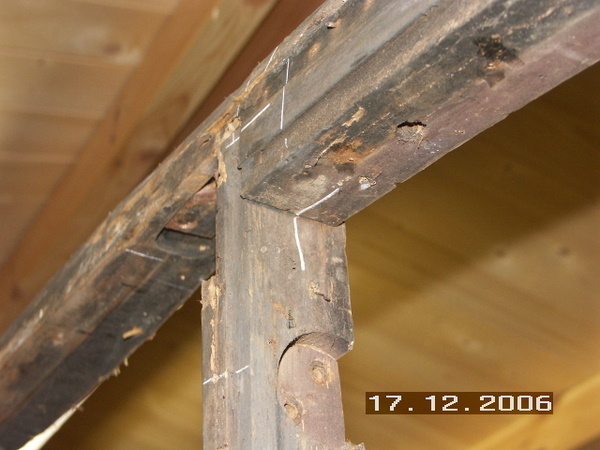 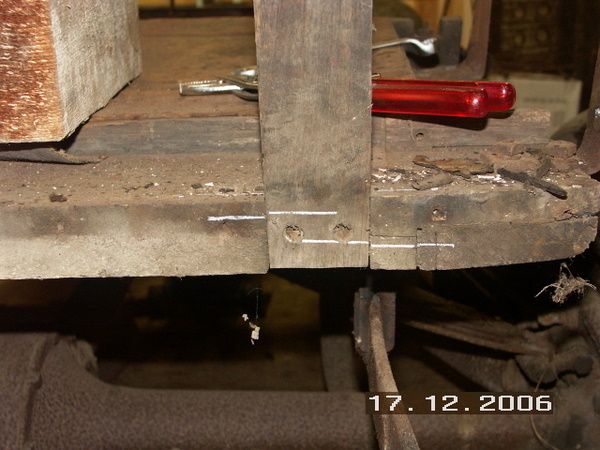 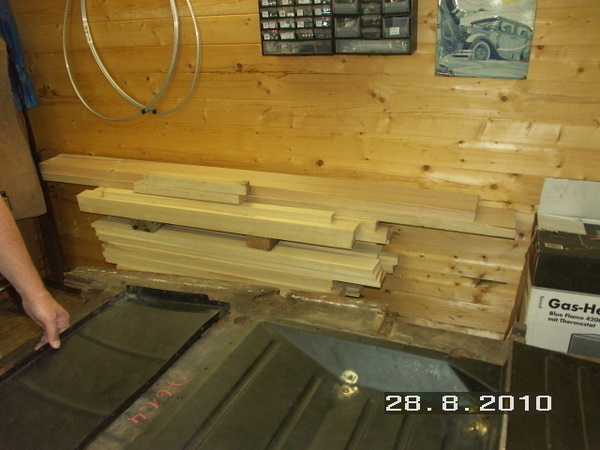 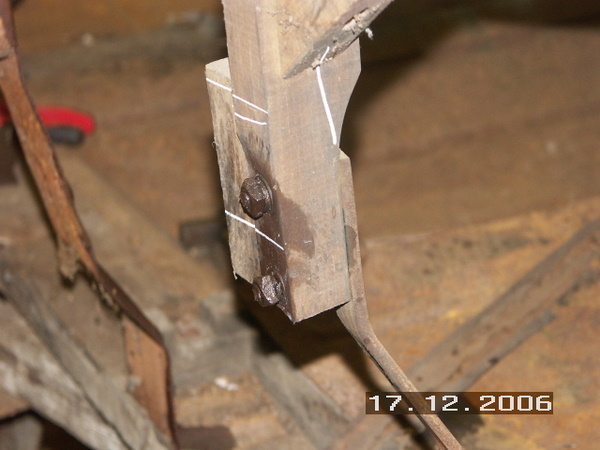 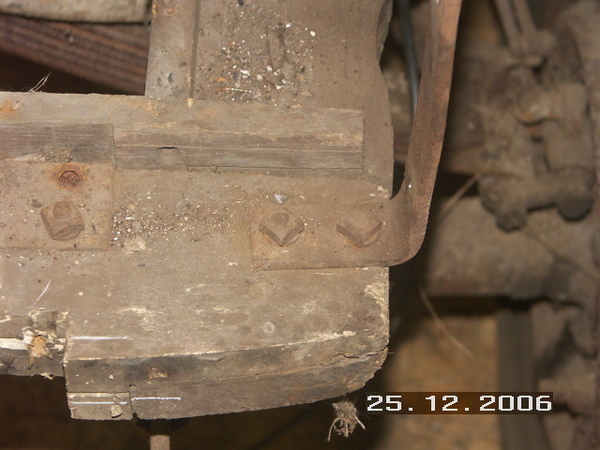 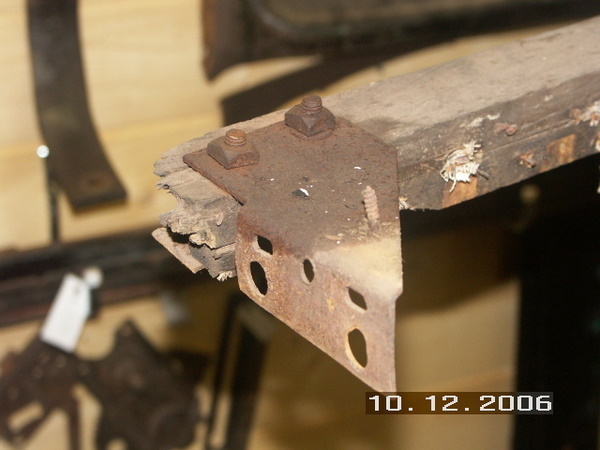 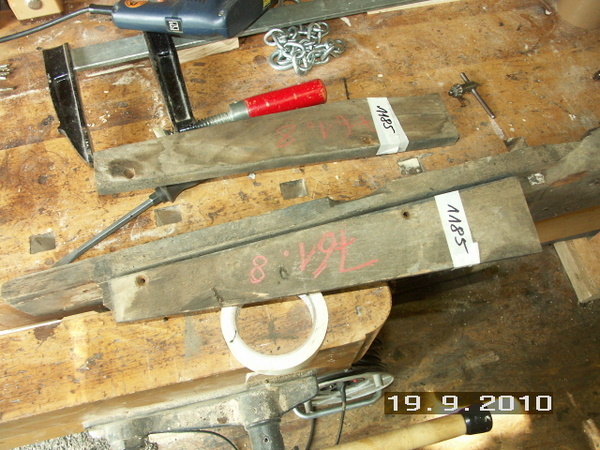 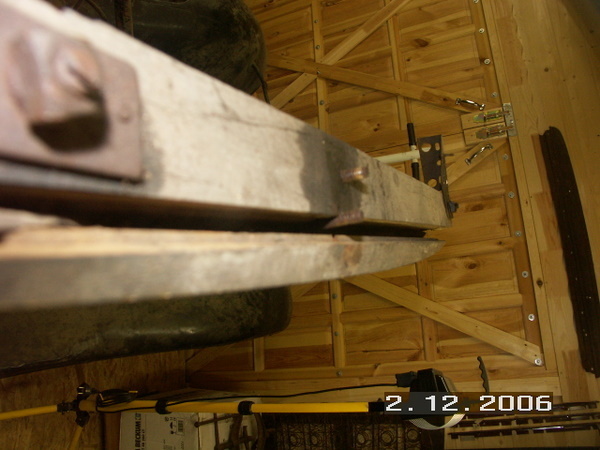 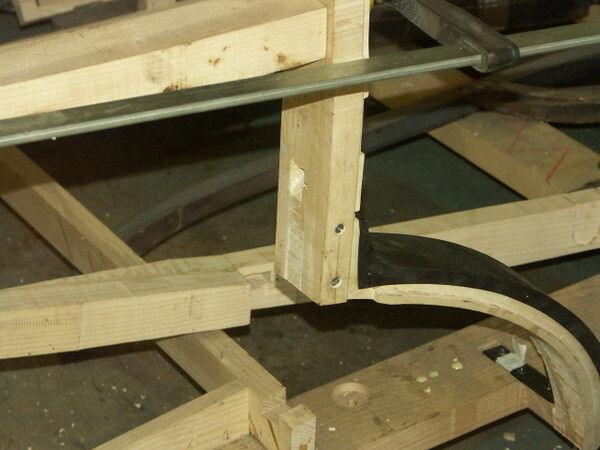 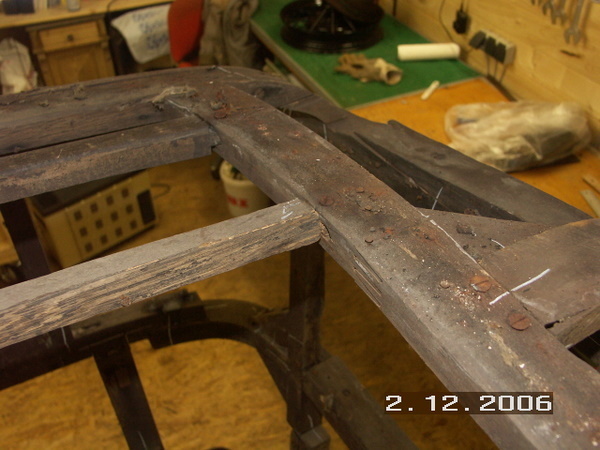 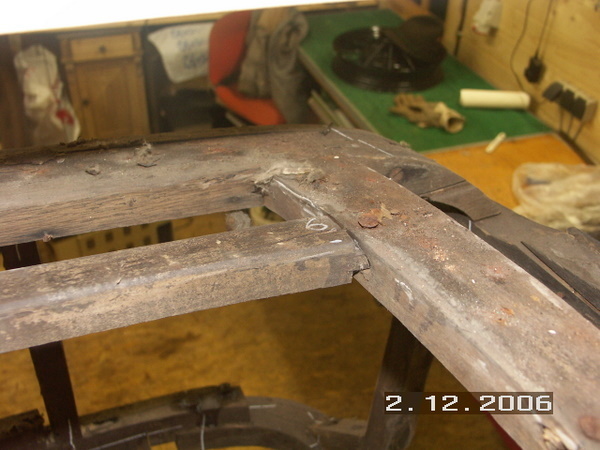 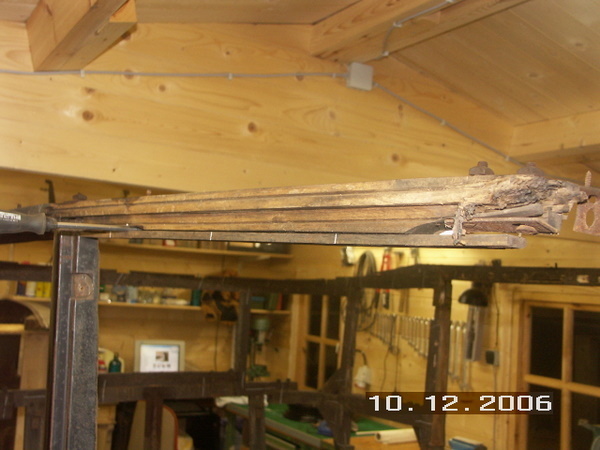 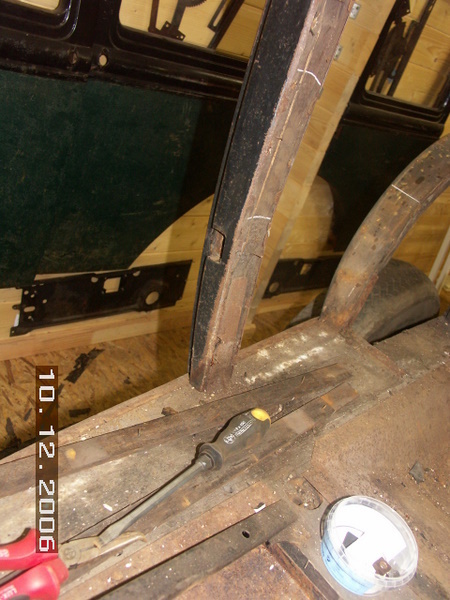 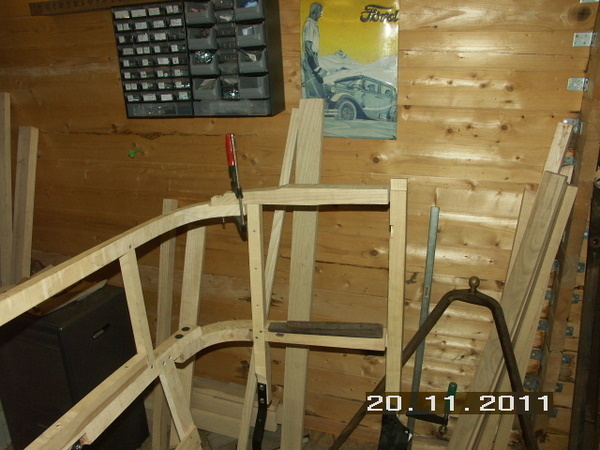 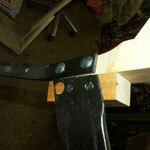 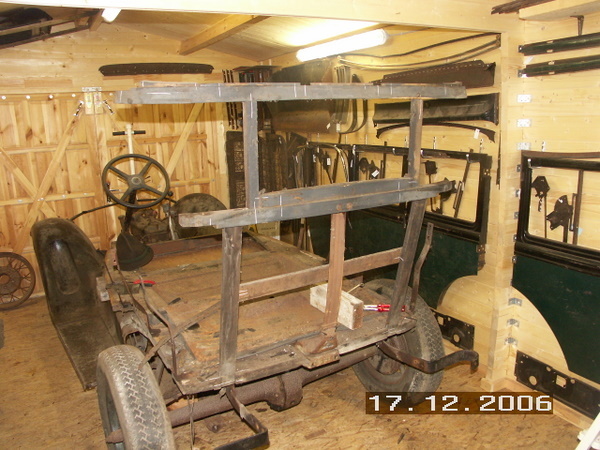 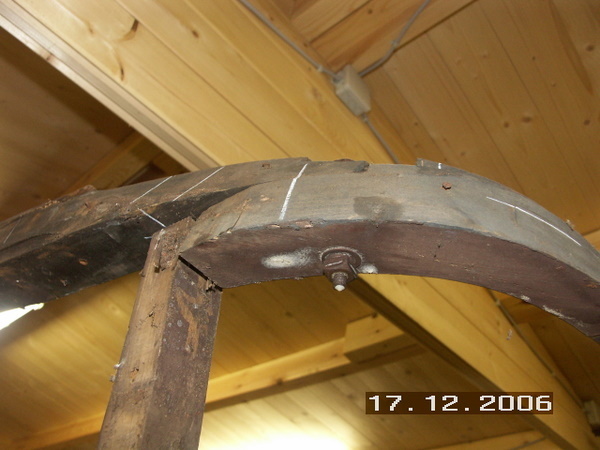 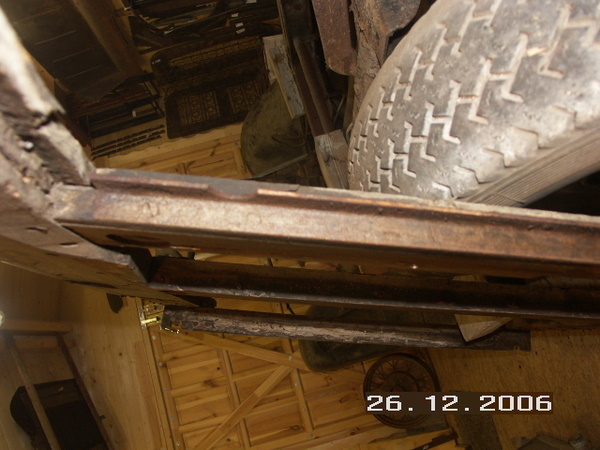 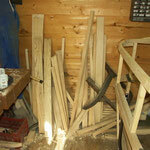 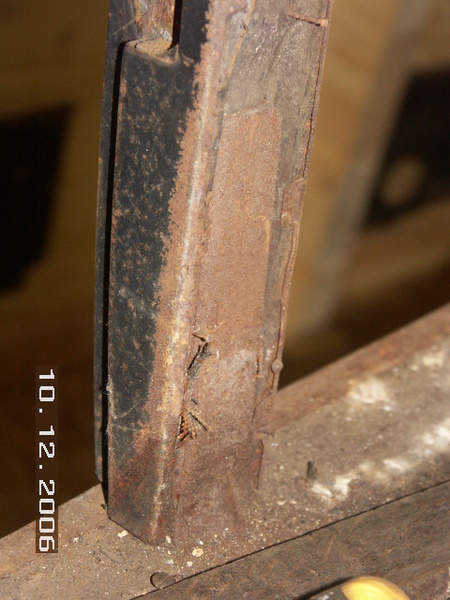 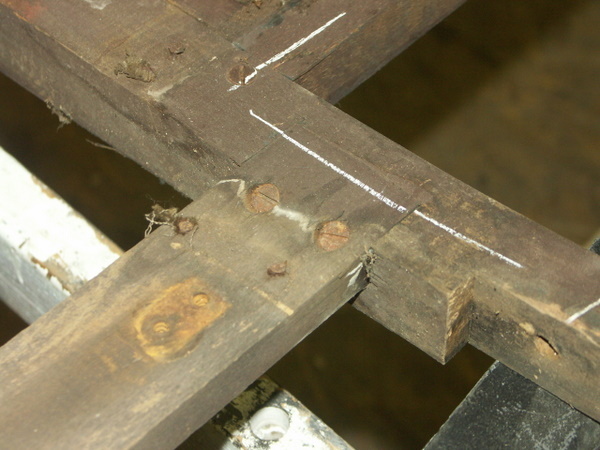 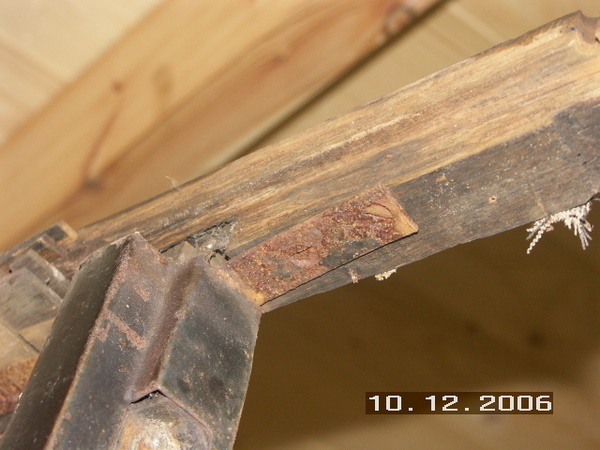 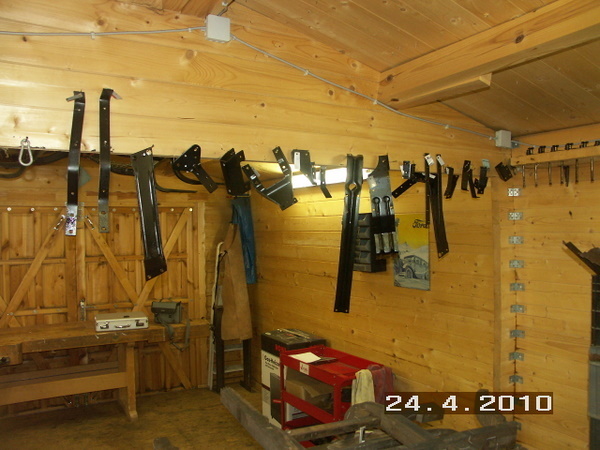 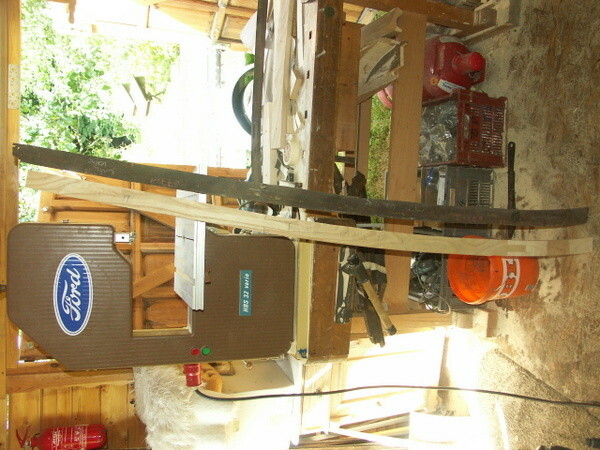 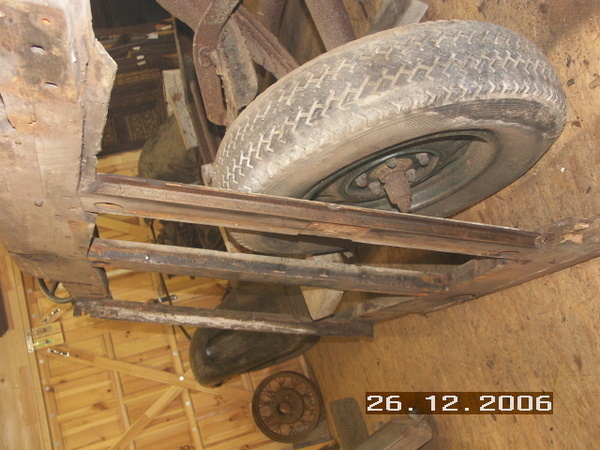 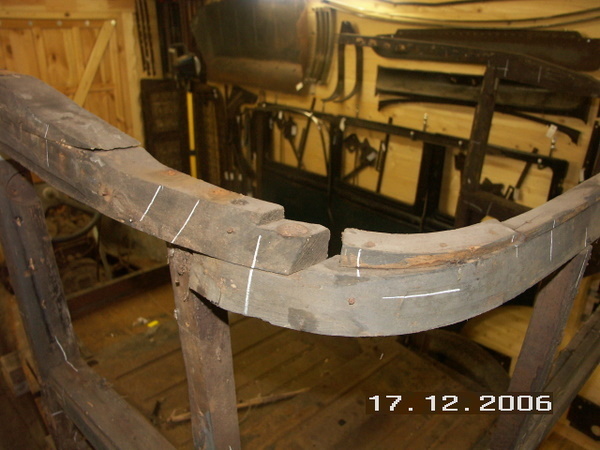 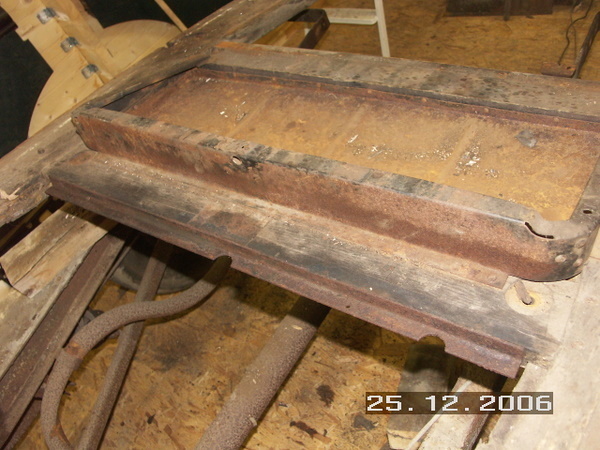 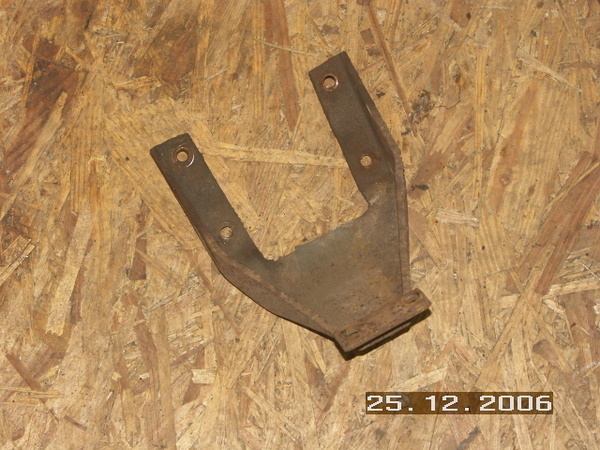 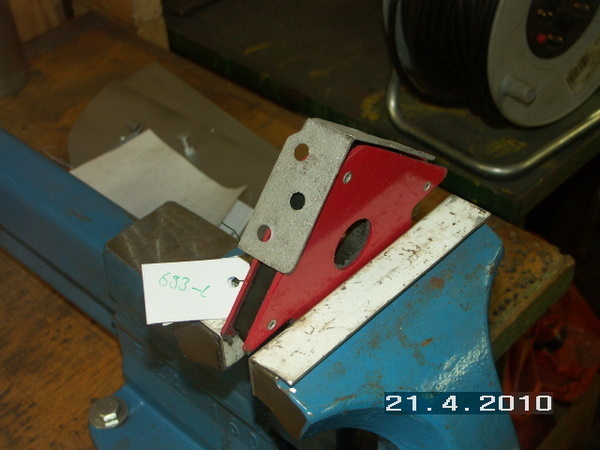 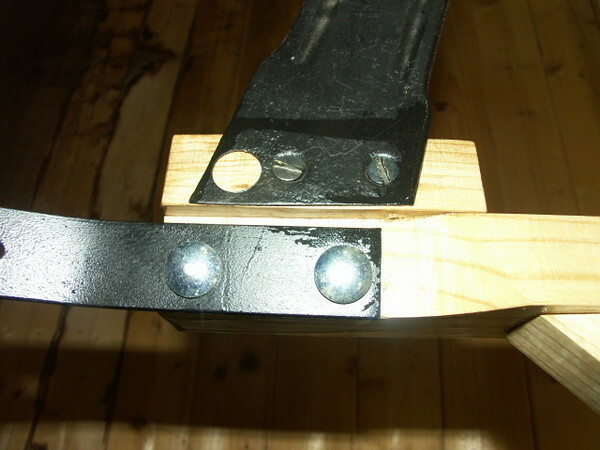 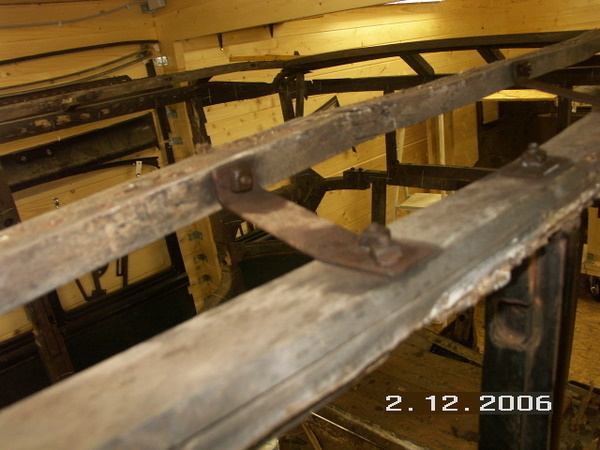 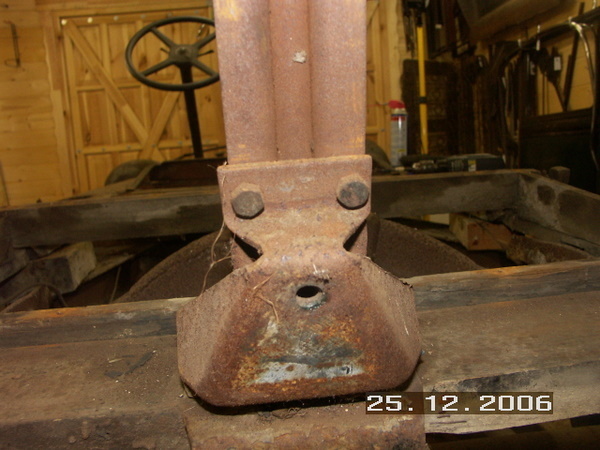 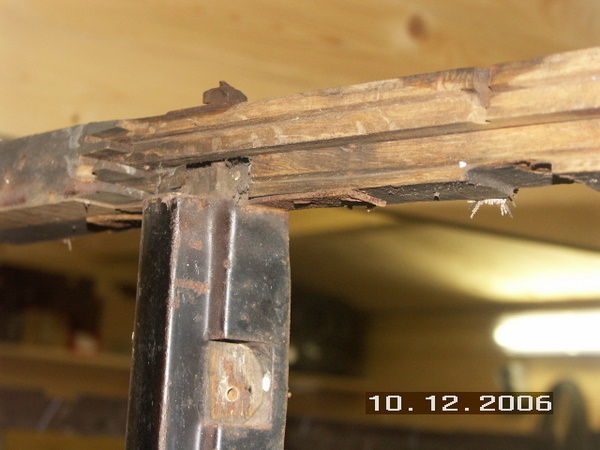 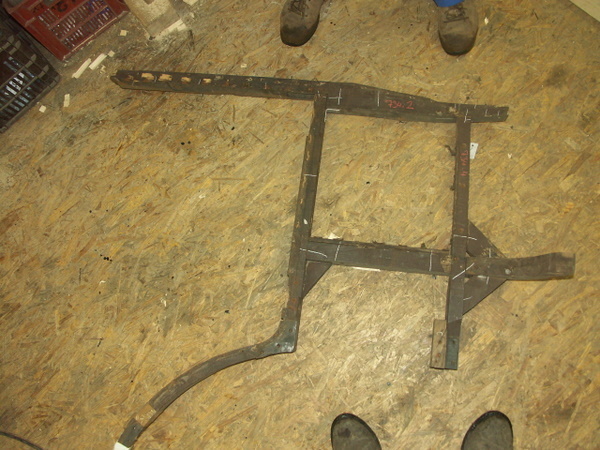 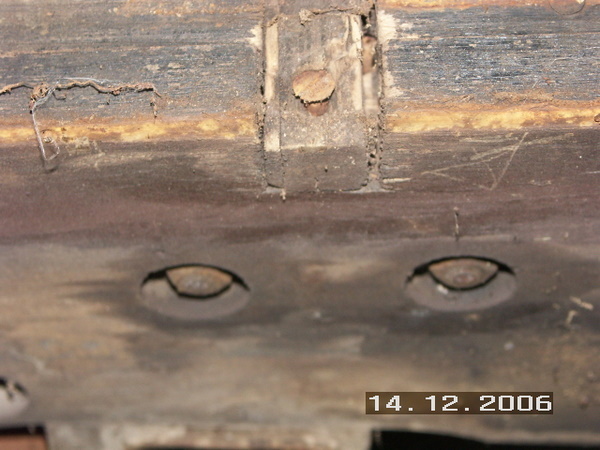 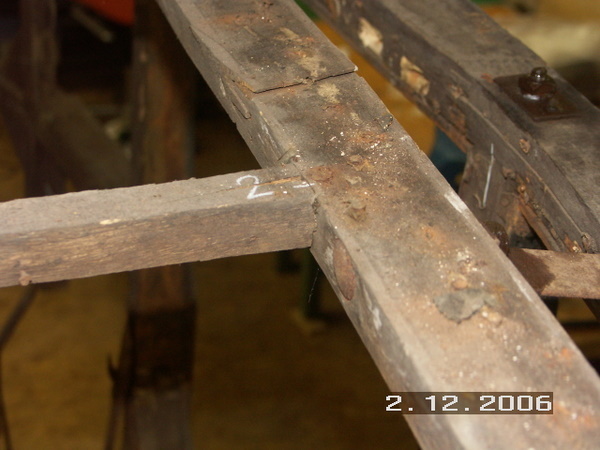 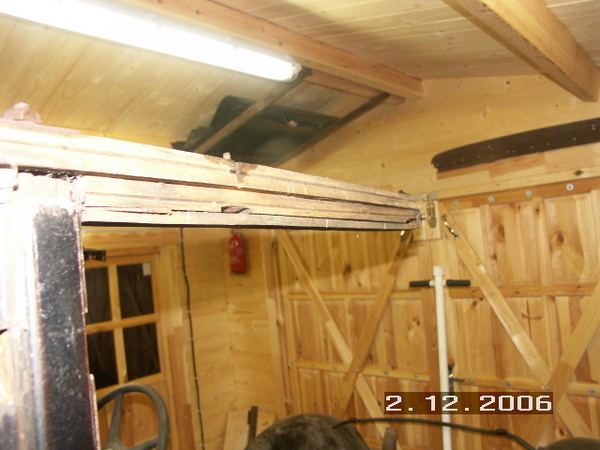 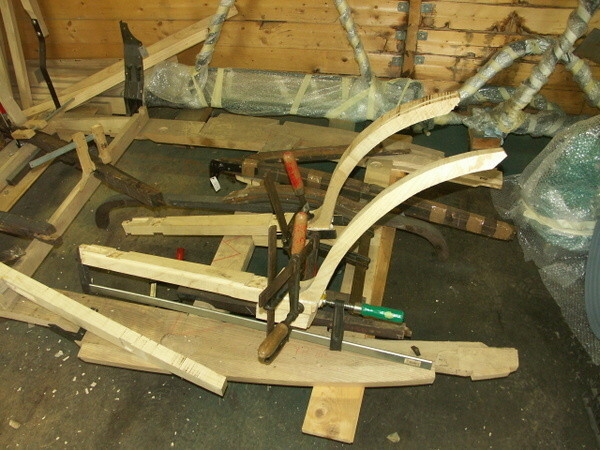 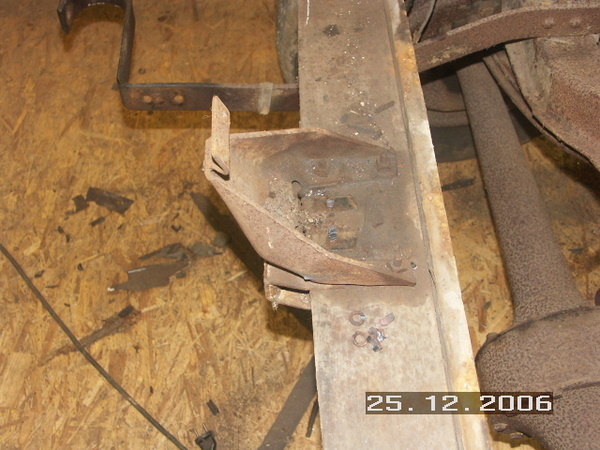 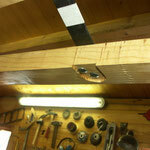 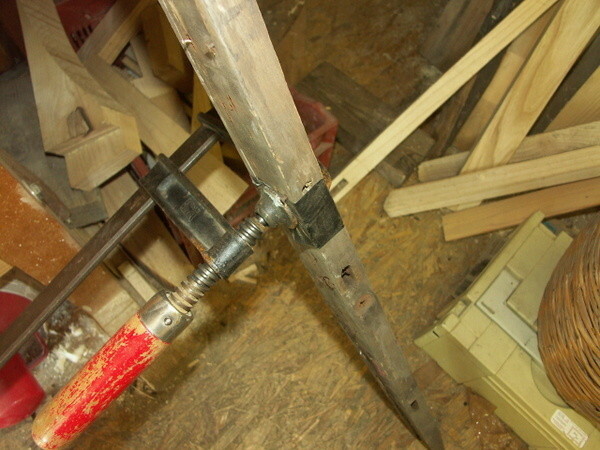 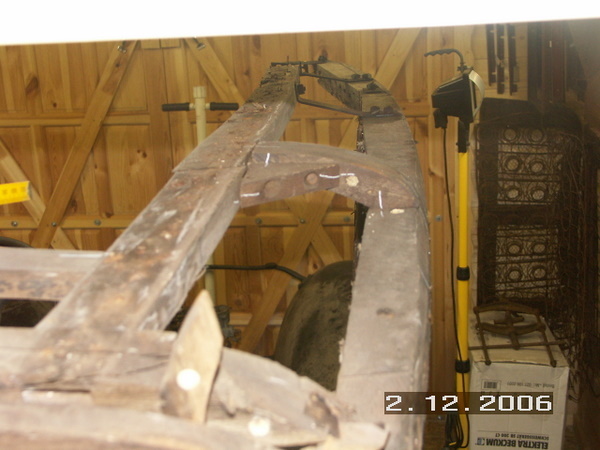 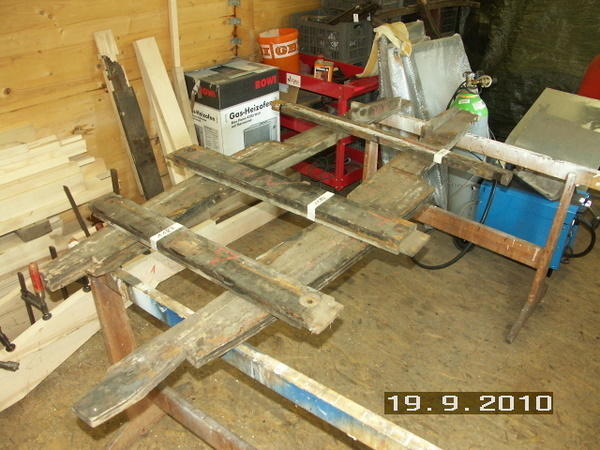 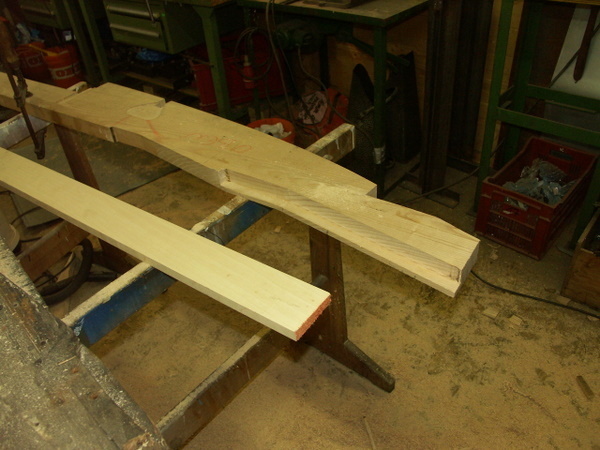 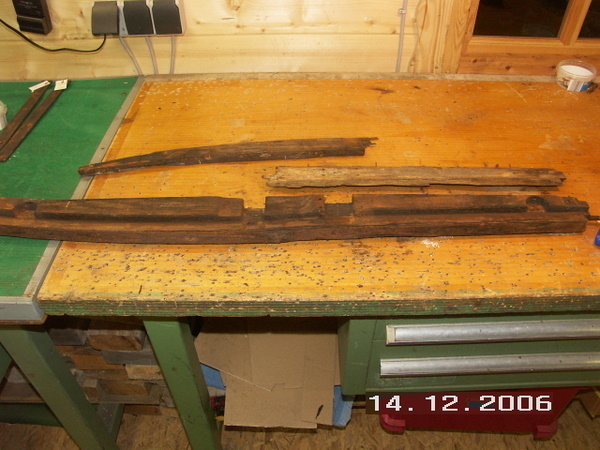 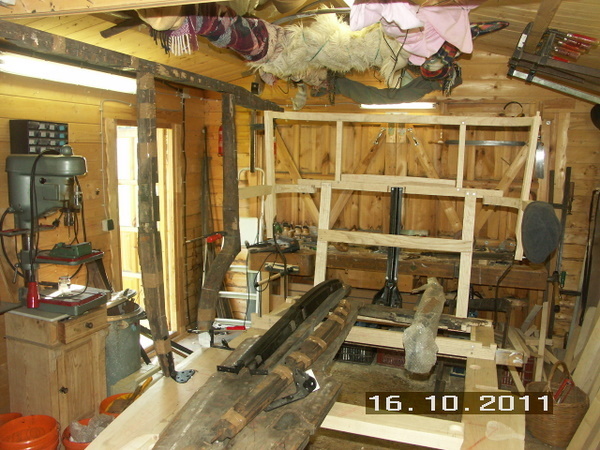 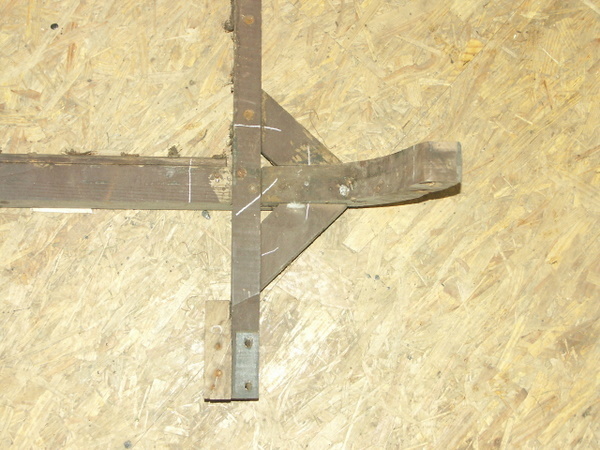 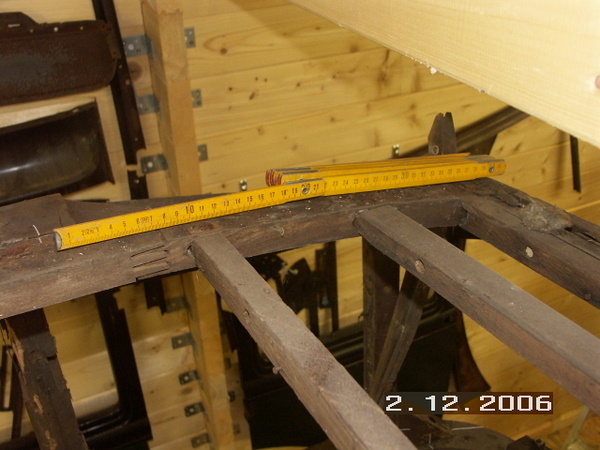 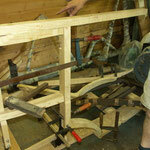 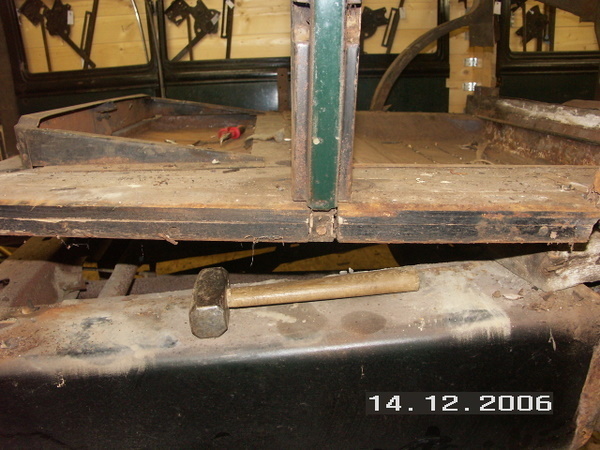 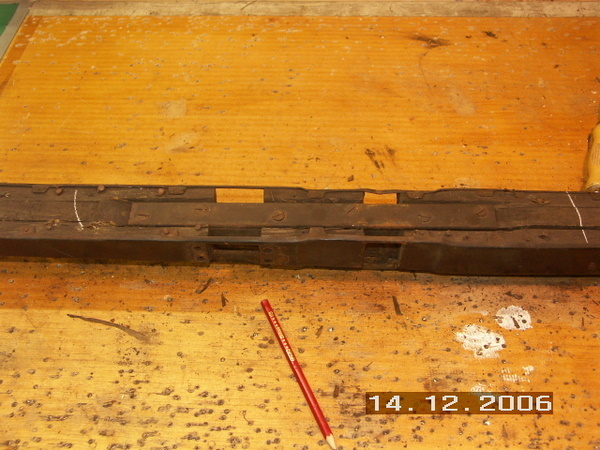 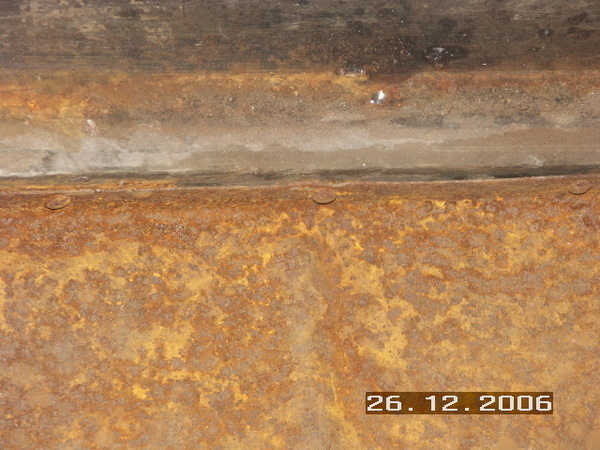 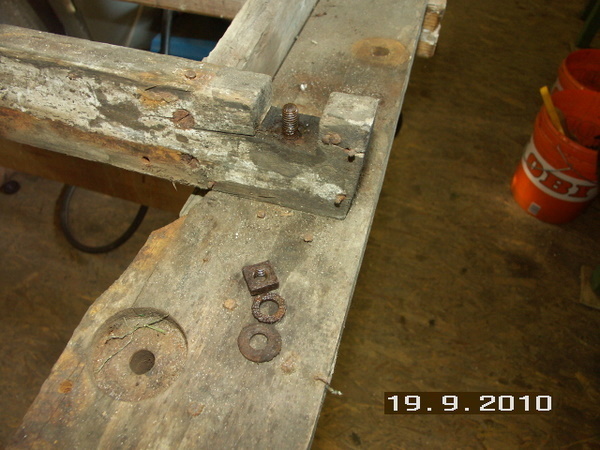 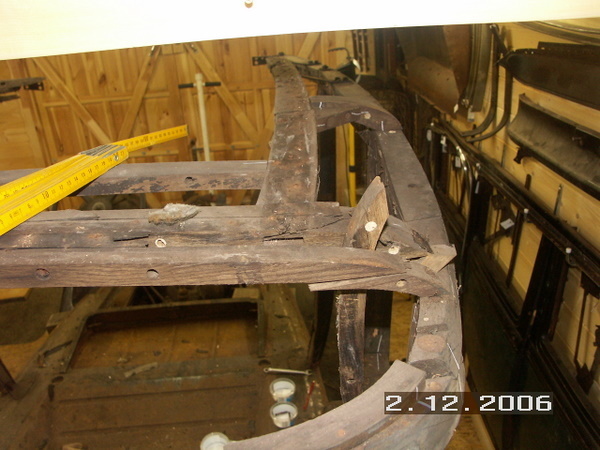 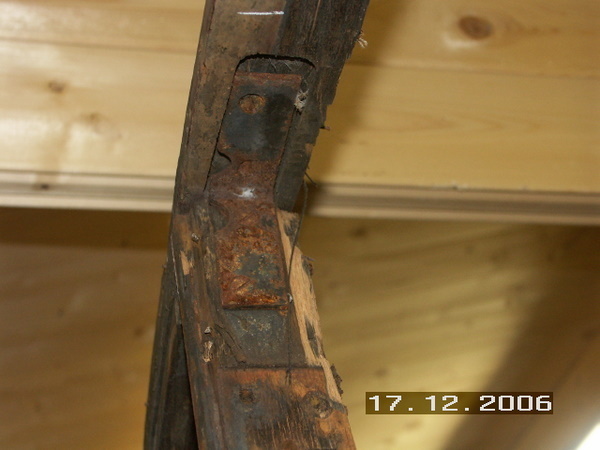 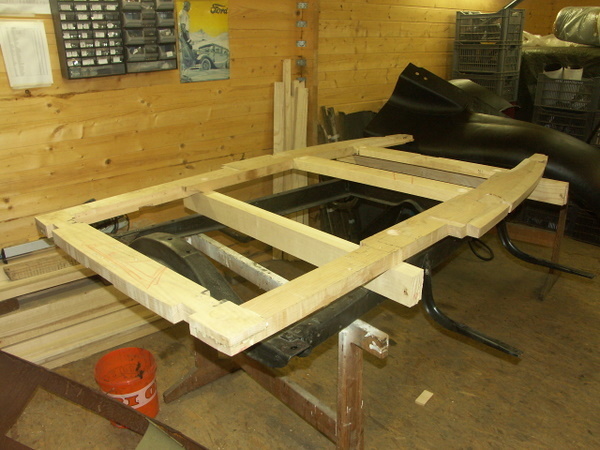 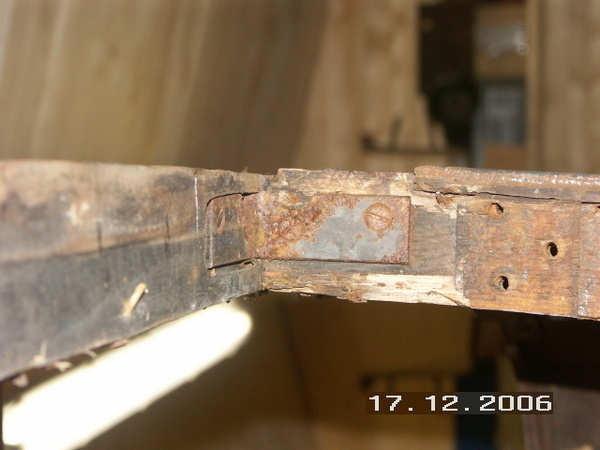 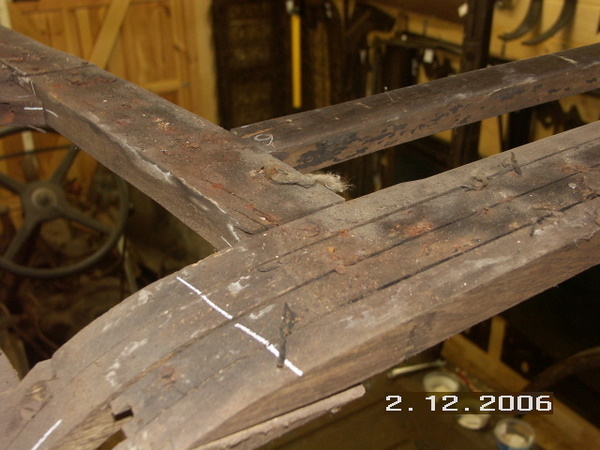 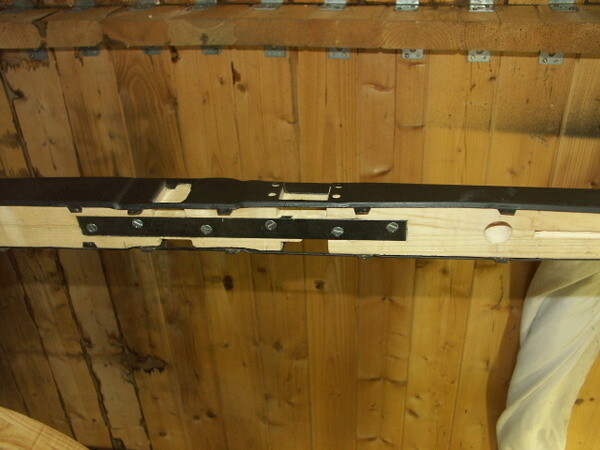 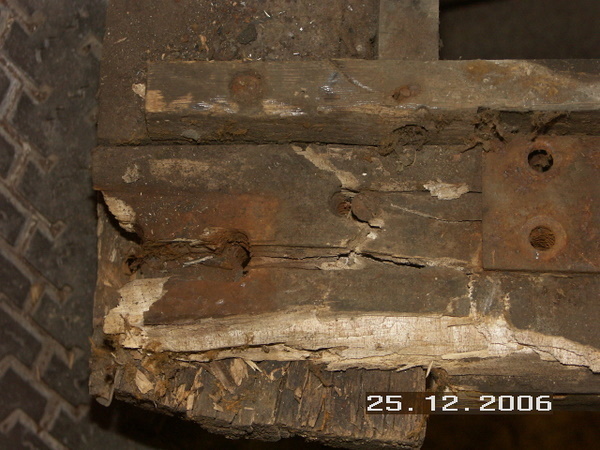 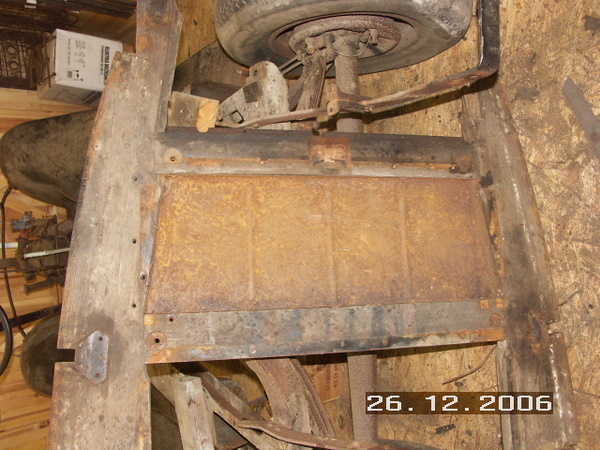 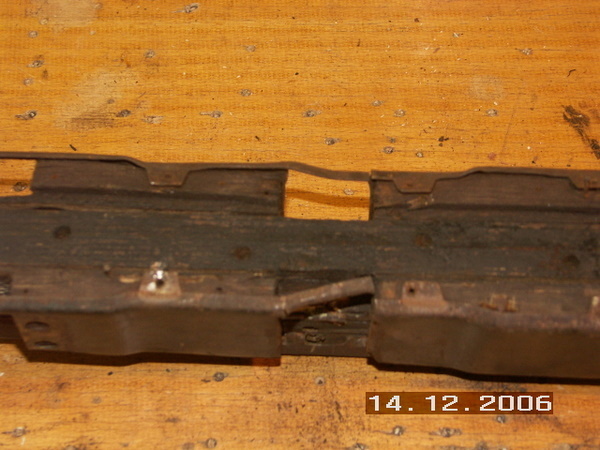 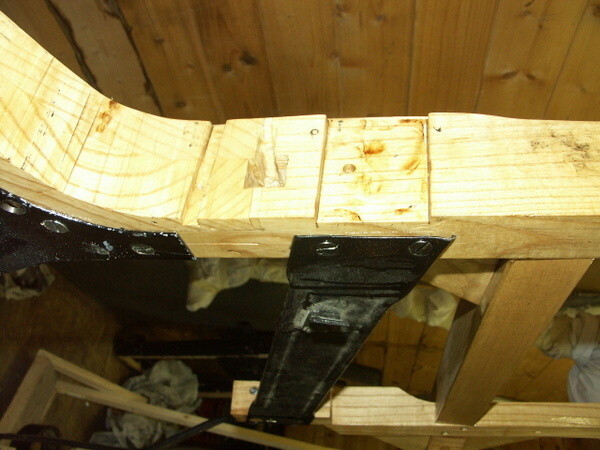 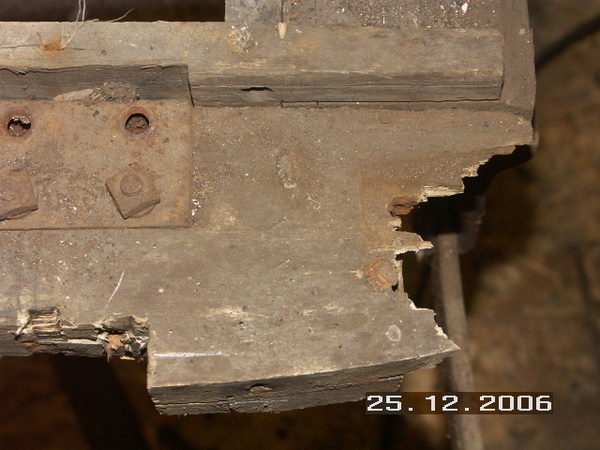 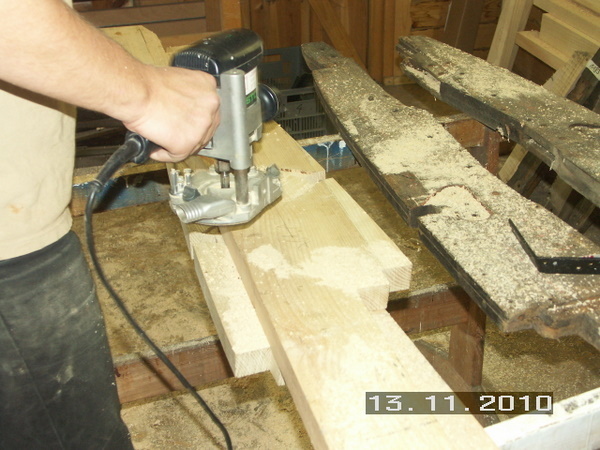 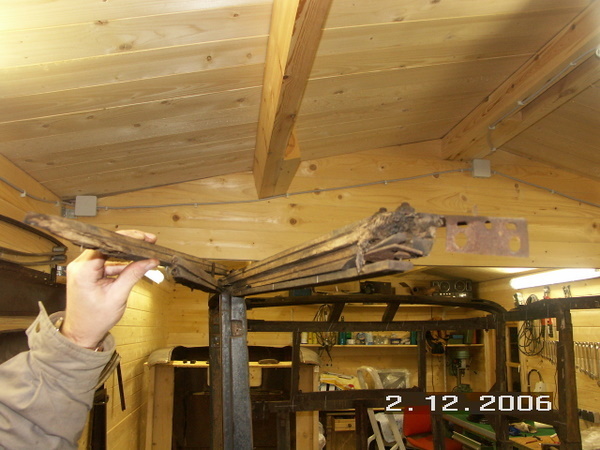 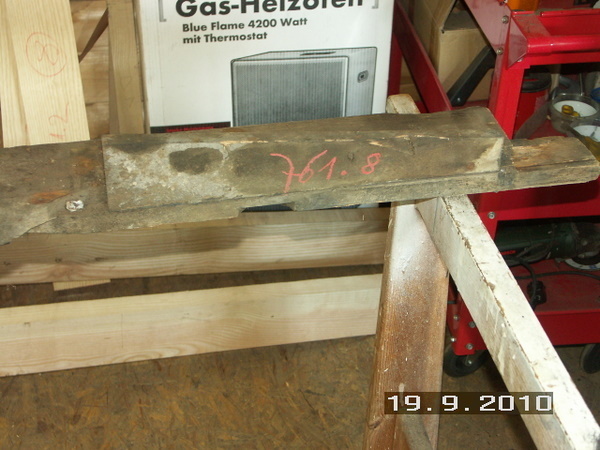 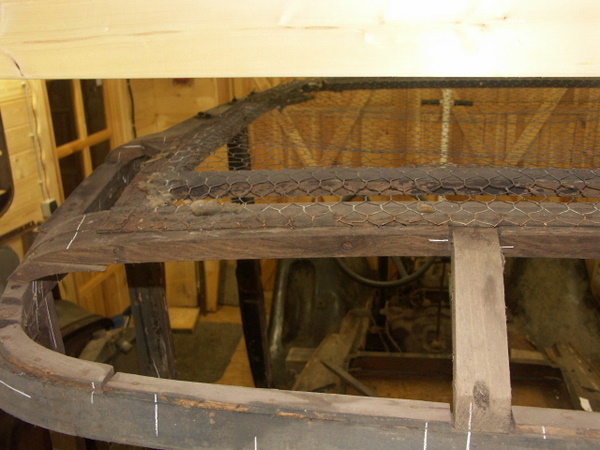 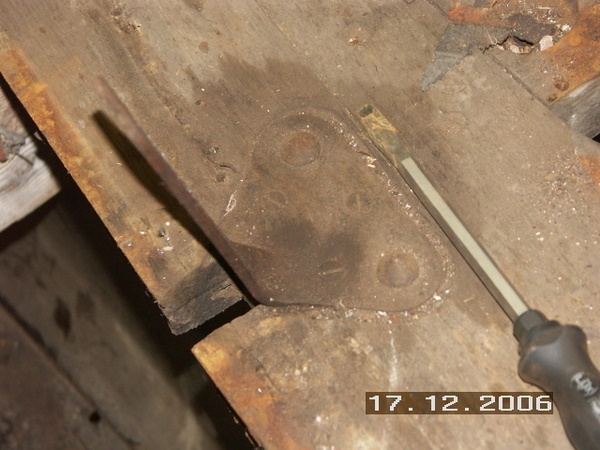 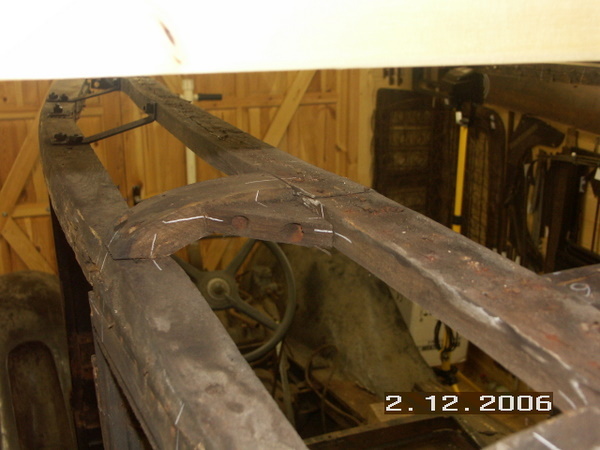 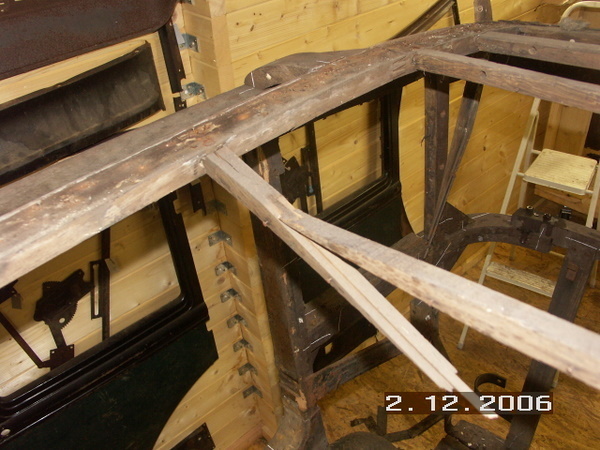 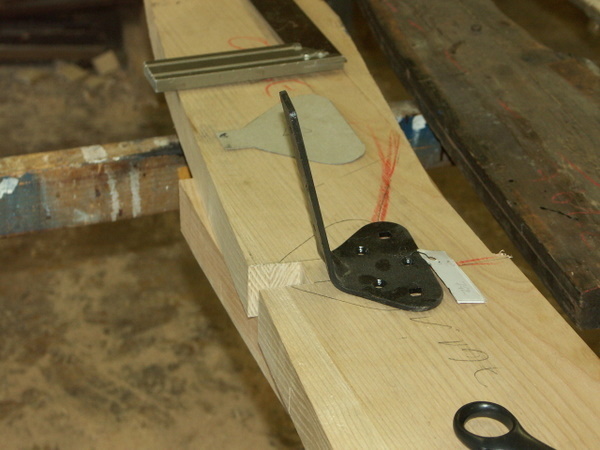 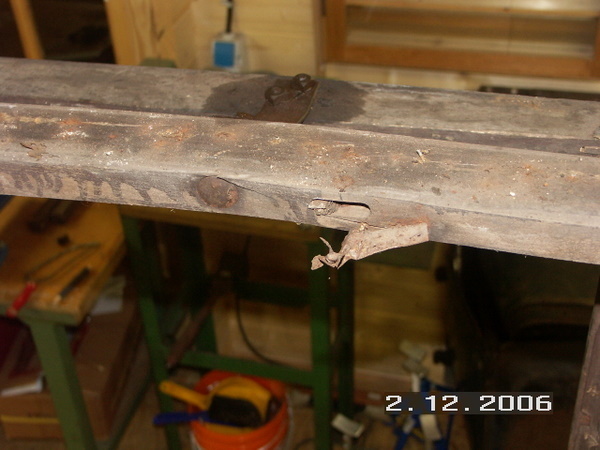 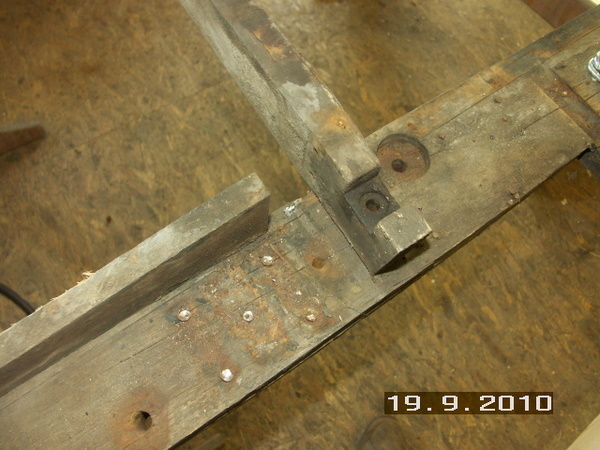 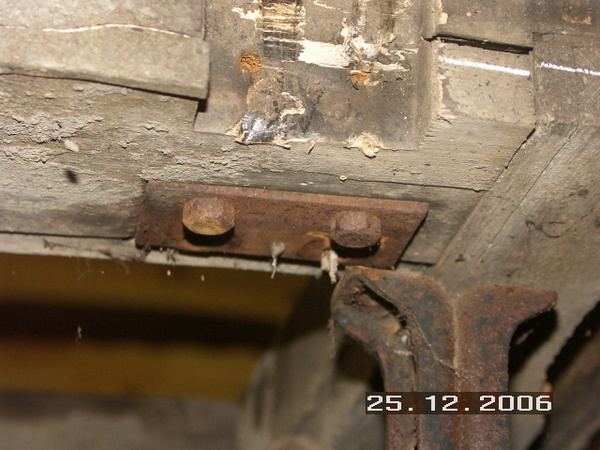 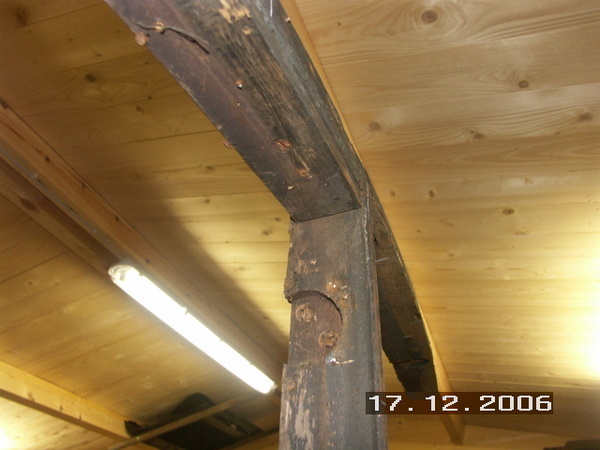 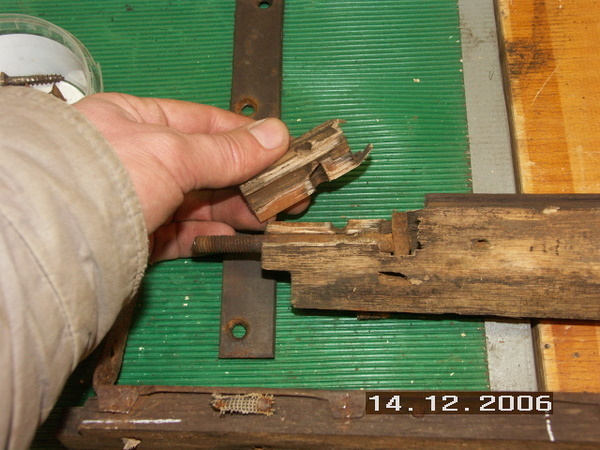 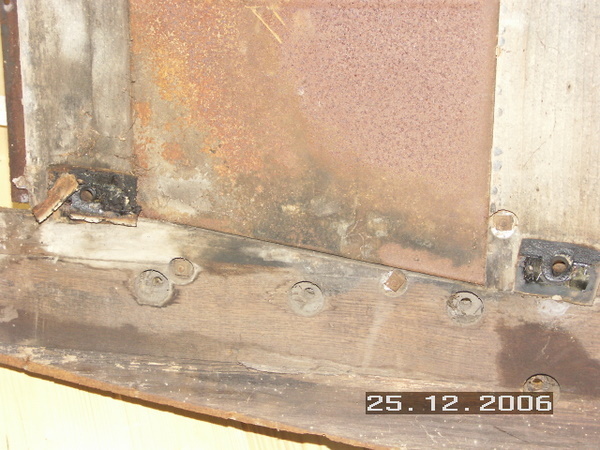 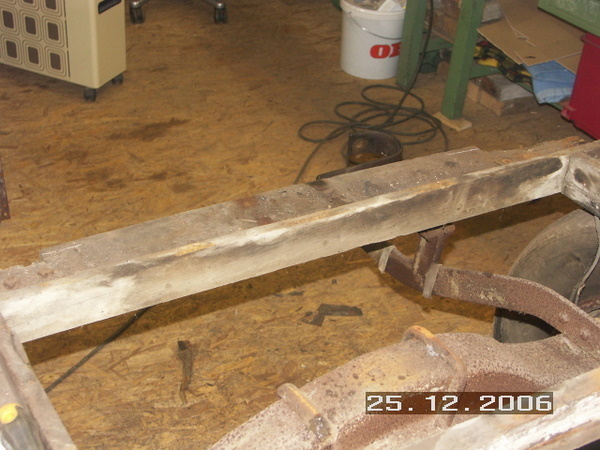 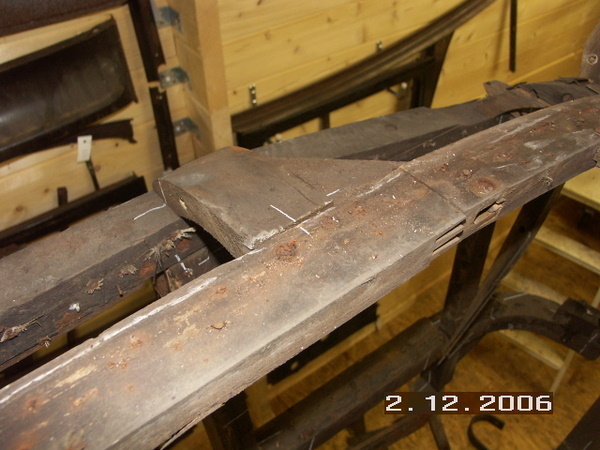 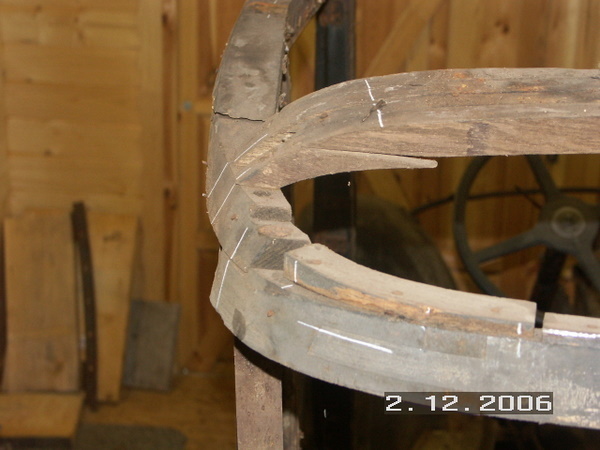 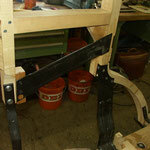 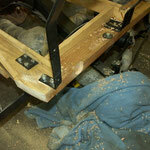 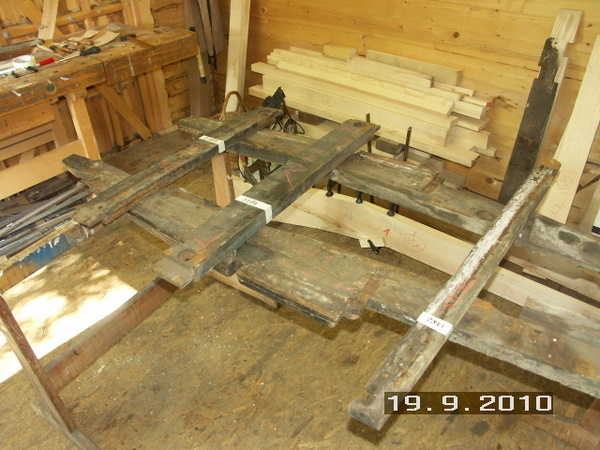 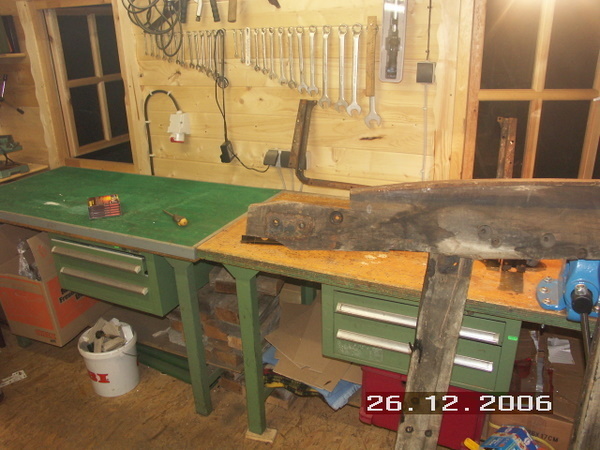 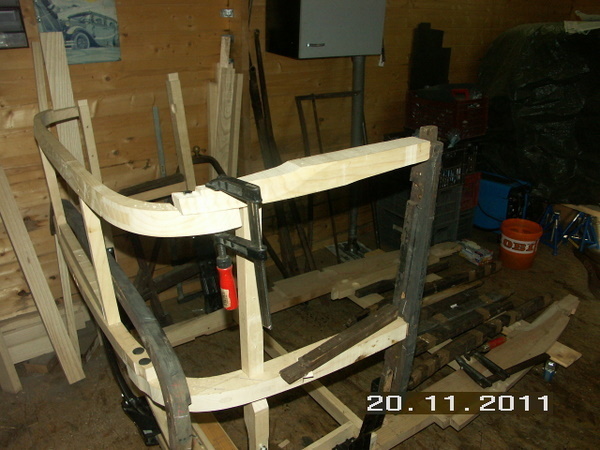 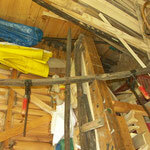 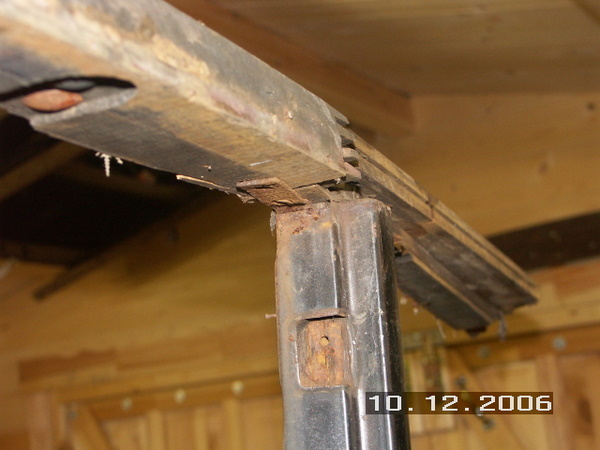 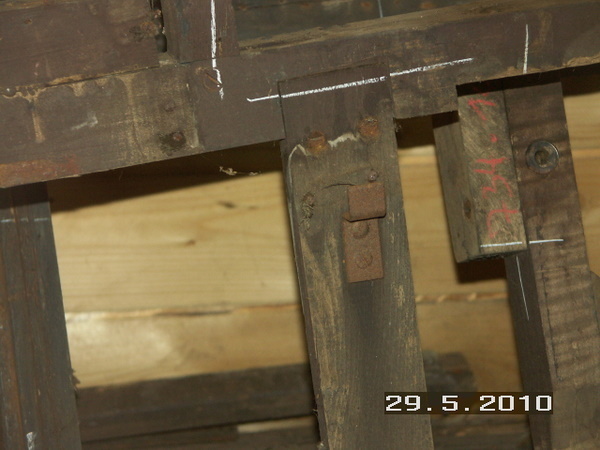 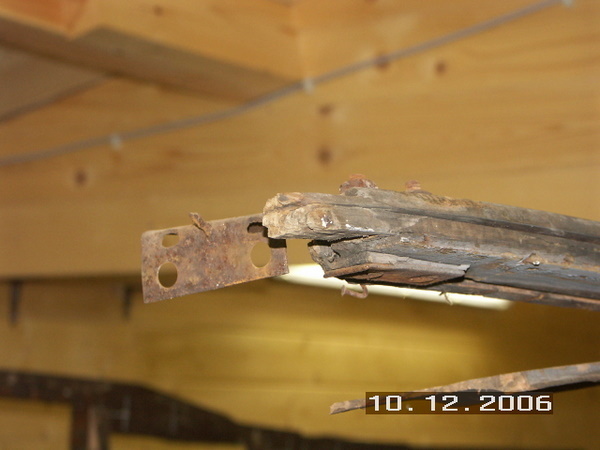 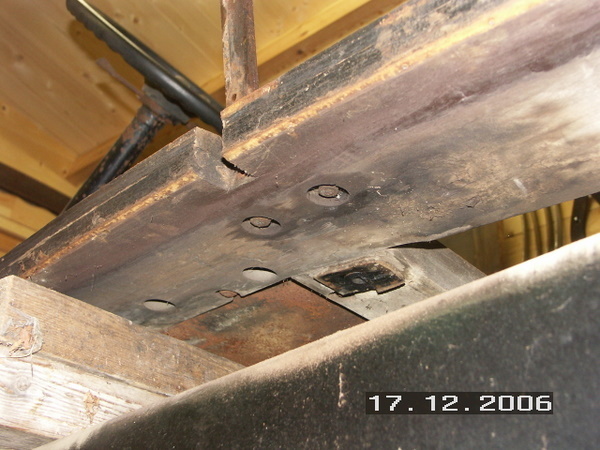 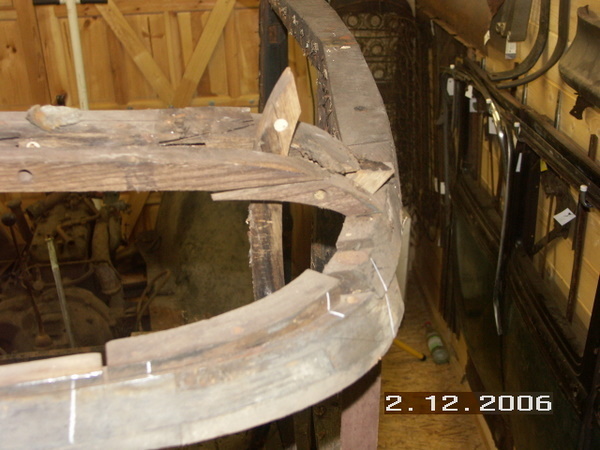 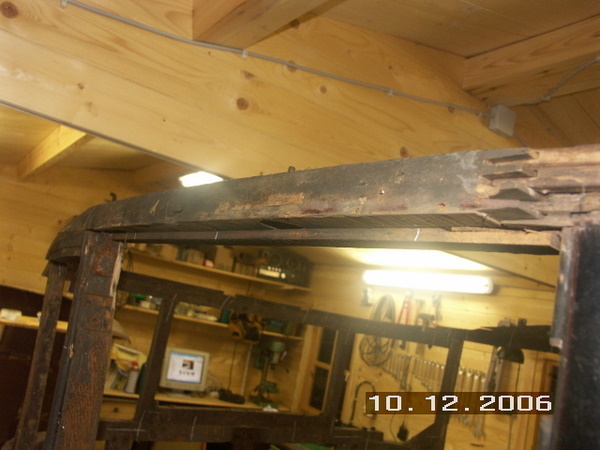 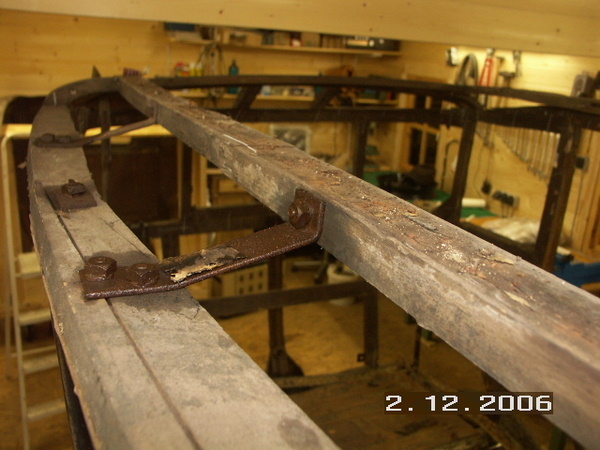 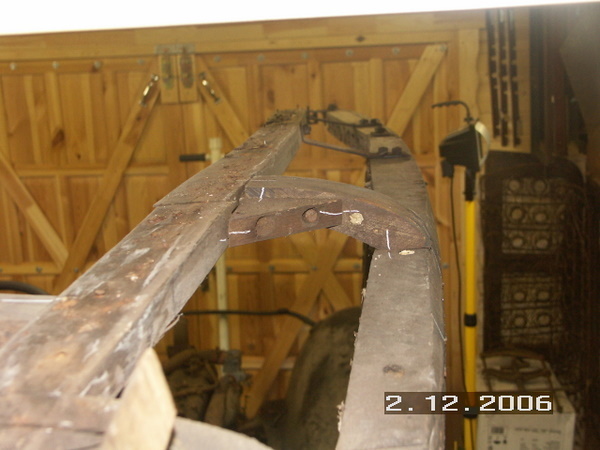 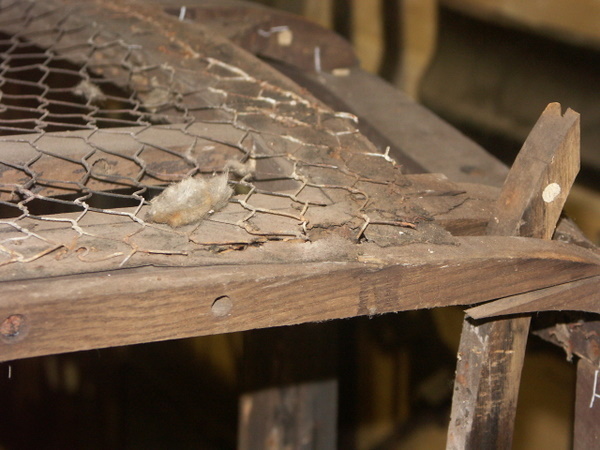 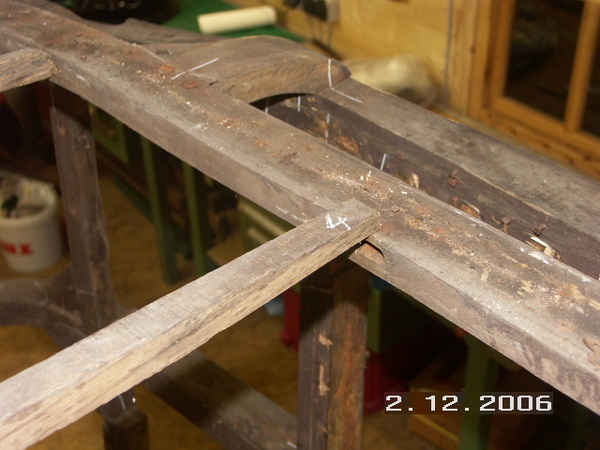 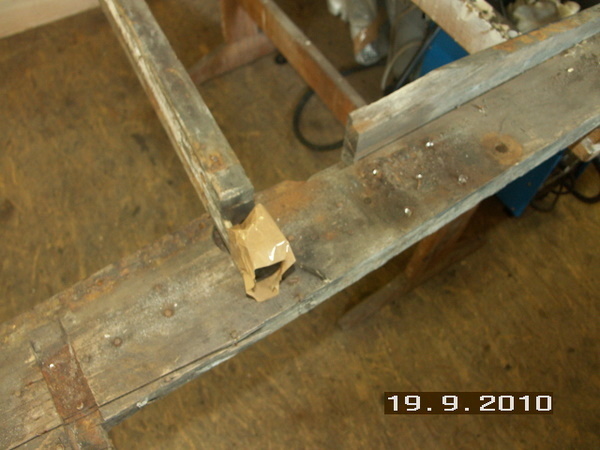 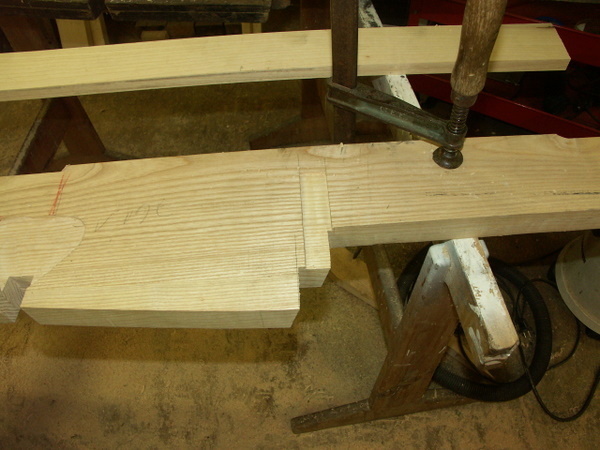 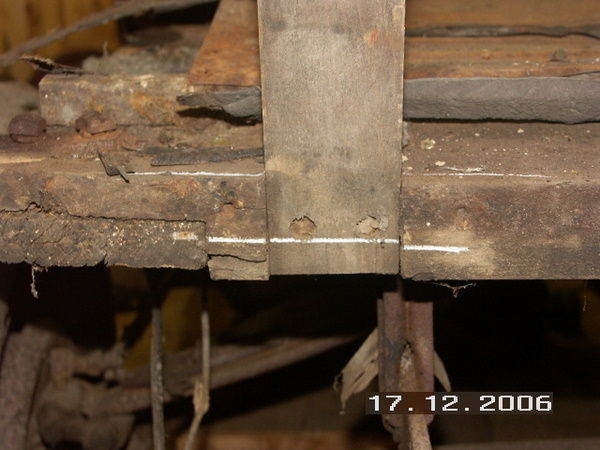 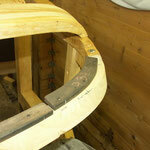 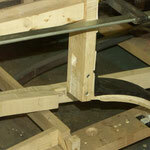 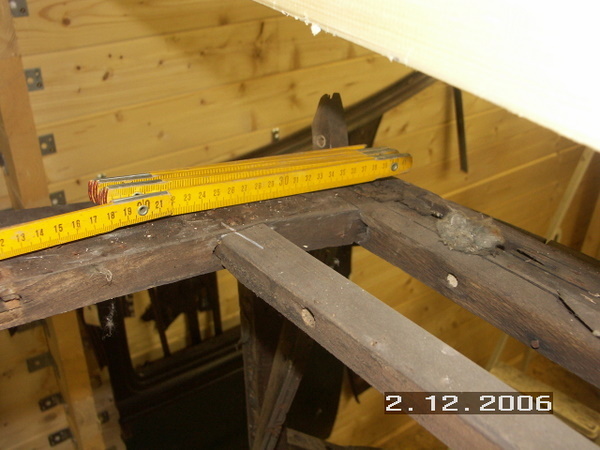 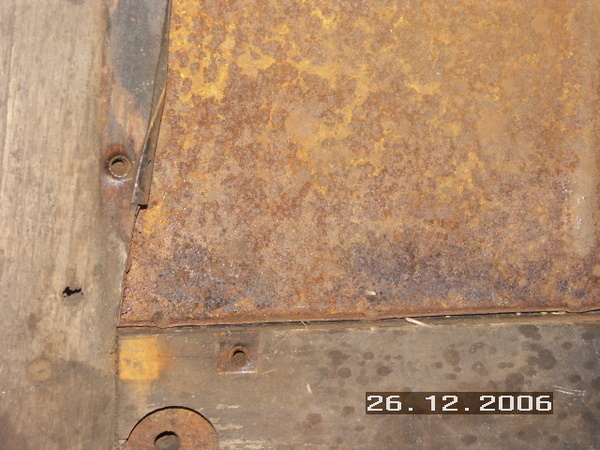 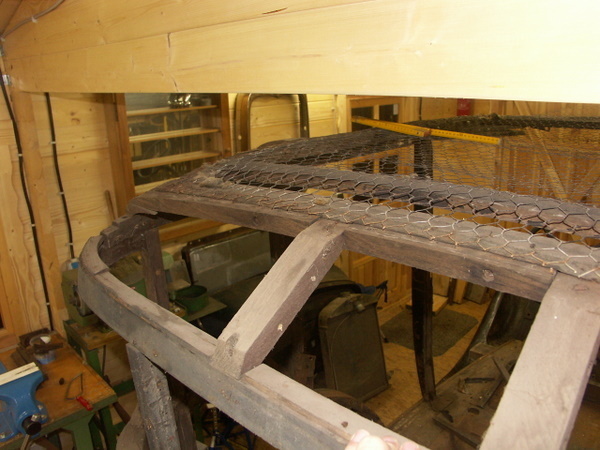 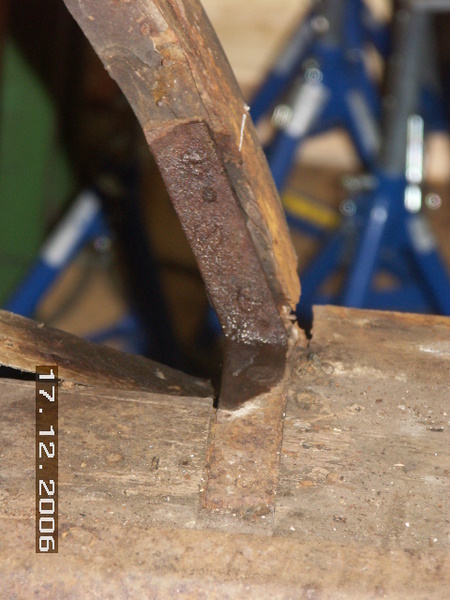 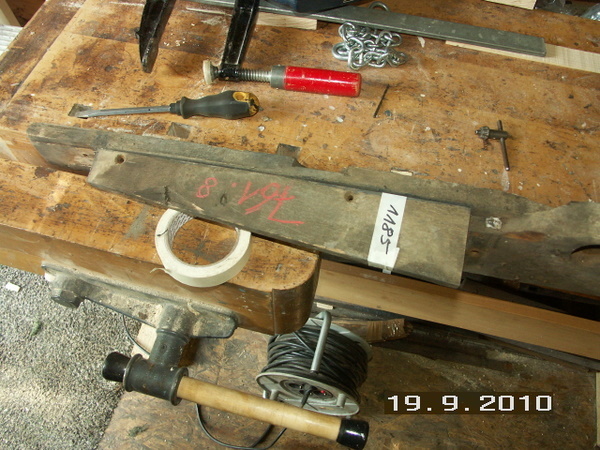 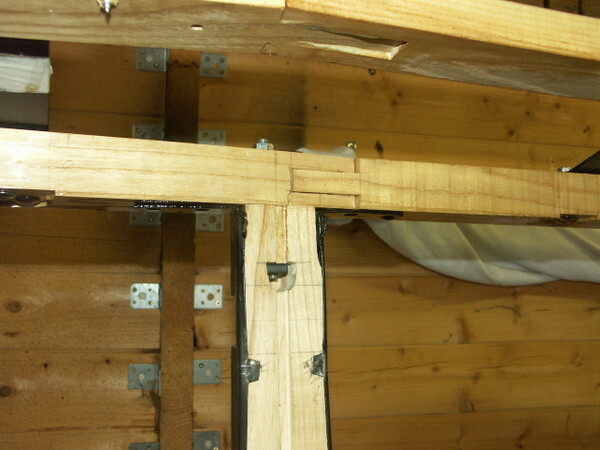 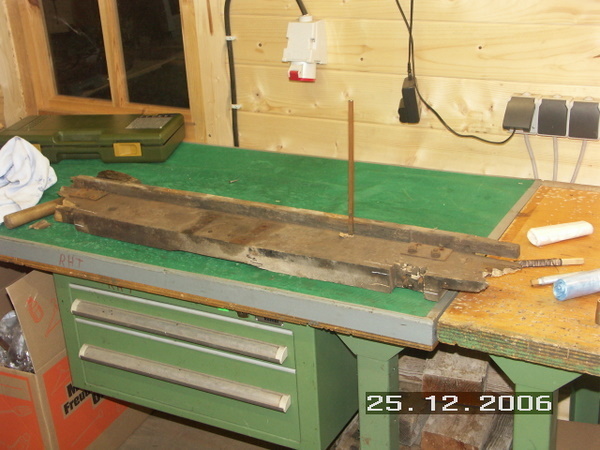 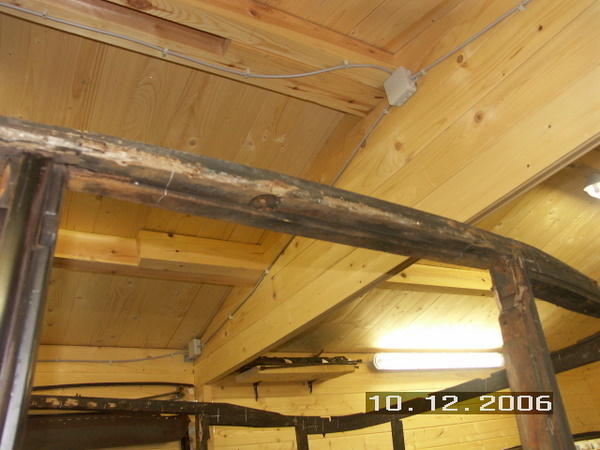 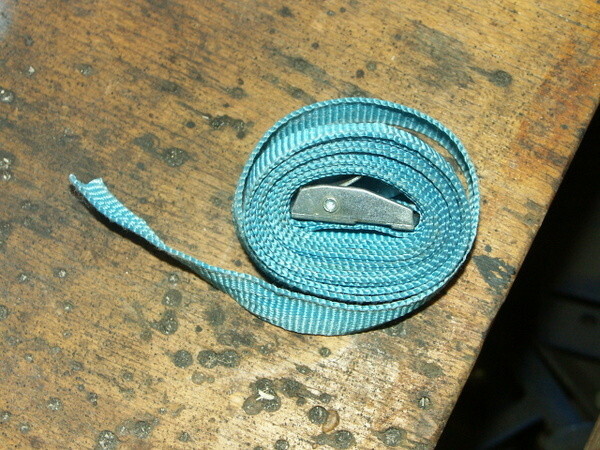 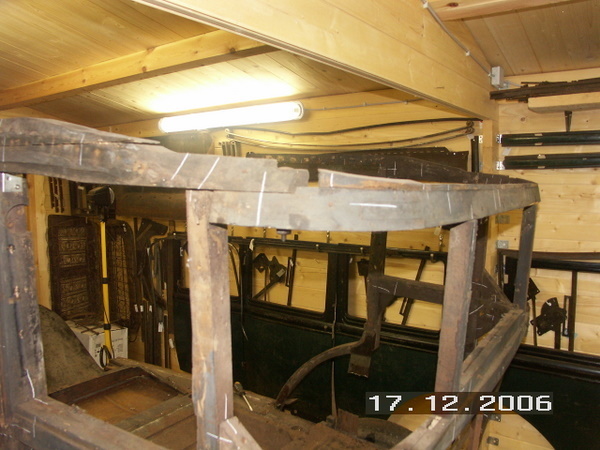 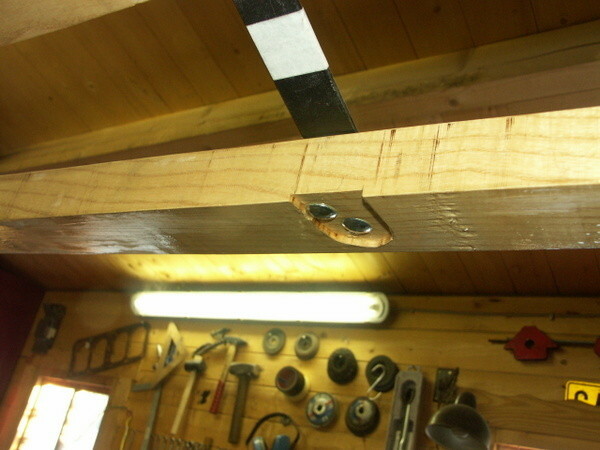 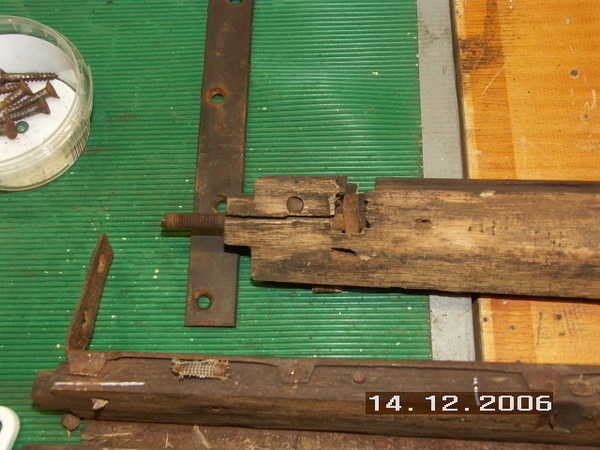 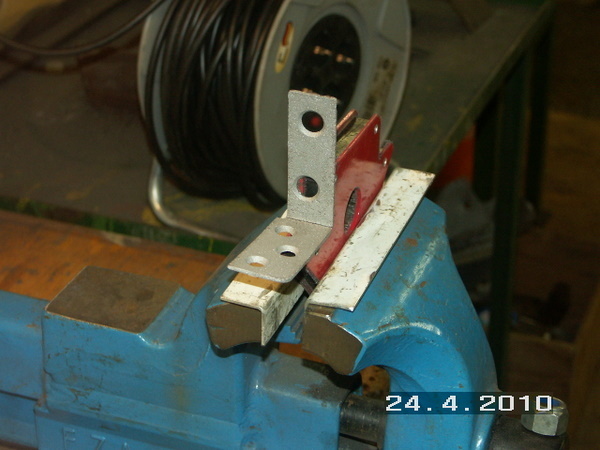 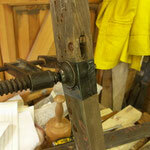 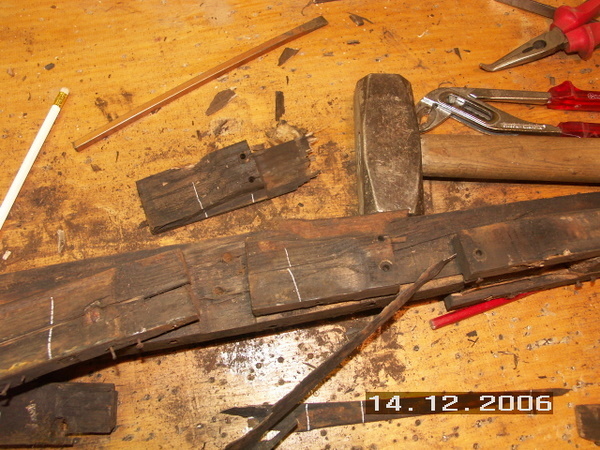 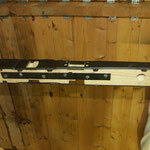 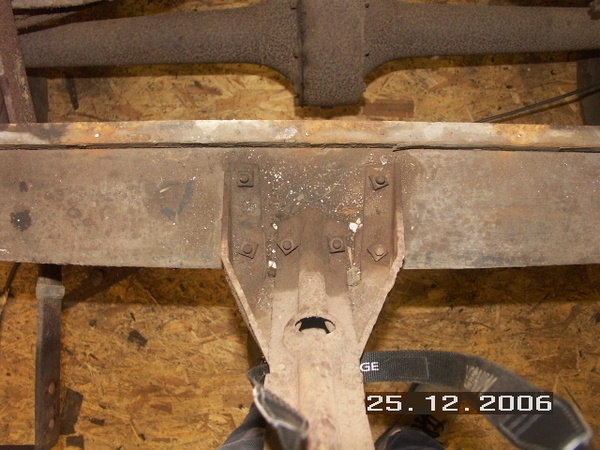 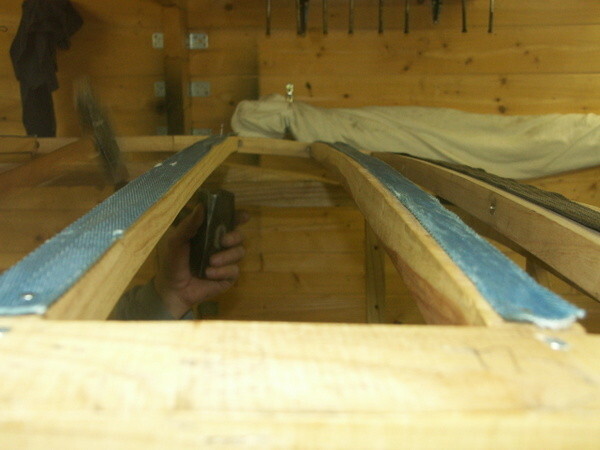 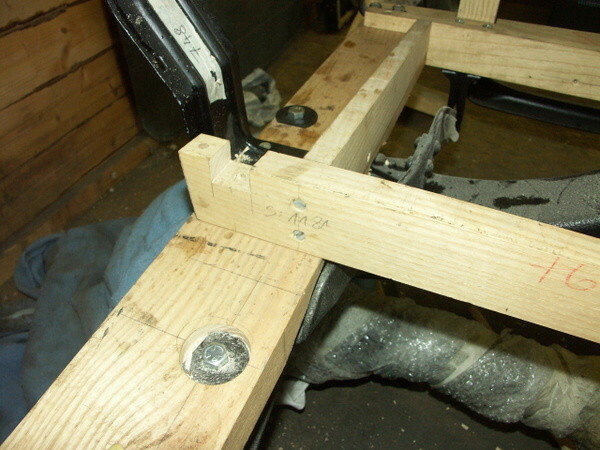 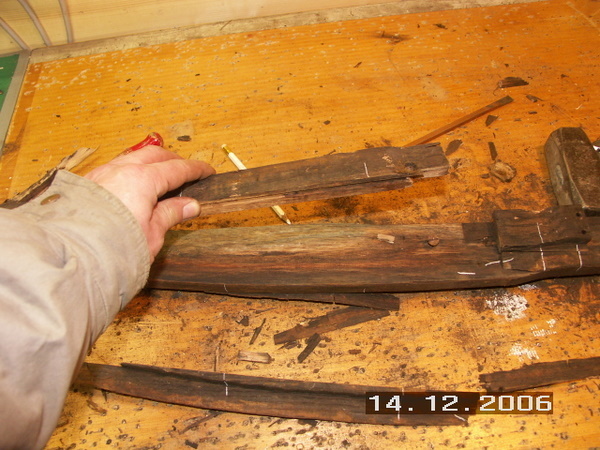 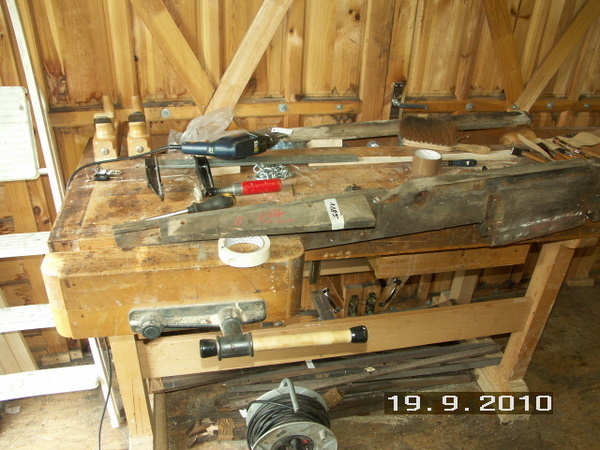 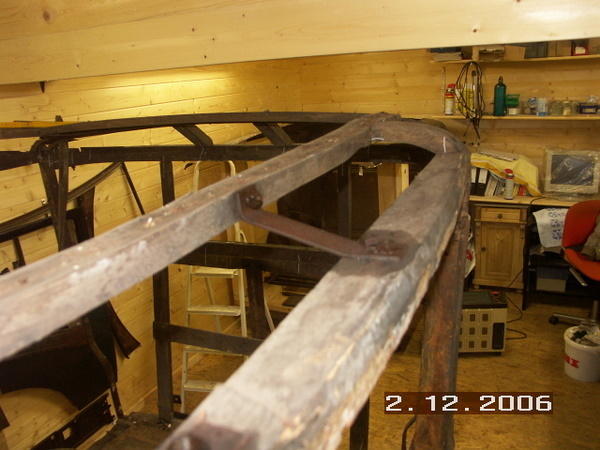 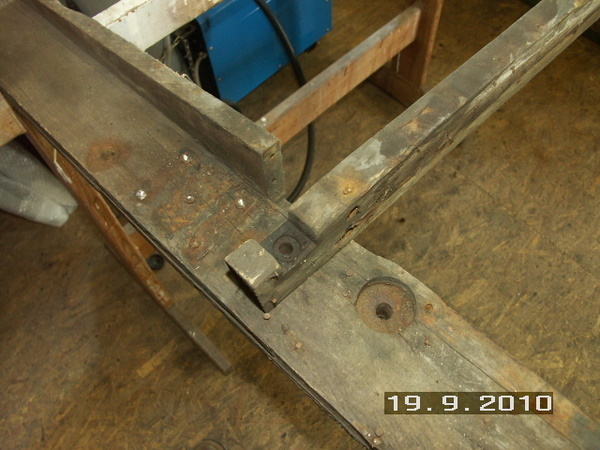 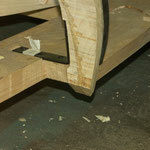 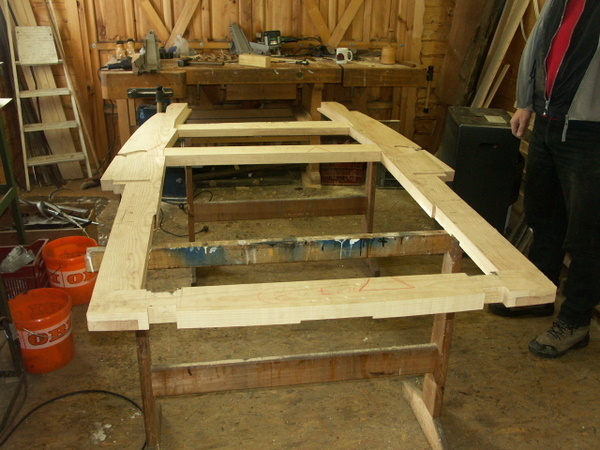 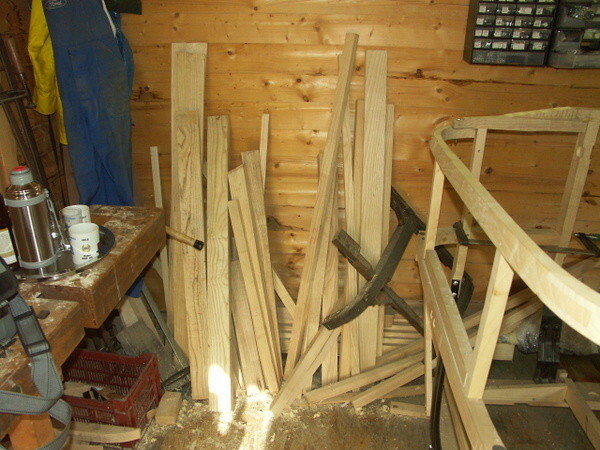 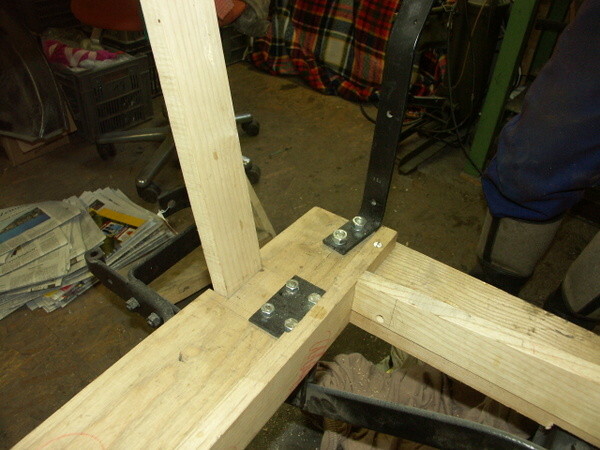 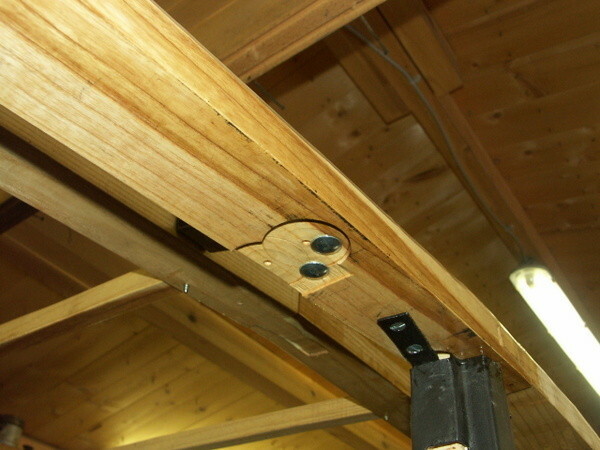 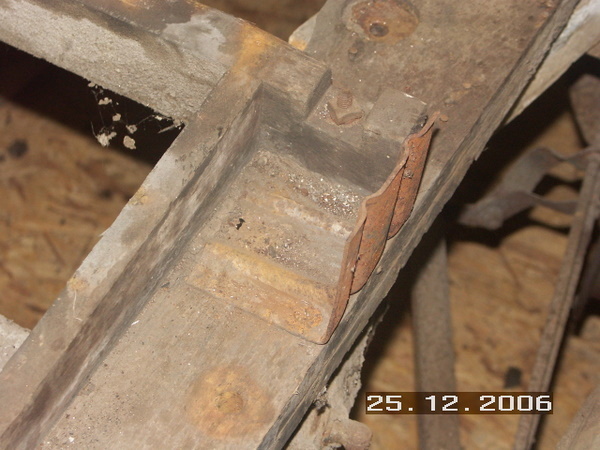 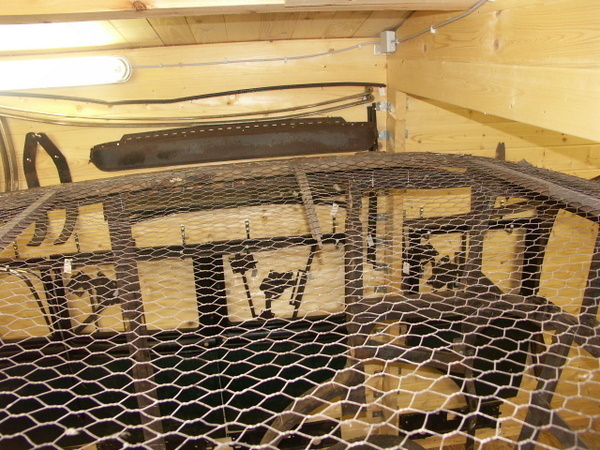 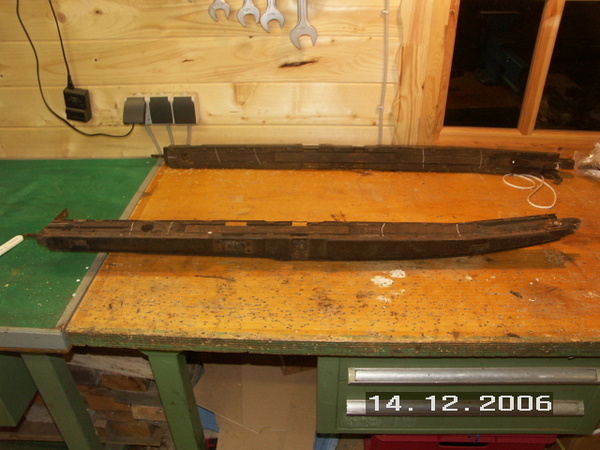 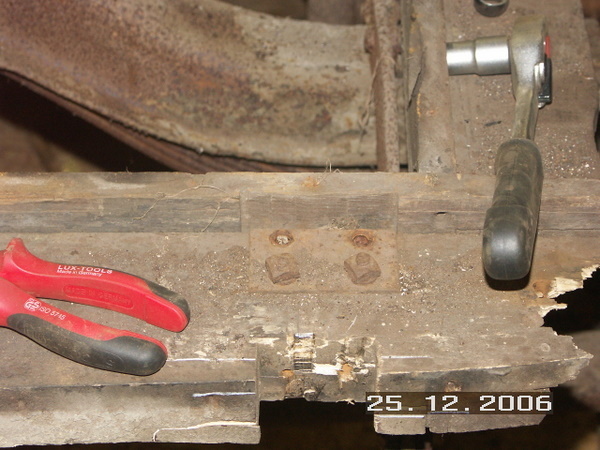 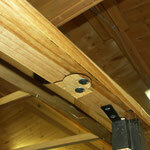 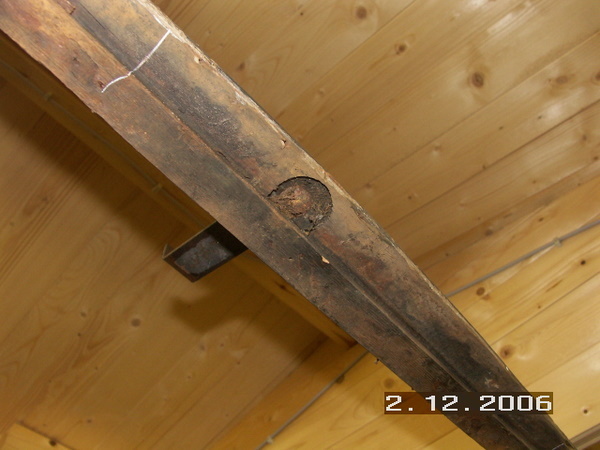 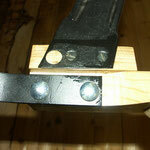 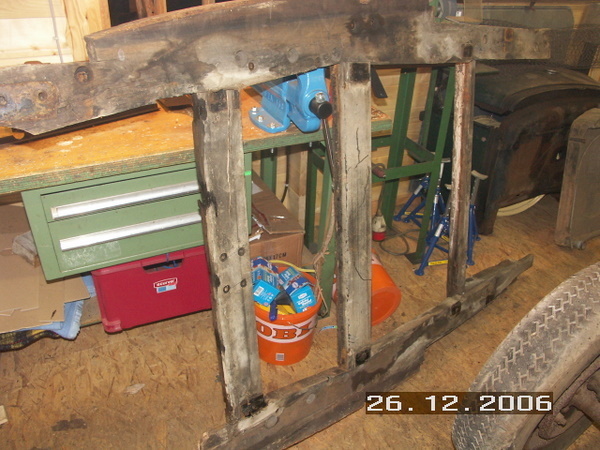 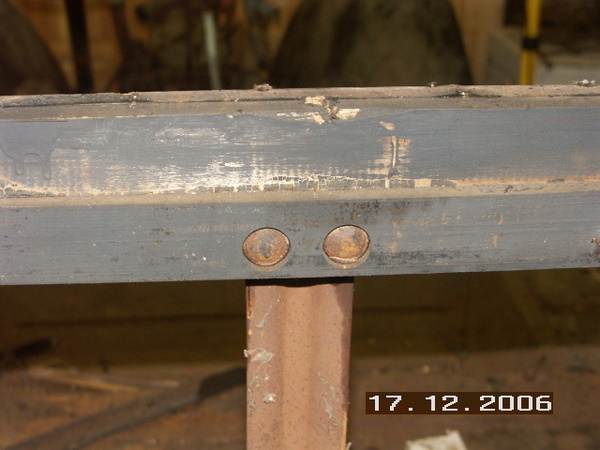 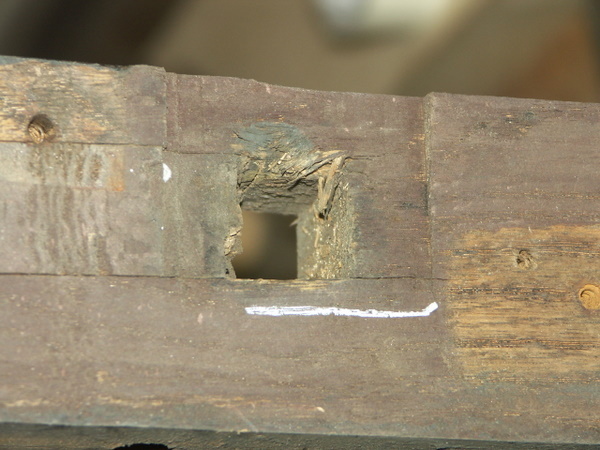 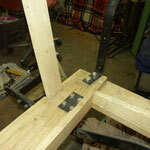 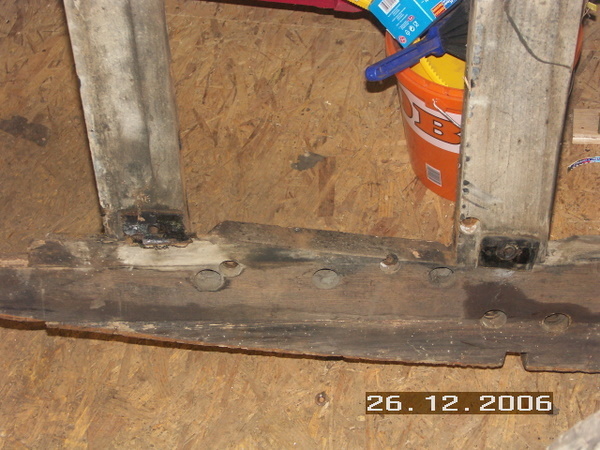 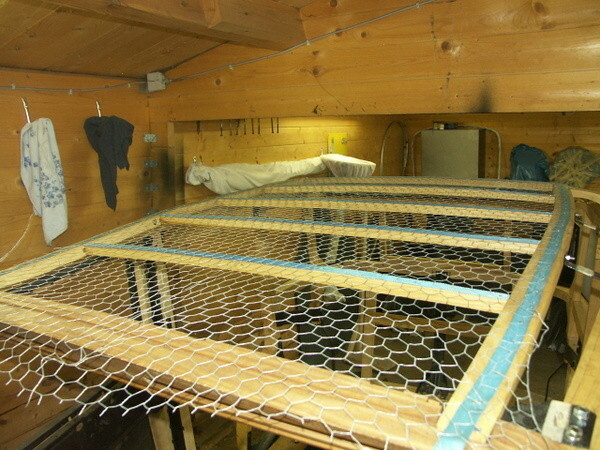 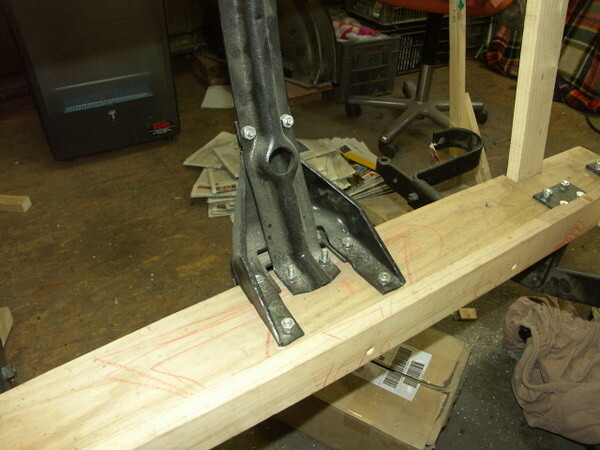 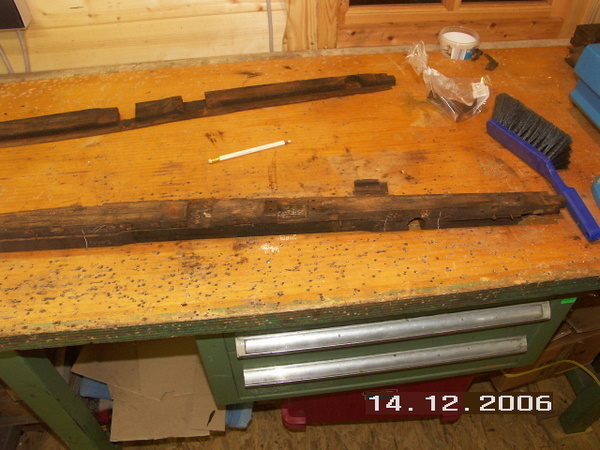 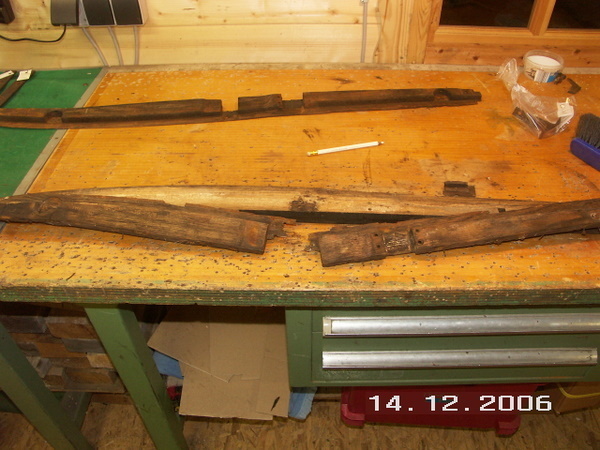 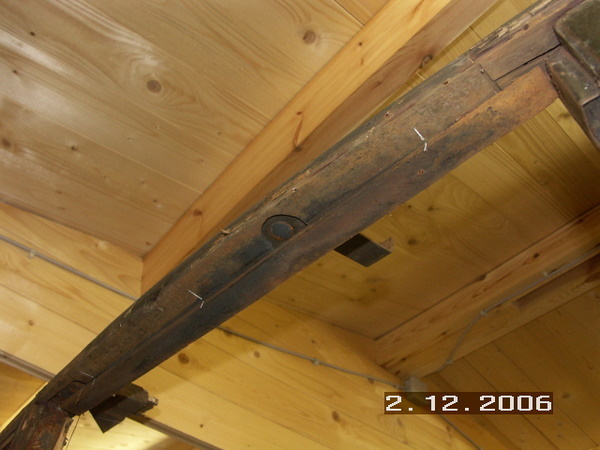 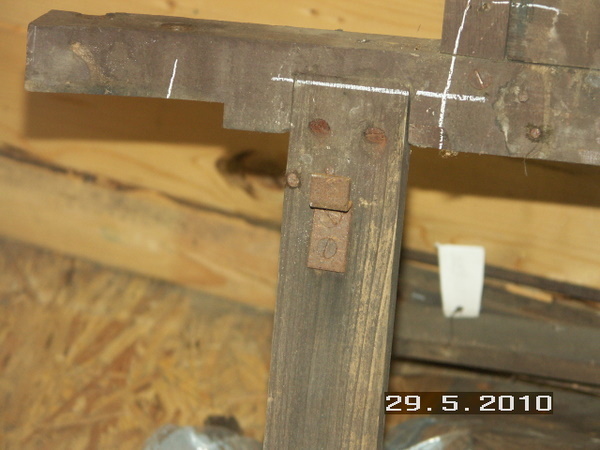 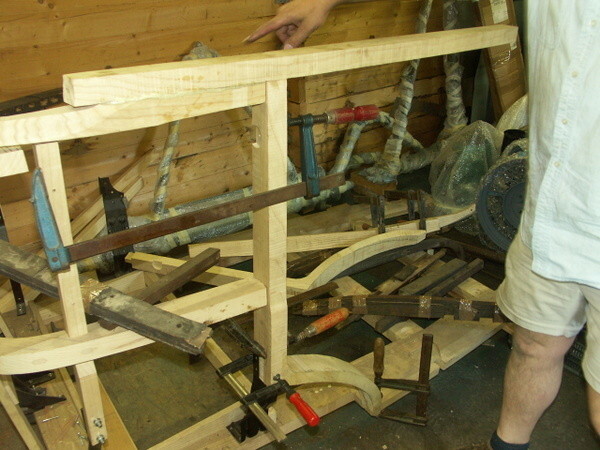 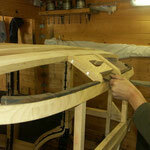 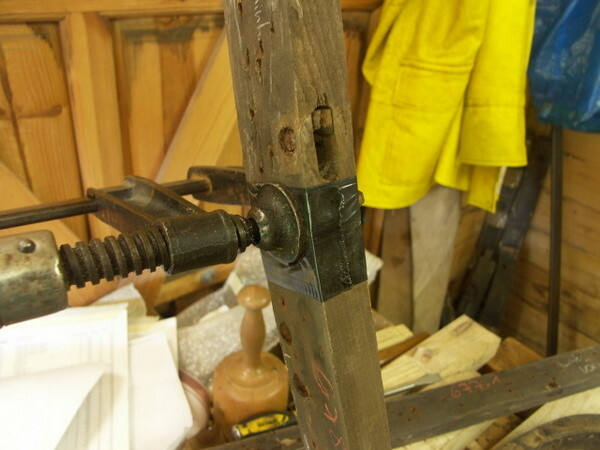 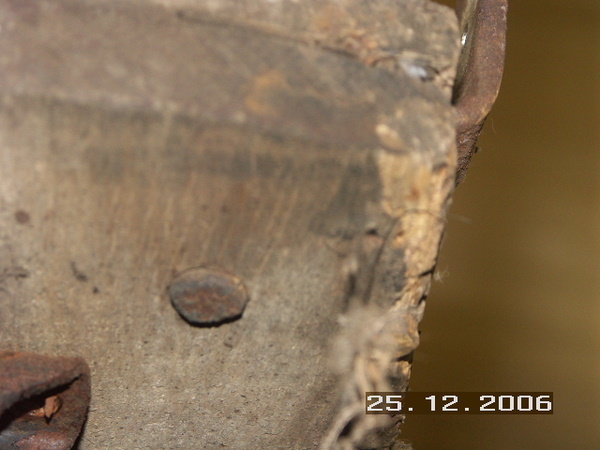 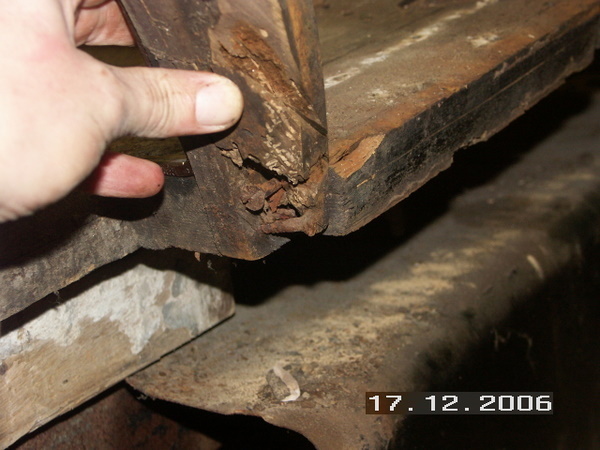 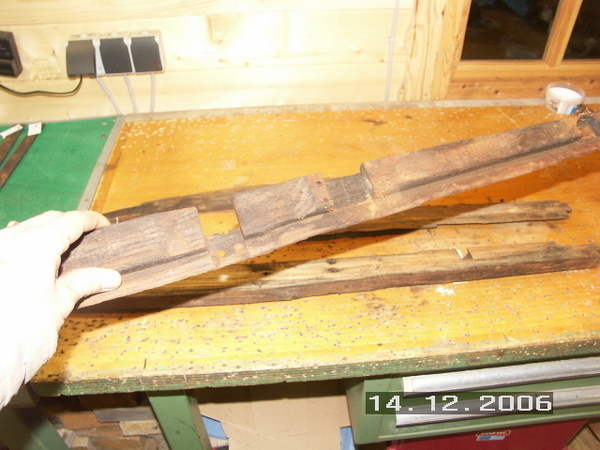 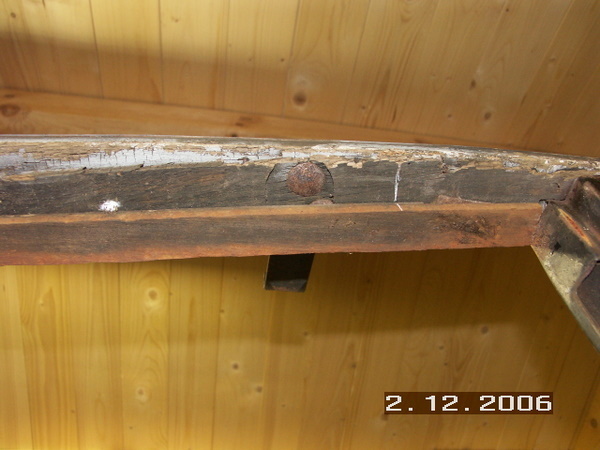 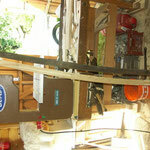 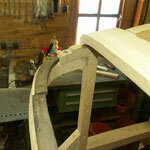 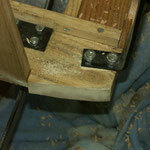 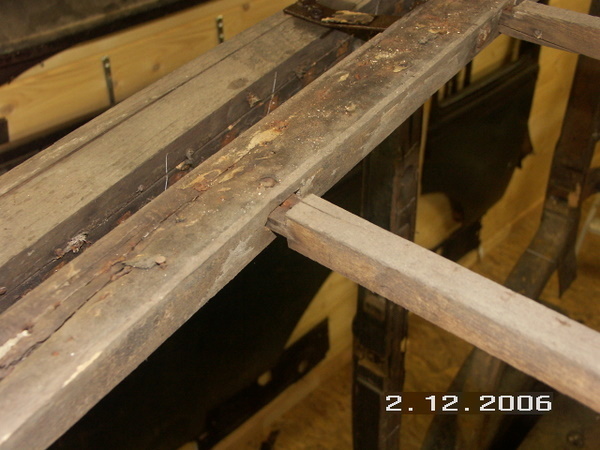 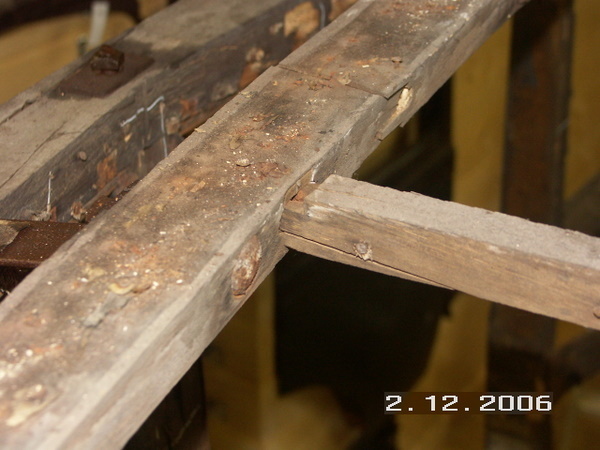 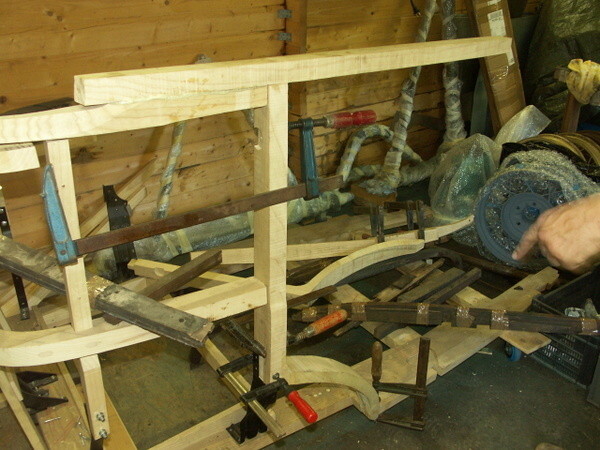 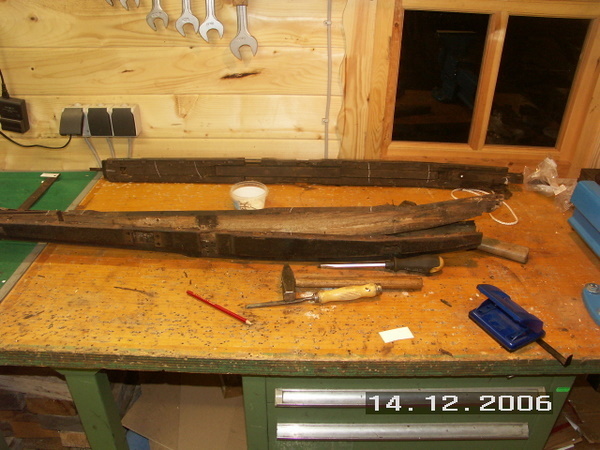 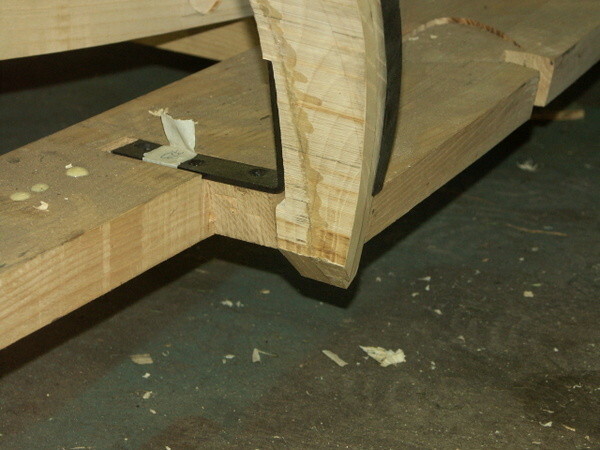 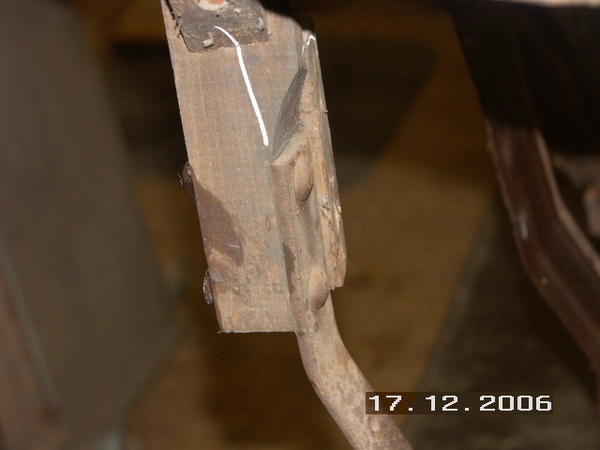 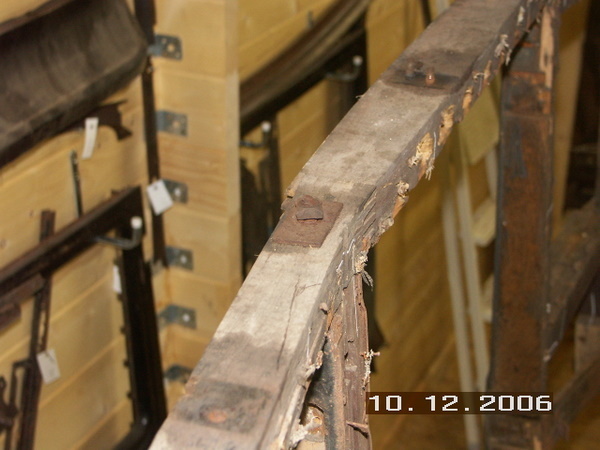 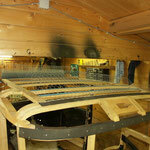 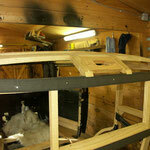 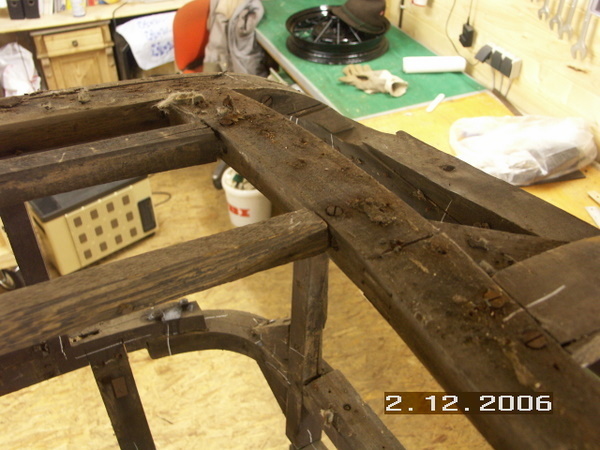 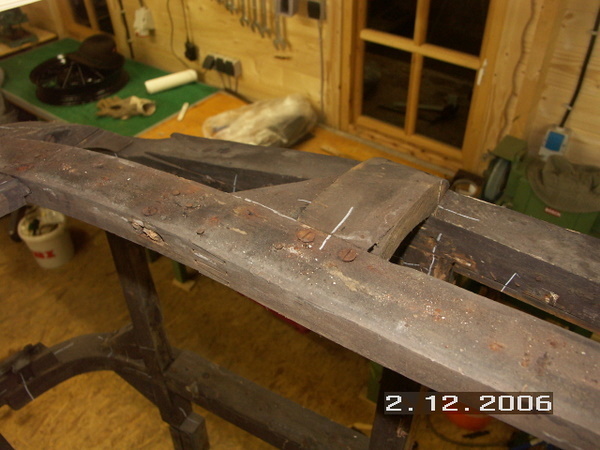 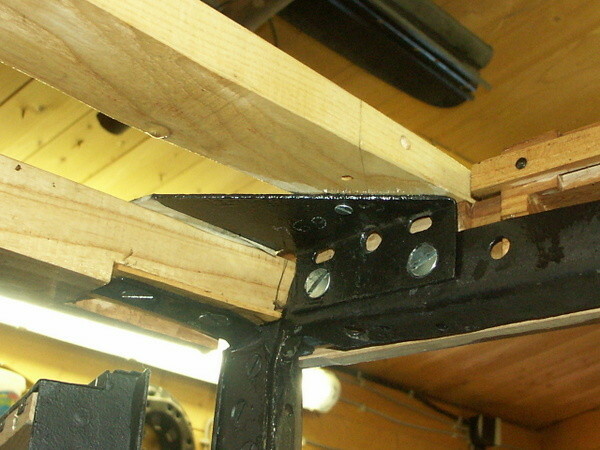 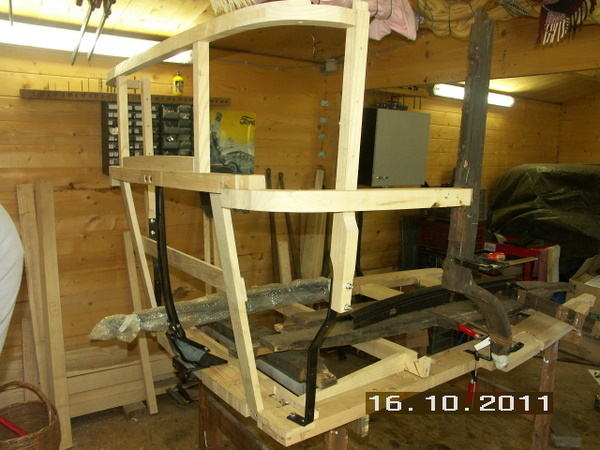 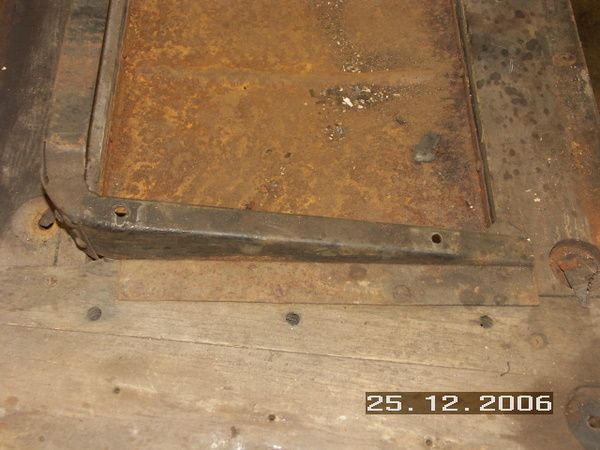 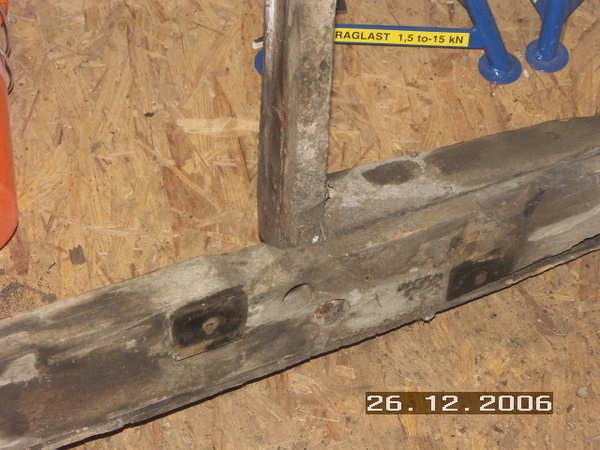 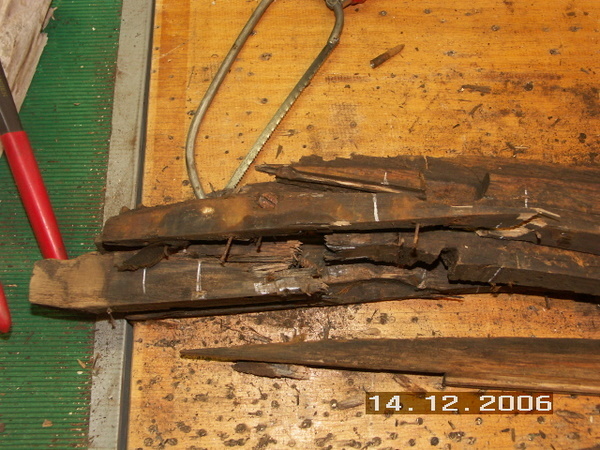 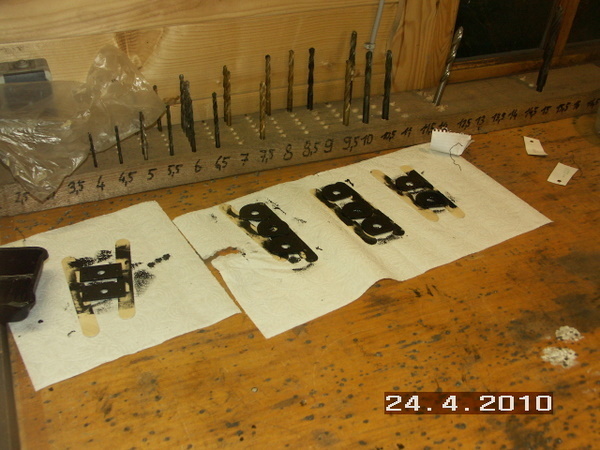 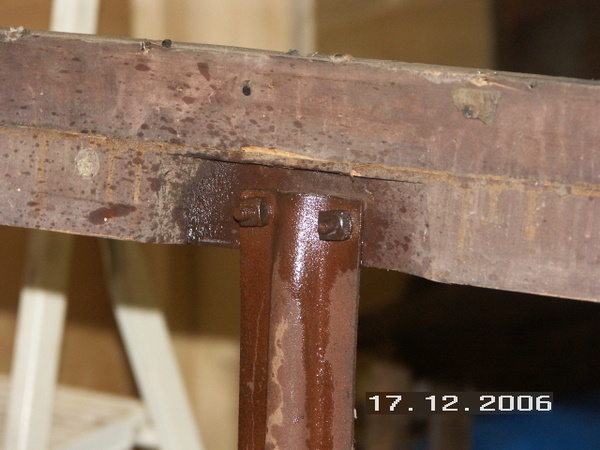 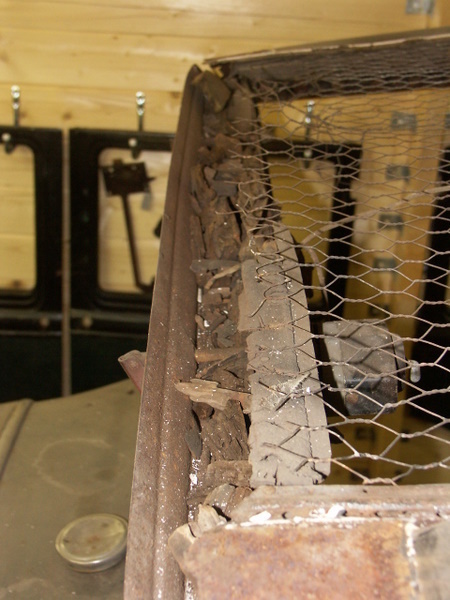 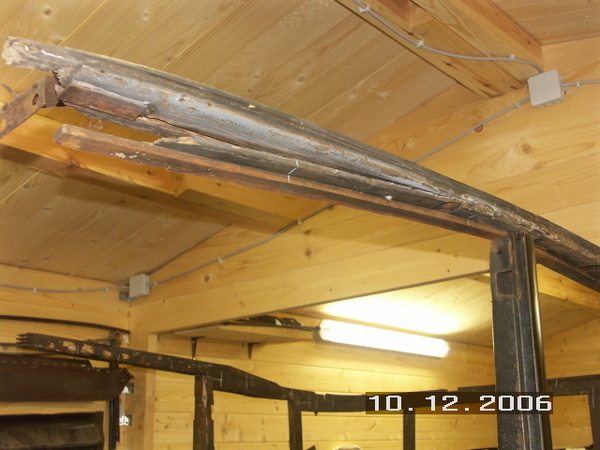 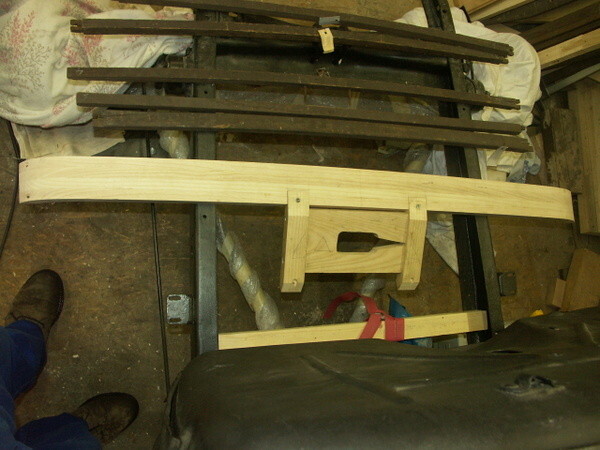 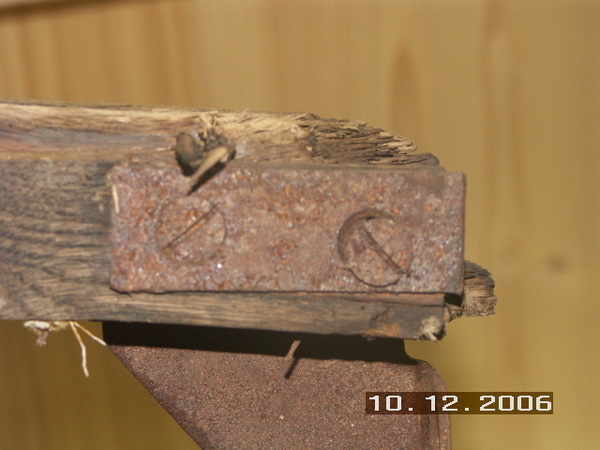 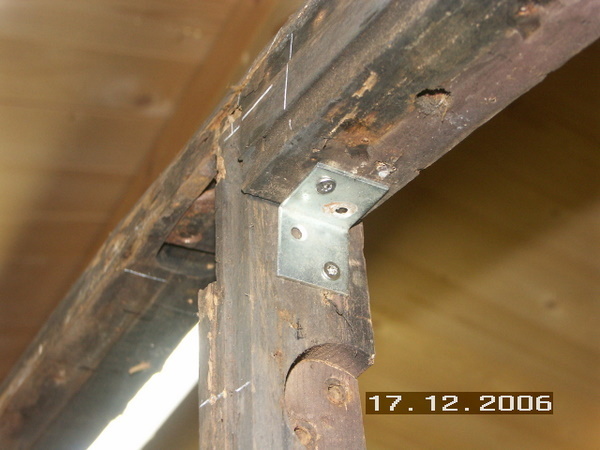 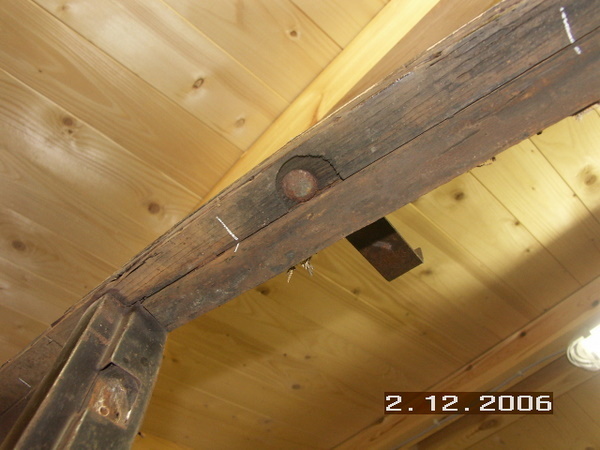 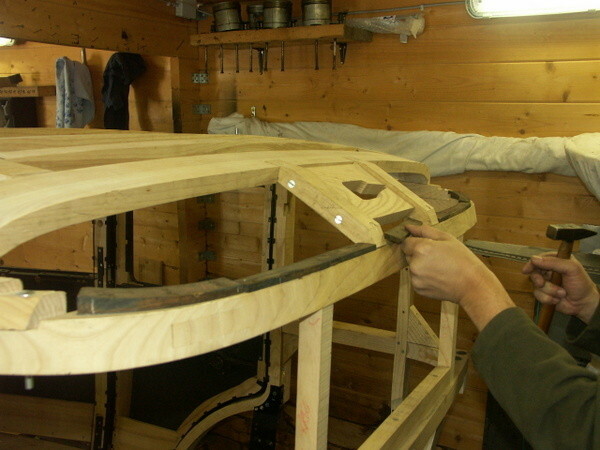 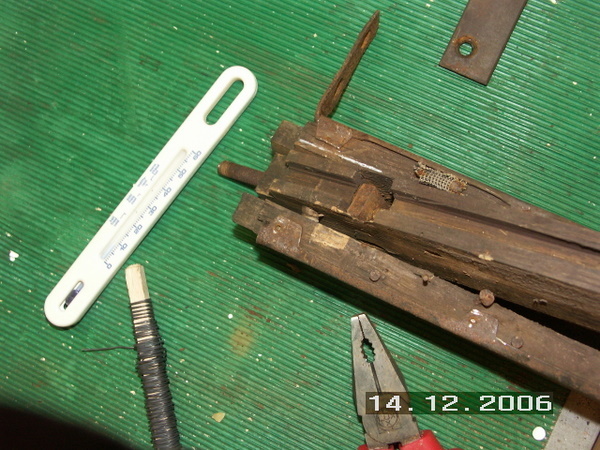 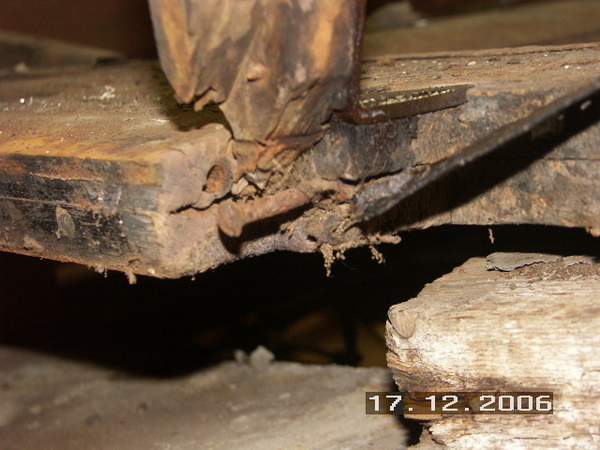 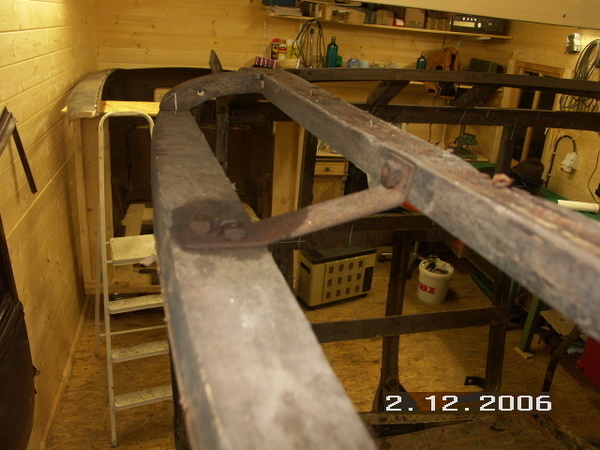 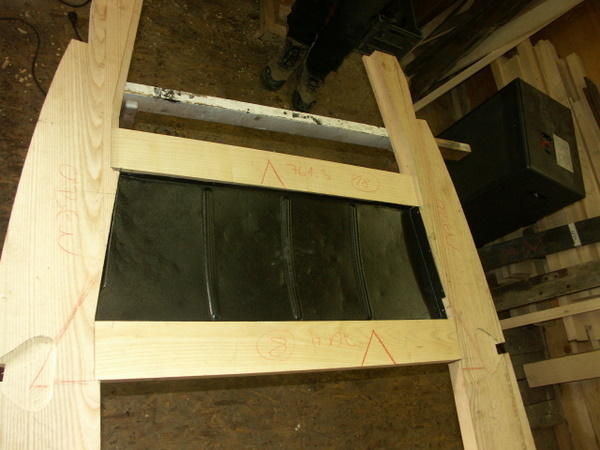 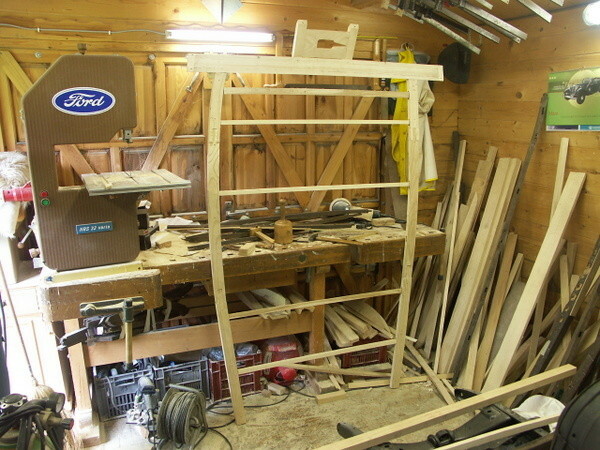 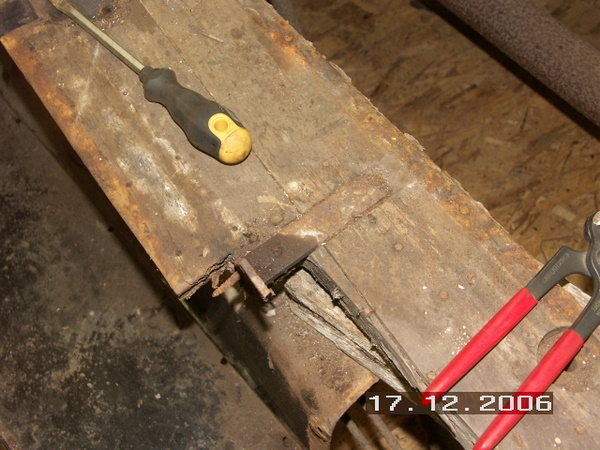 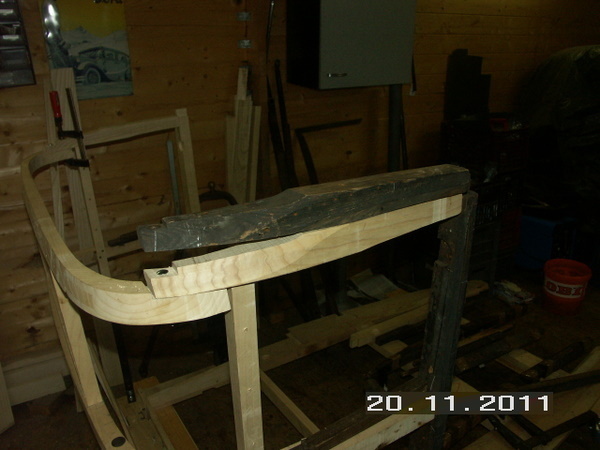 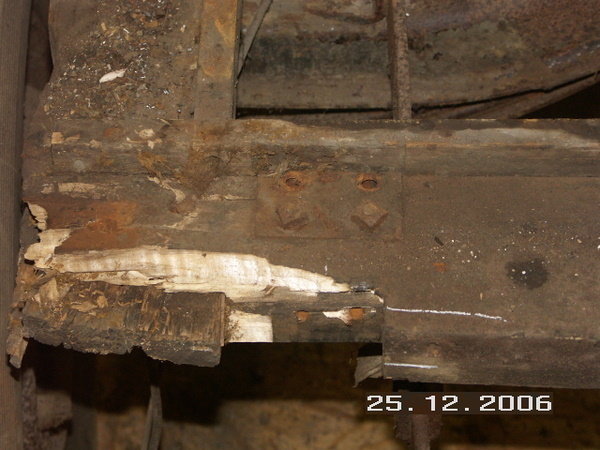 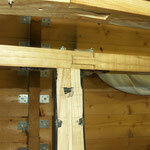 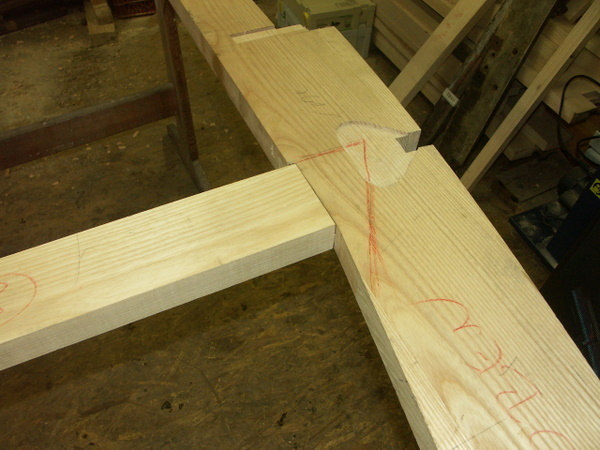 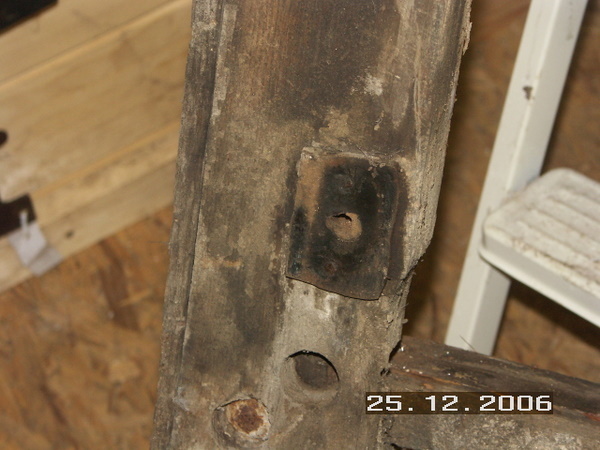 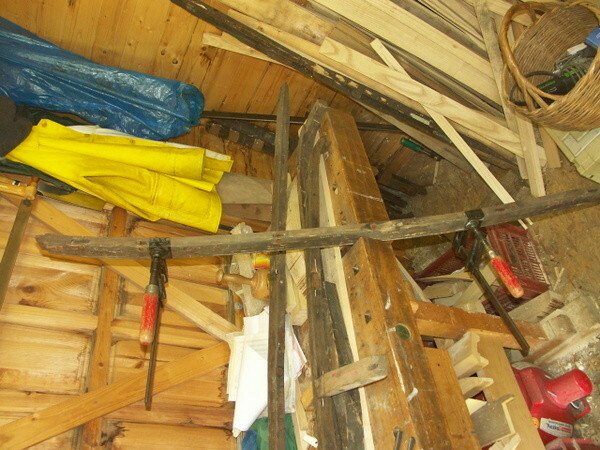 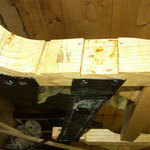 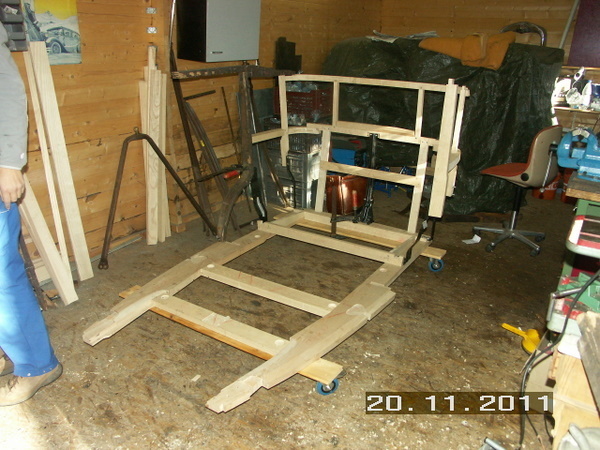 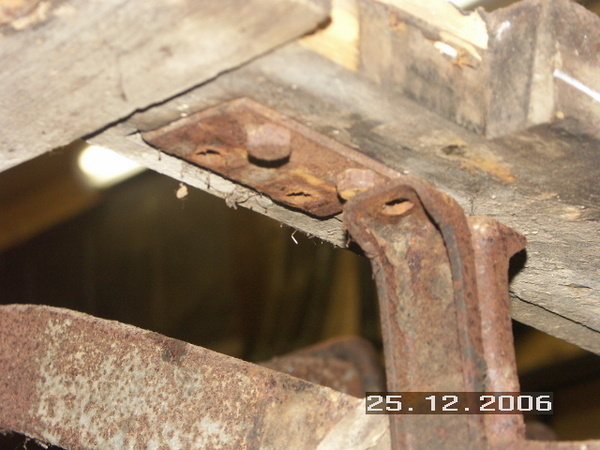 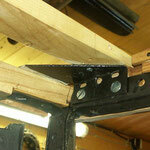 For copying we have installed a carpenters bench in our workshop.We add new photos, when further progress has been made. 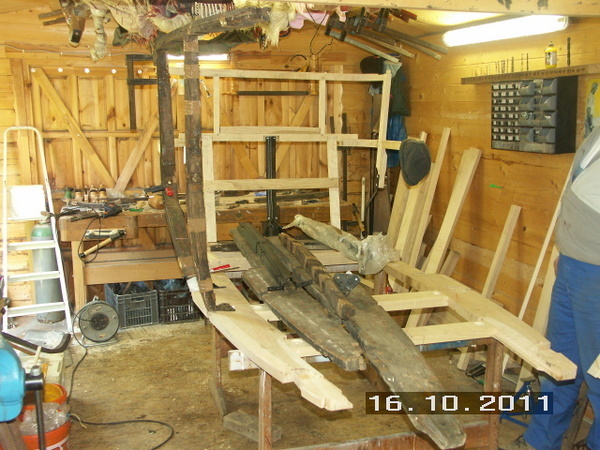 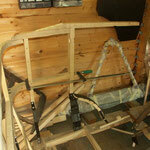 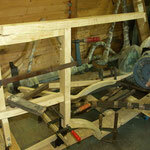 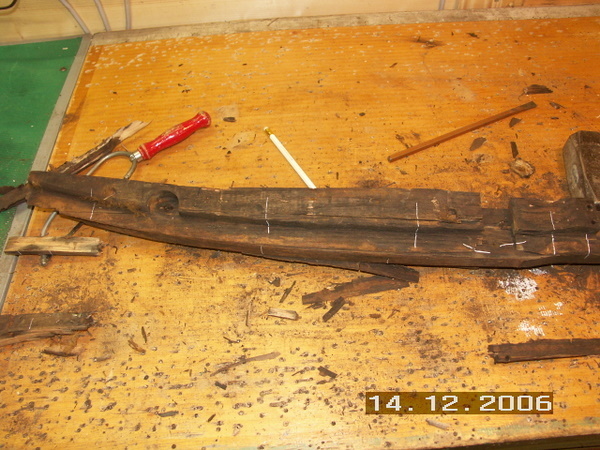 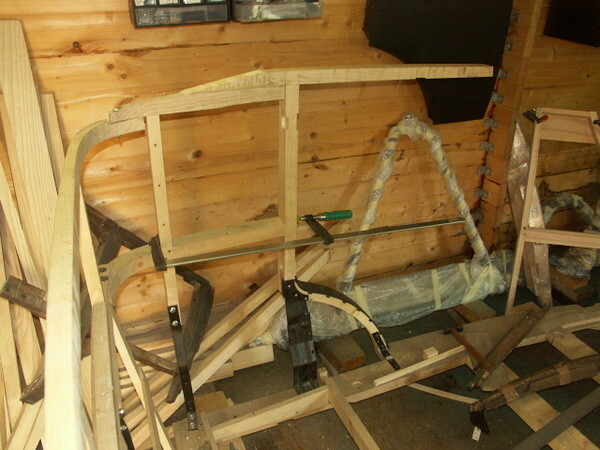 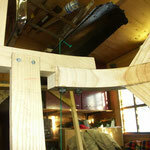 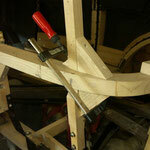 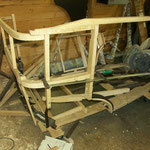 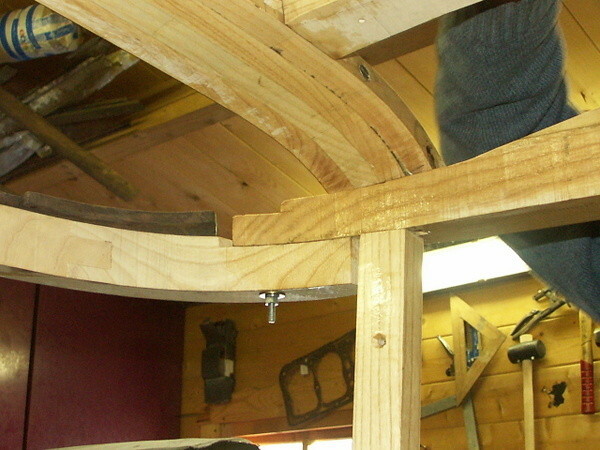 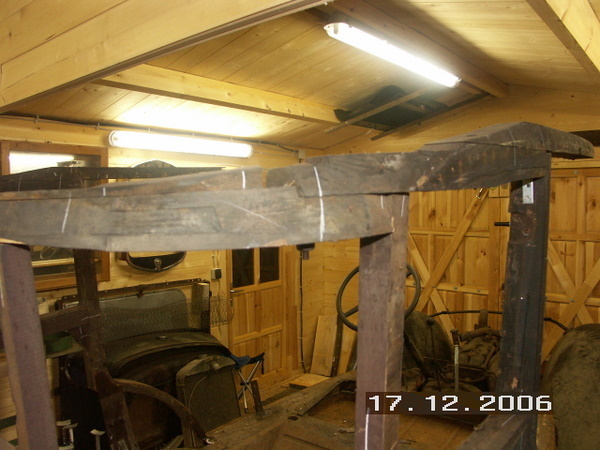 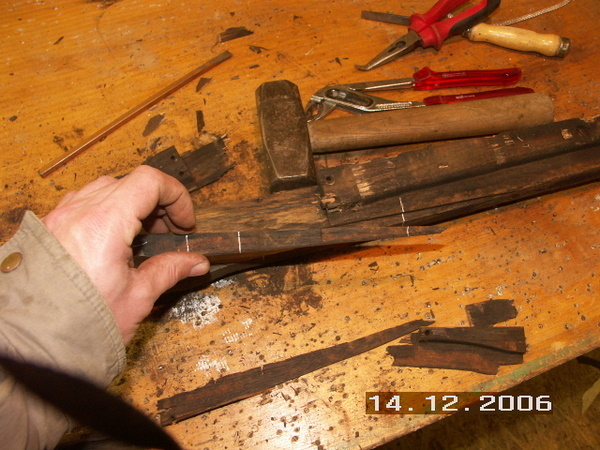 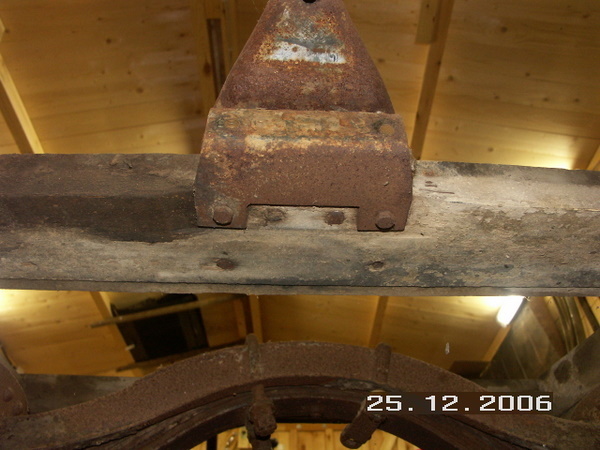 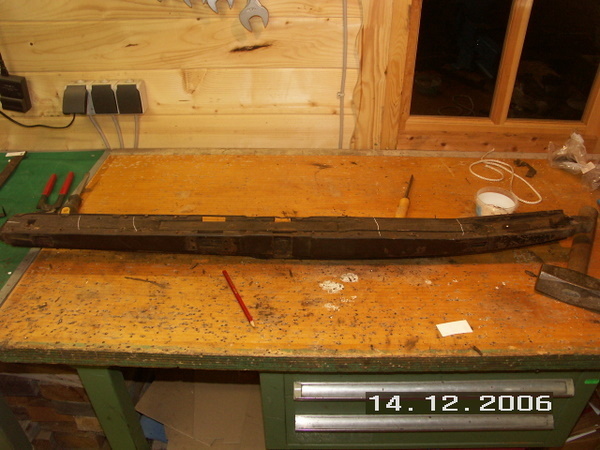 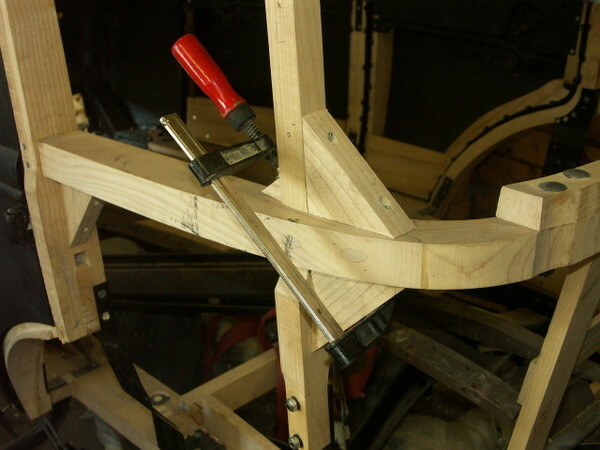 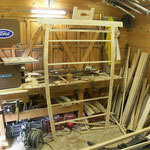 4th January 2014: The wooden sceleton is finished. 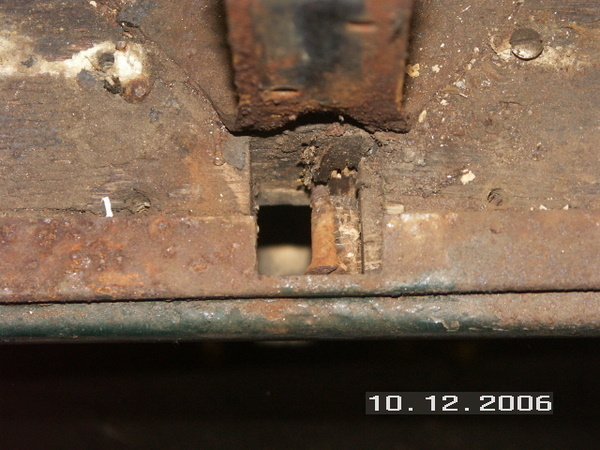 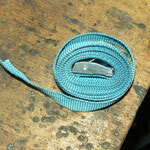 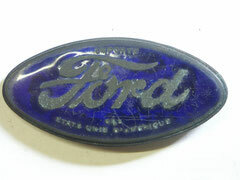 See detailed pictures on bottom of page. 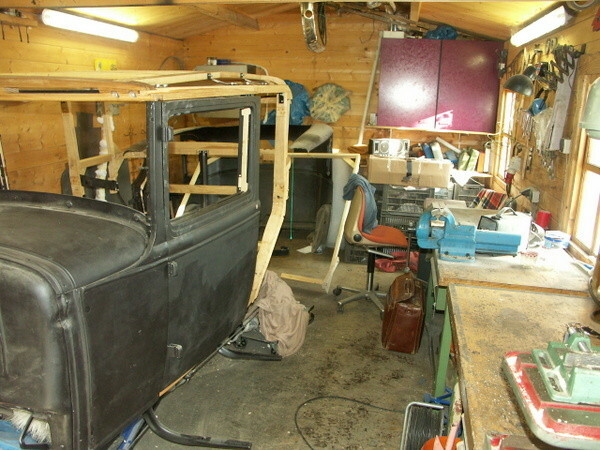 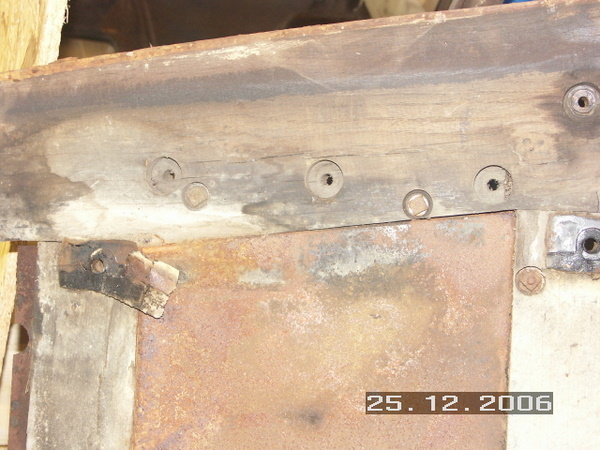 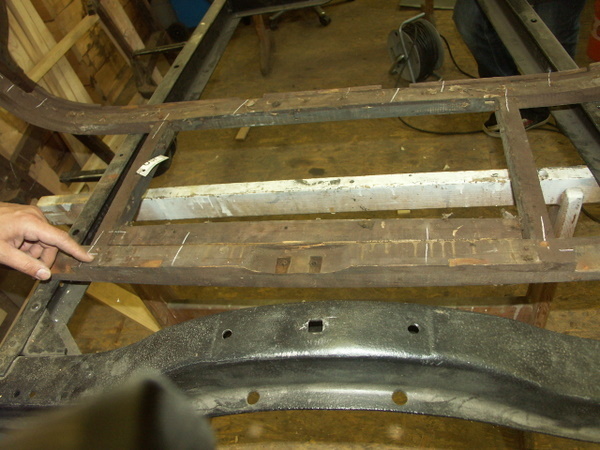 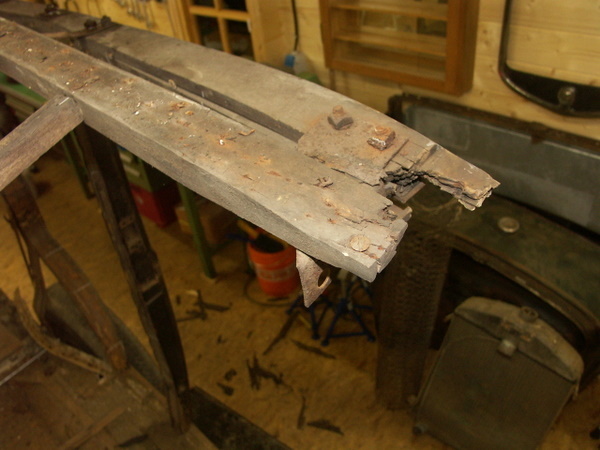 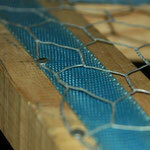 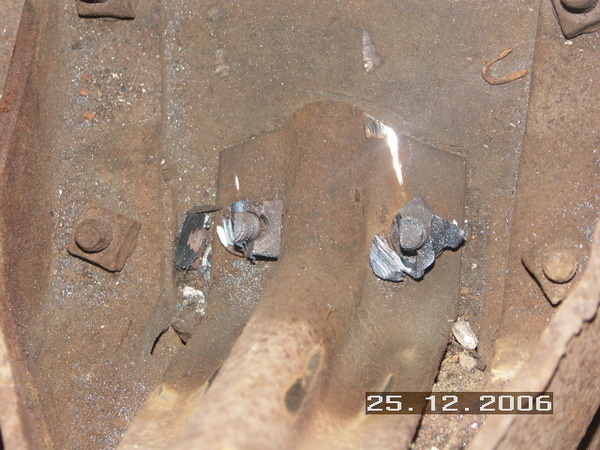 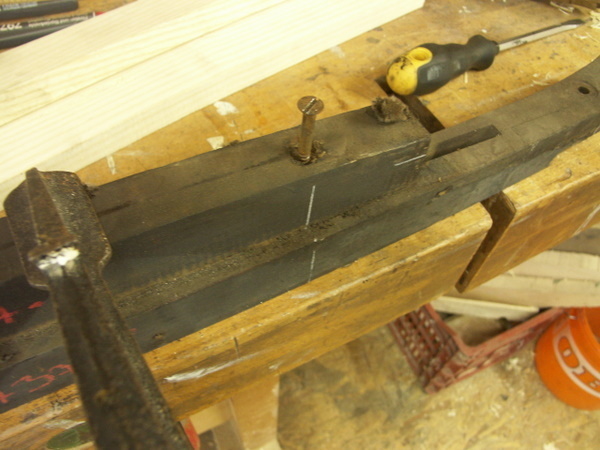 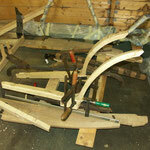 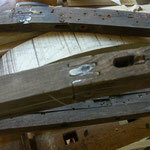 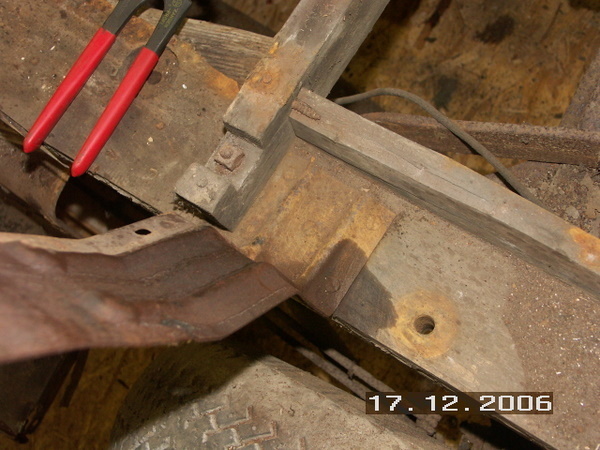 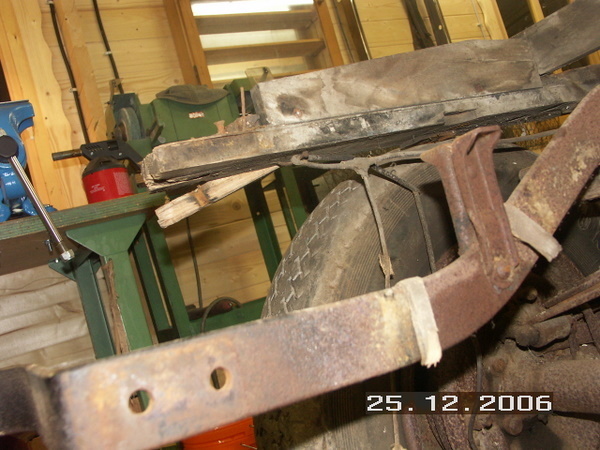 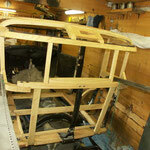 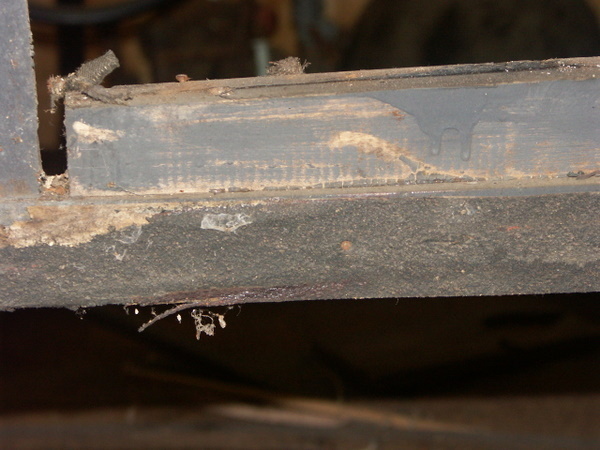 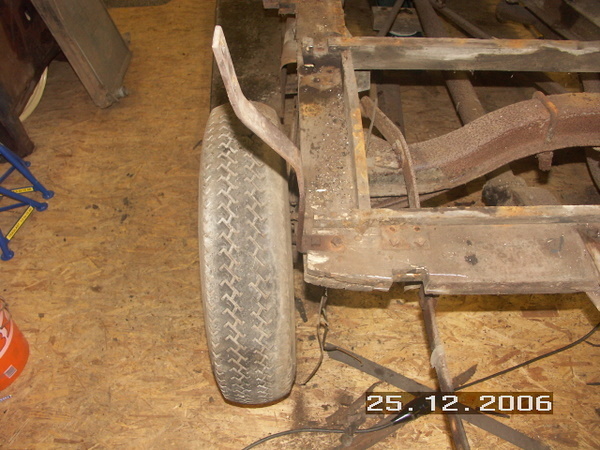 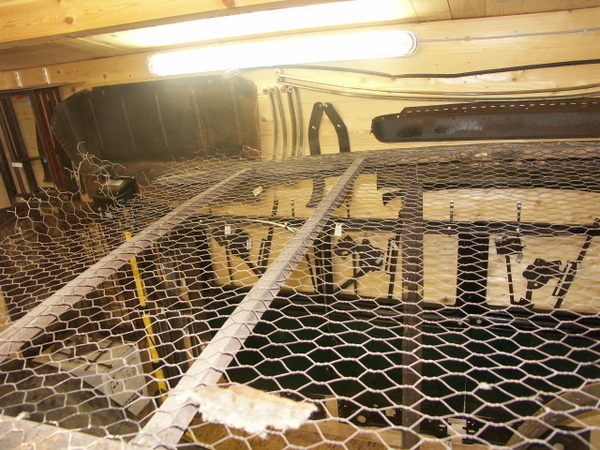 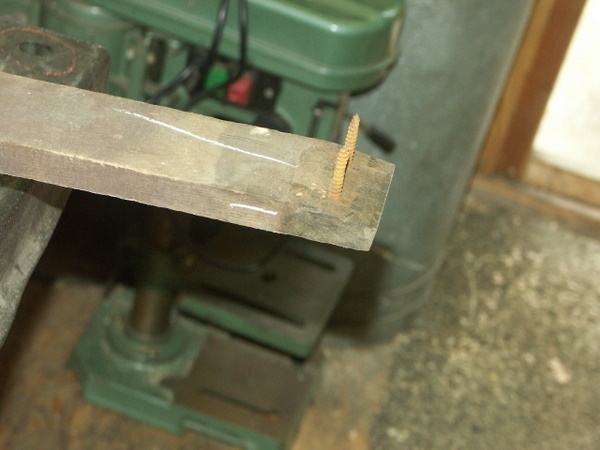 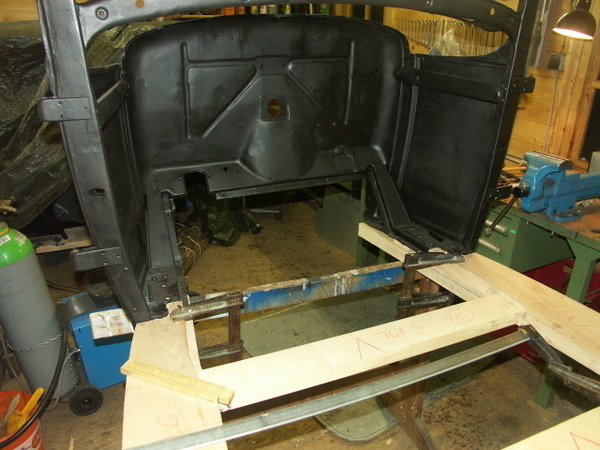 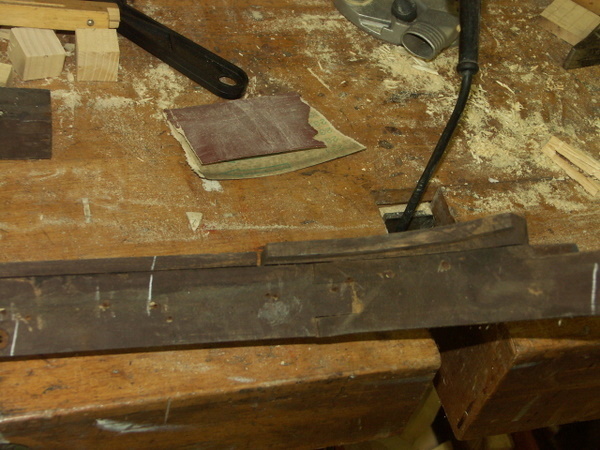 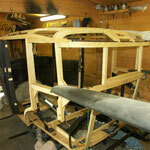 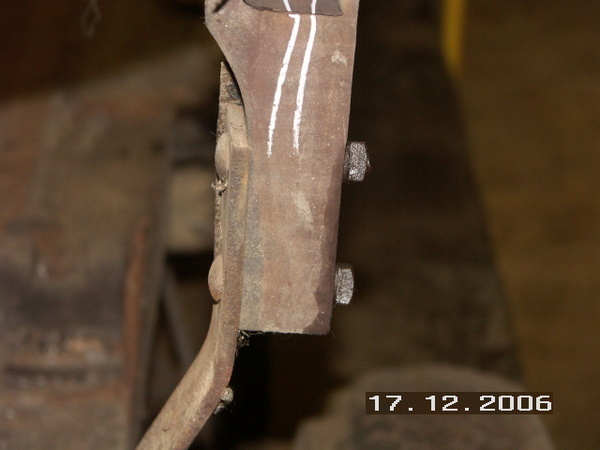 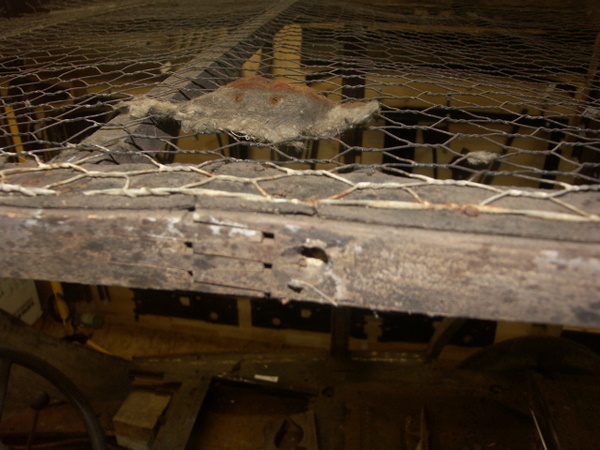 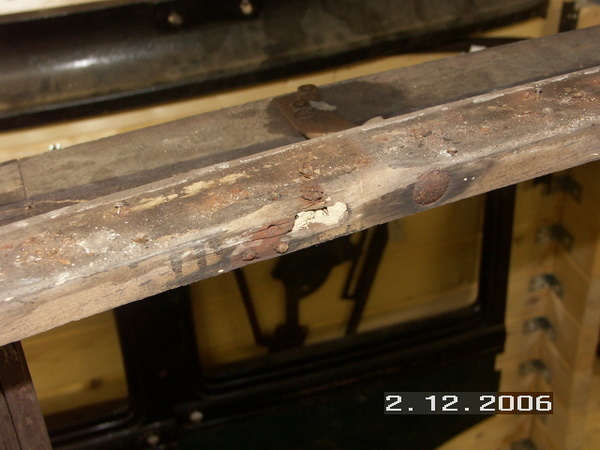 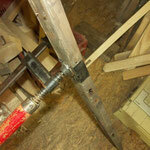 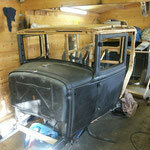 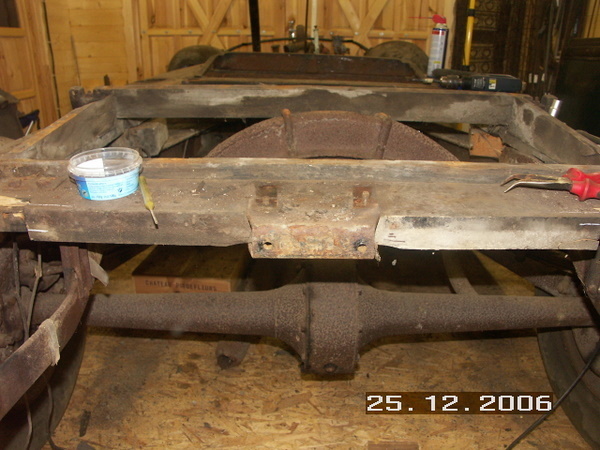 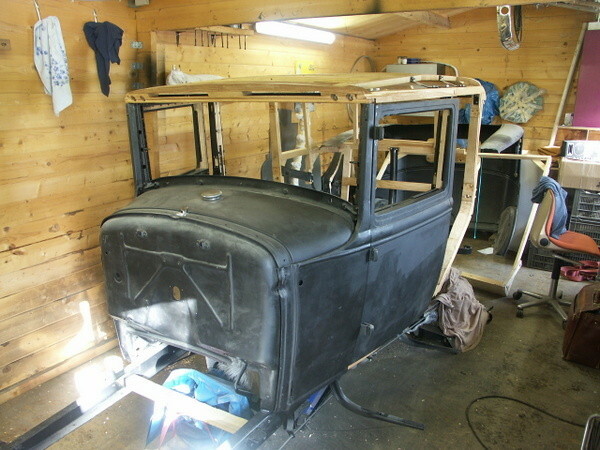 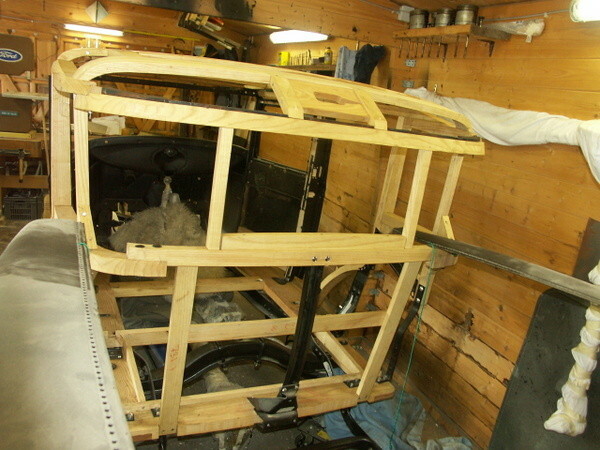 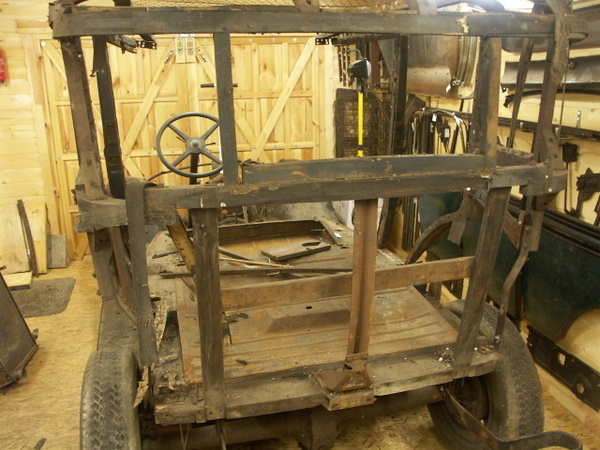 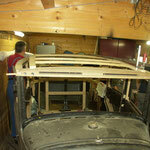 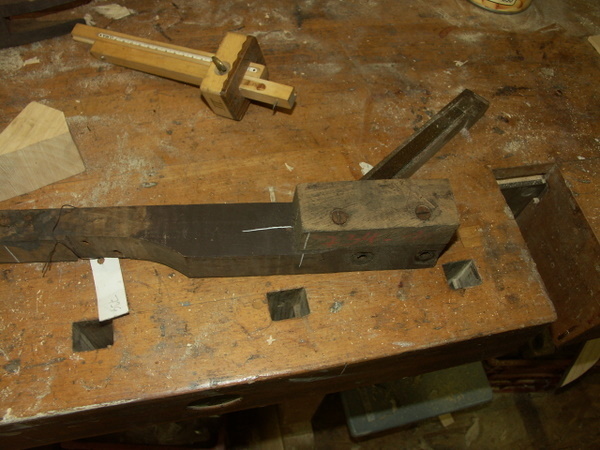 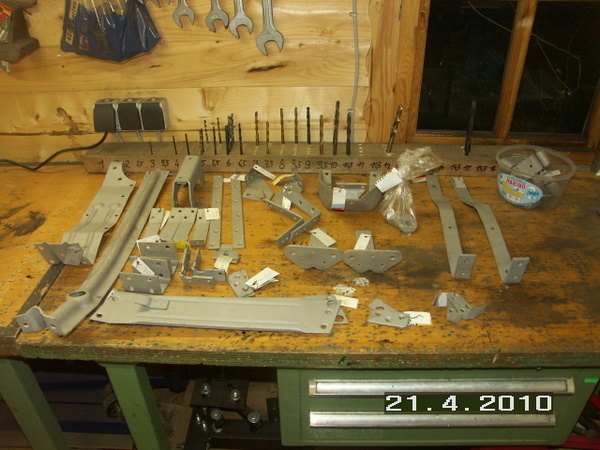 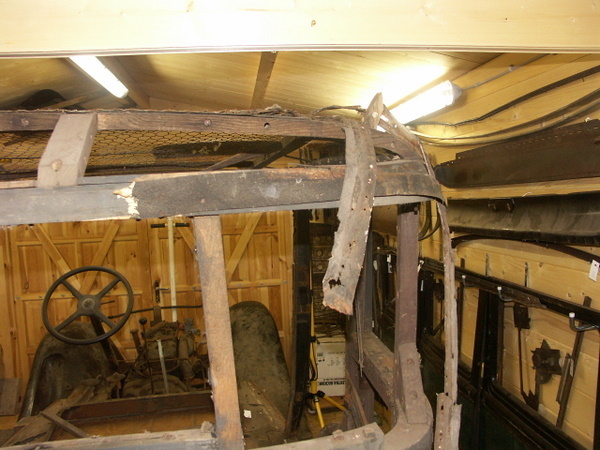 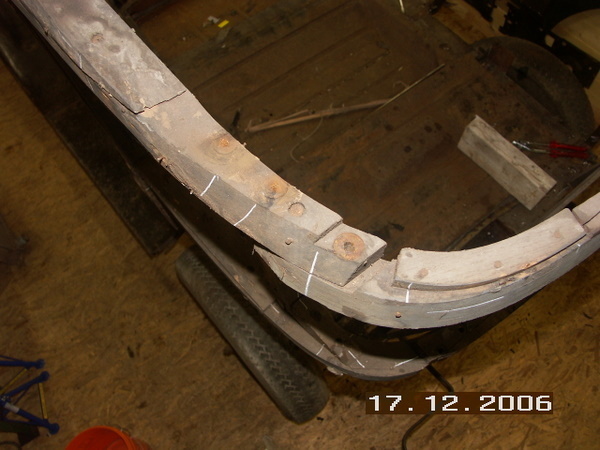 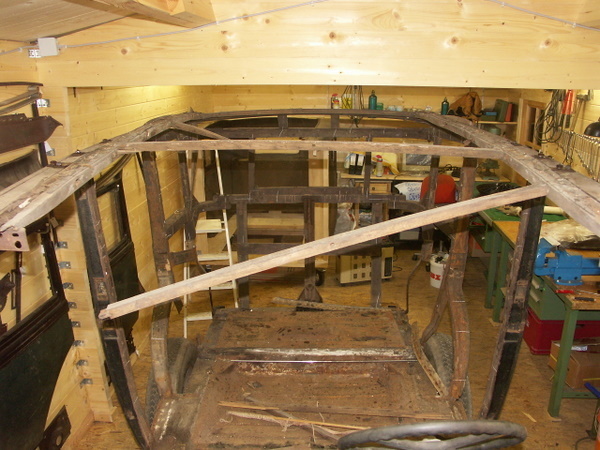 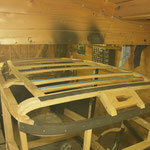 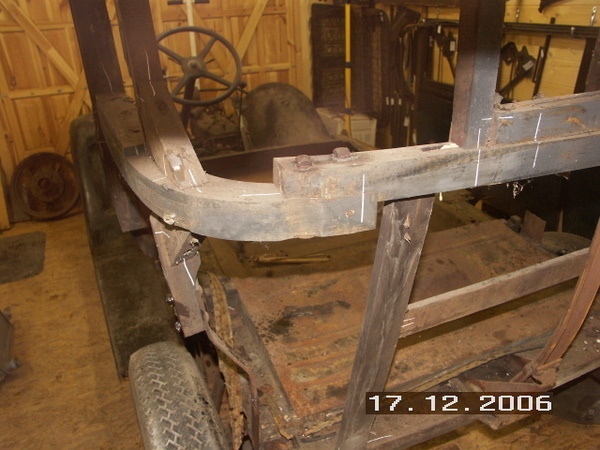 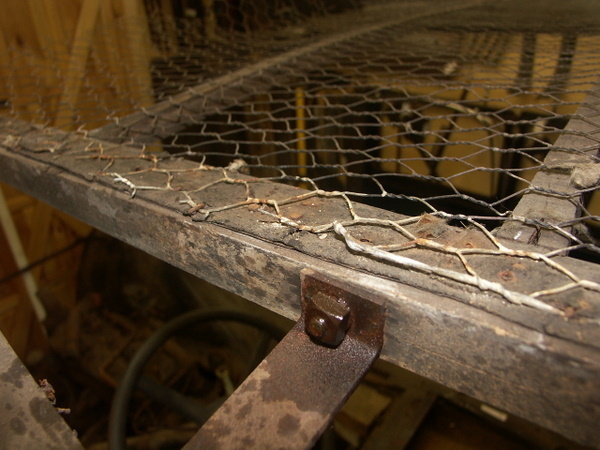 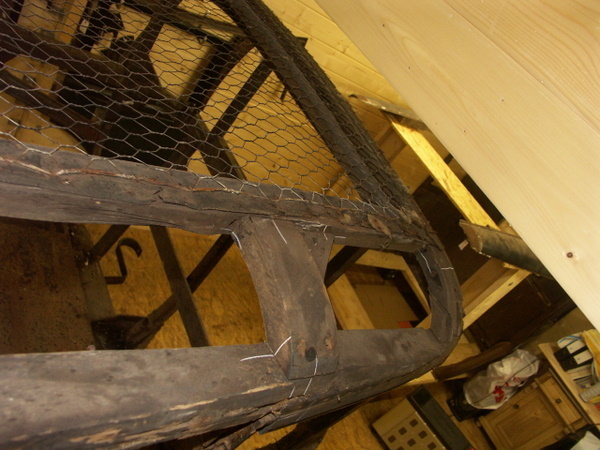 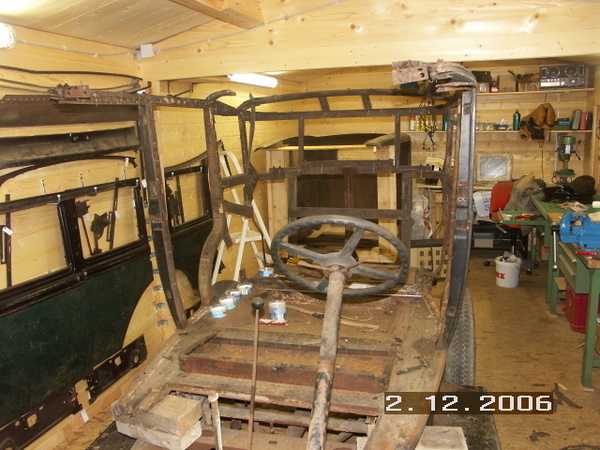 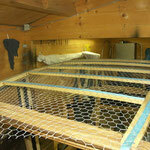 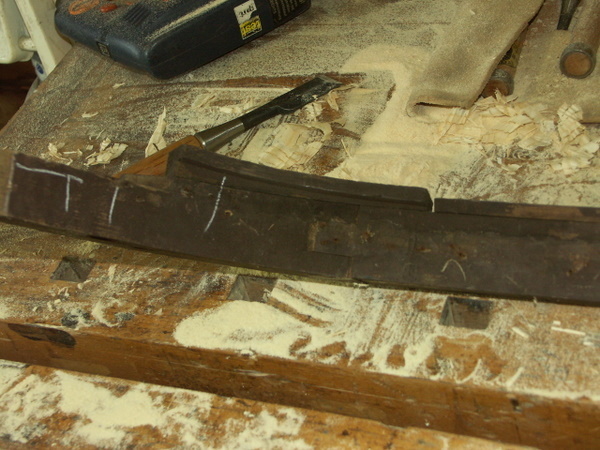 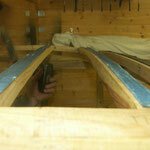 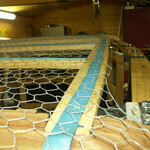 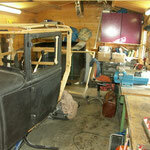 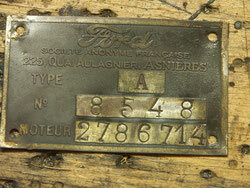 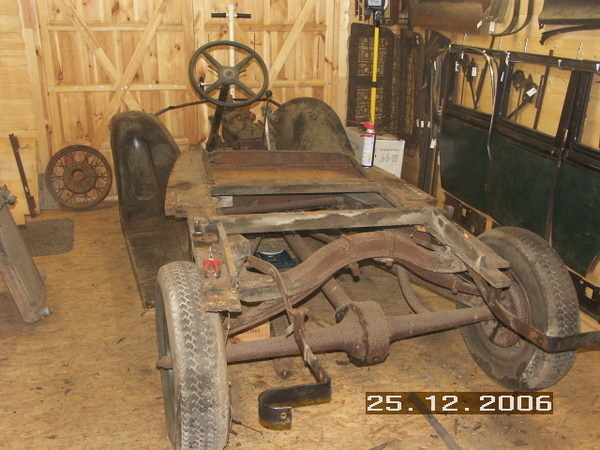 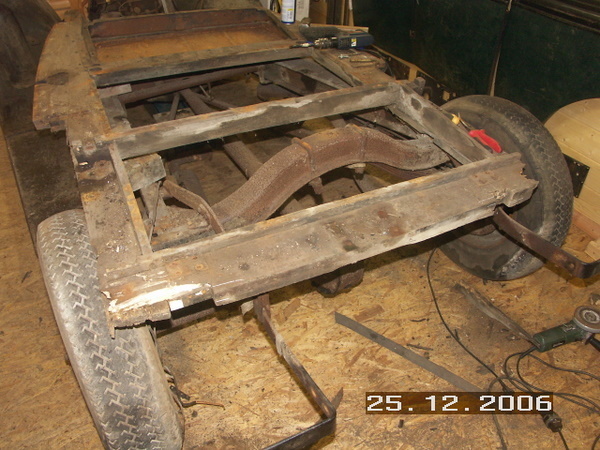 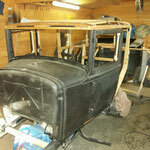 Now the fitting process of wooden sceleton to the sheet metal has begun. 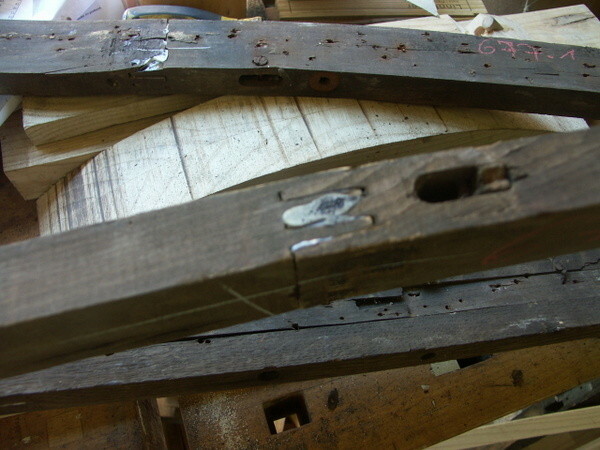 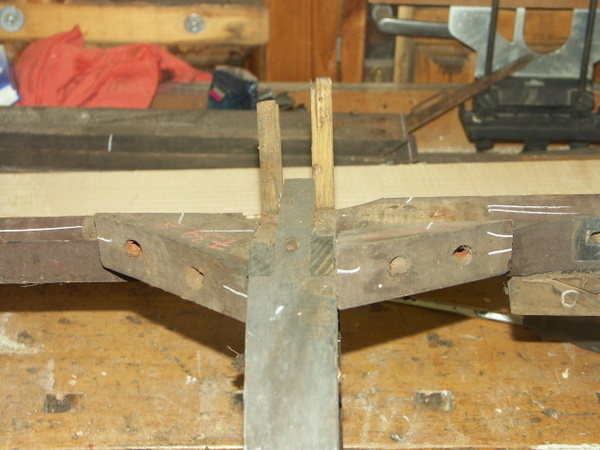 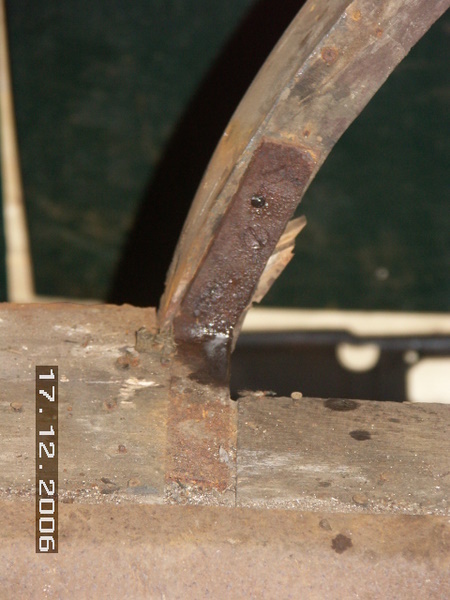 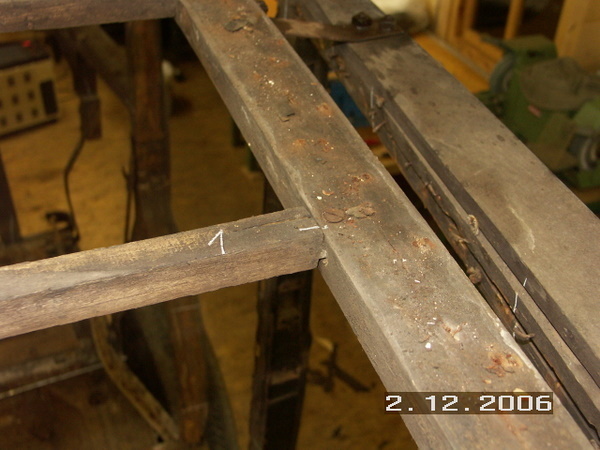 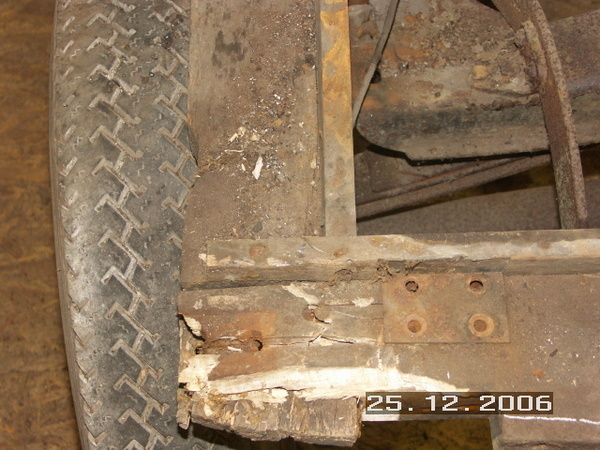 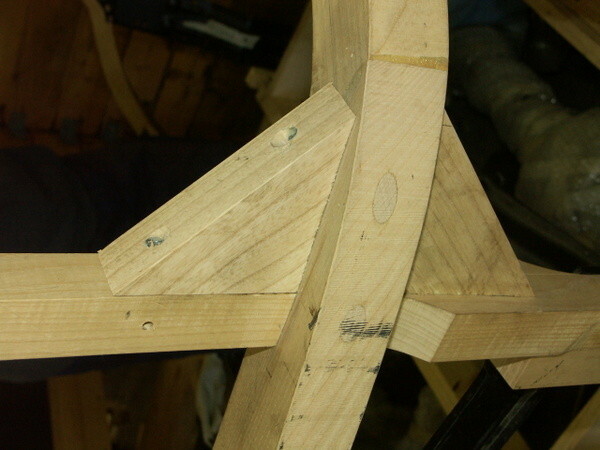 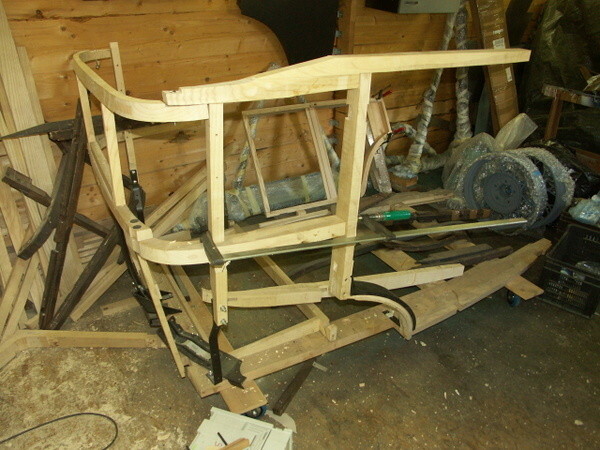 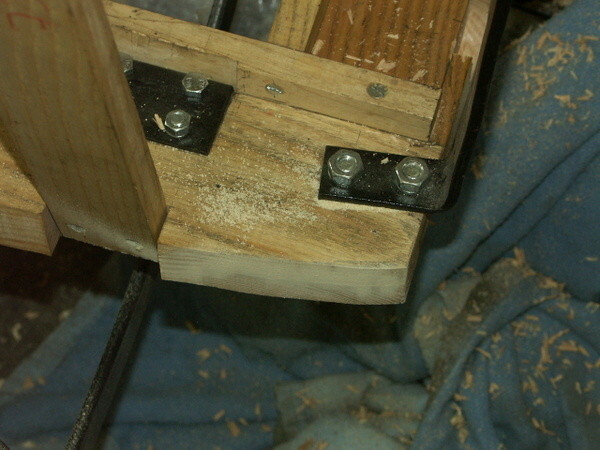 Al further pictures of the fitting process will be found in Body assembly and wood fitting. 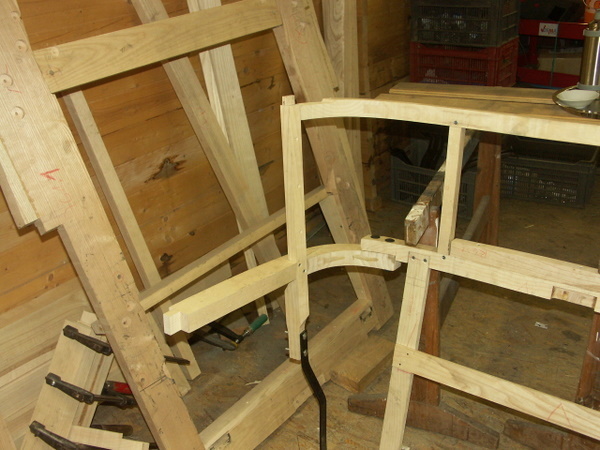 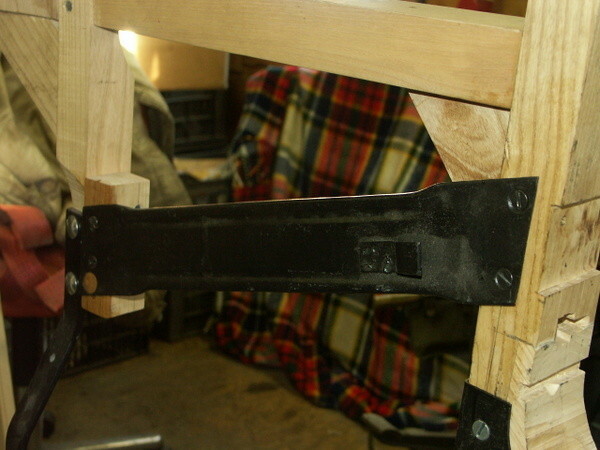 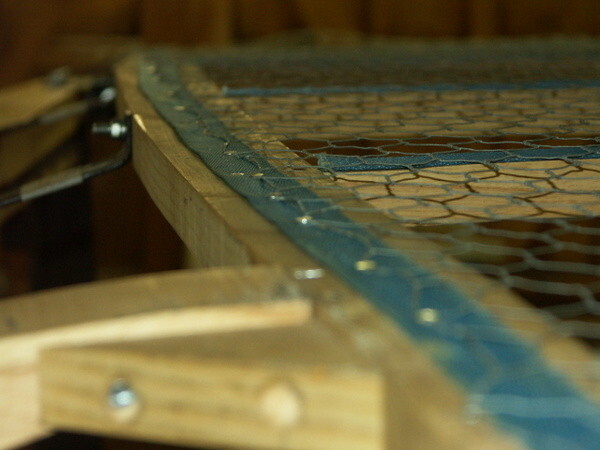 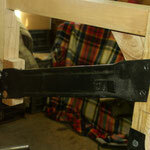 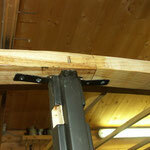 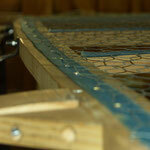 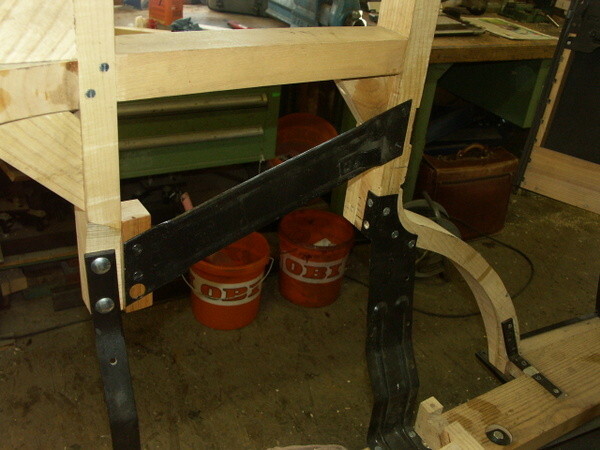 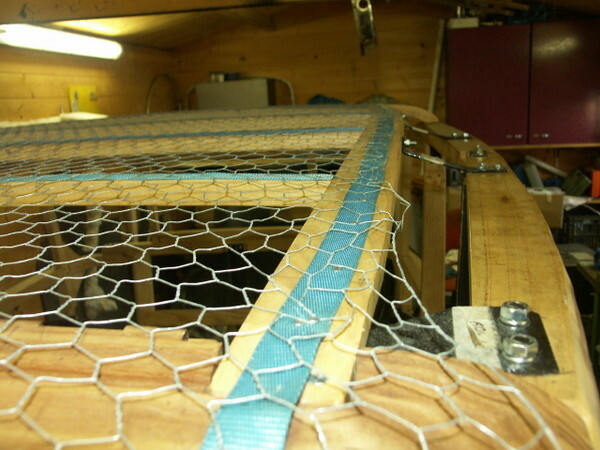 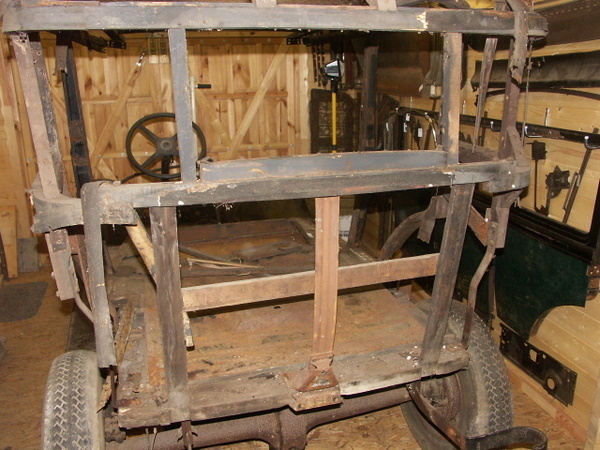 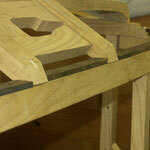 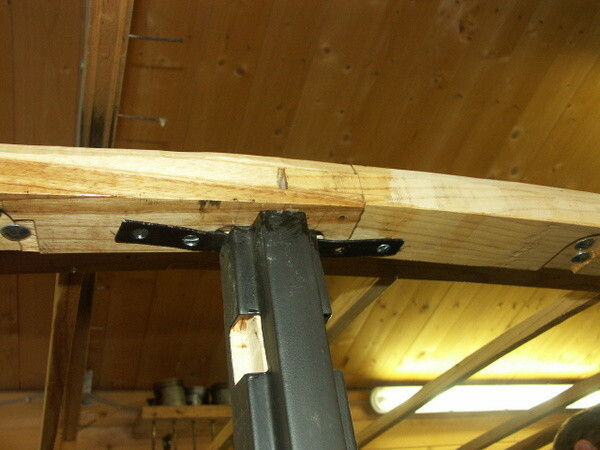 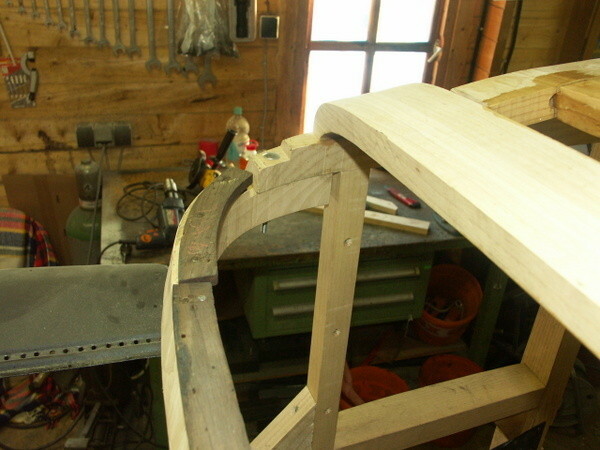 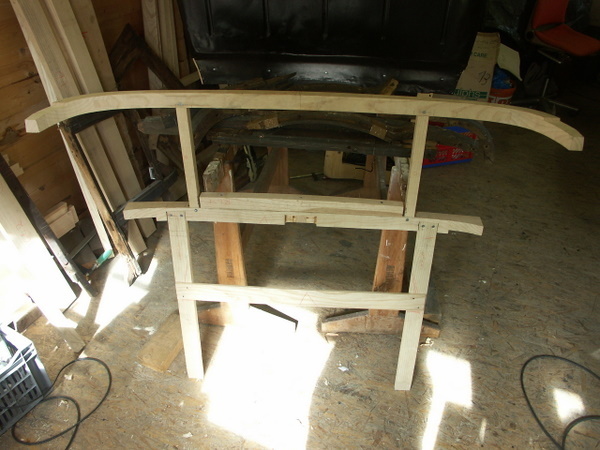 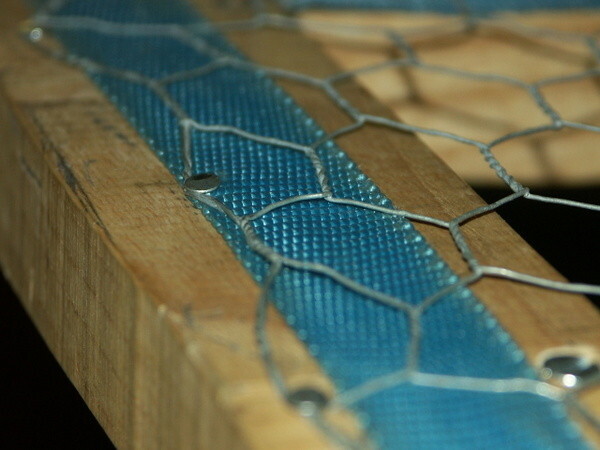 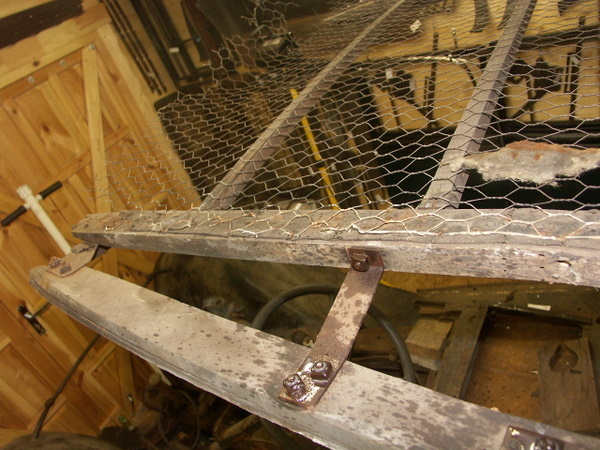 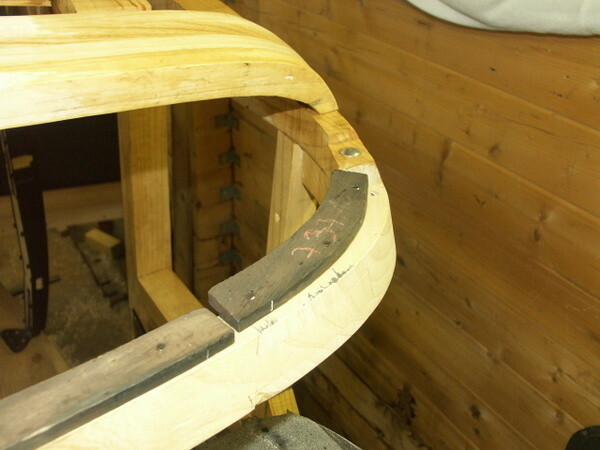 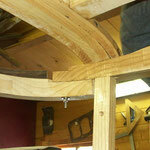 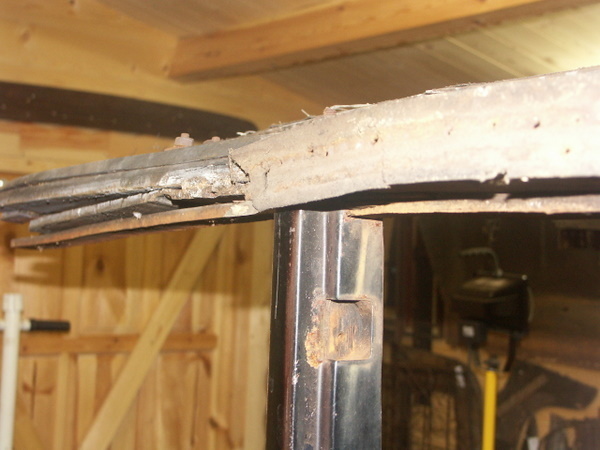 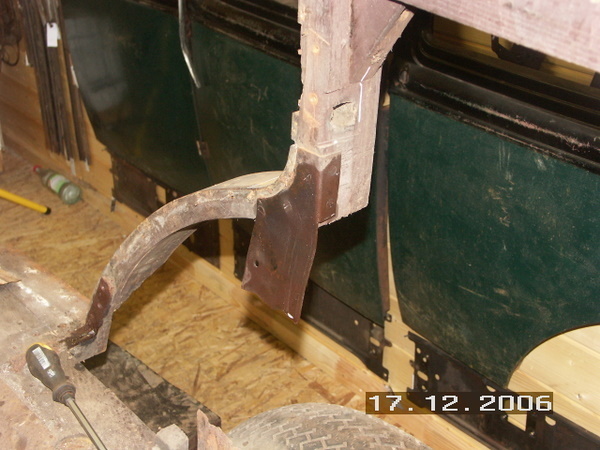 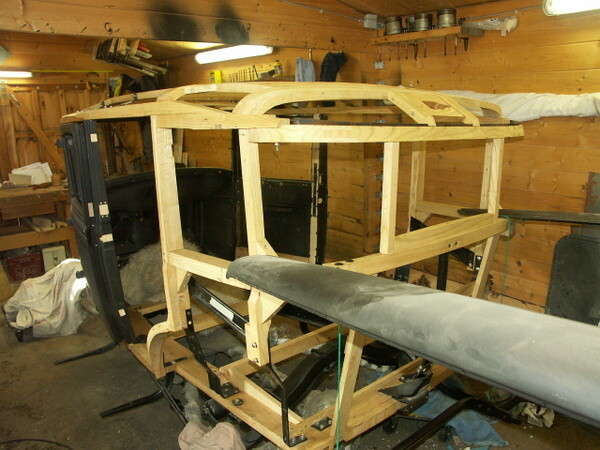 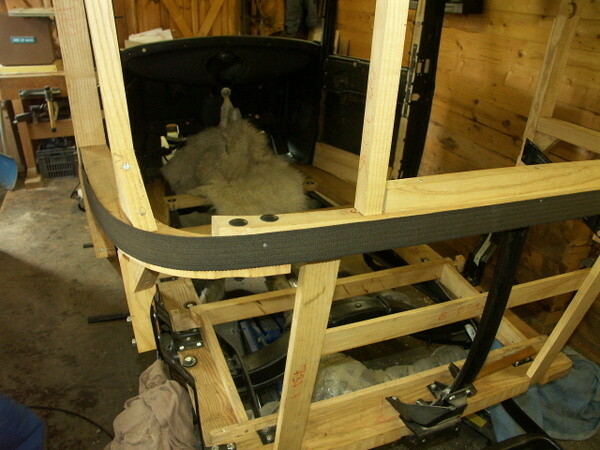 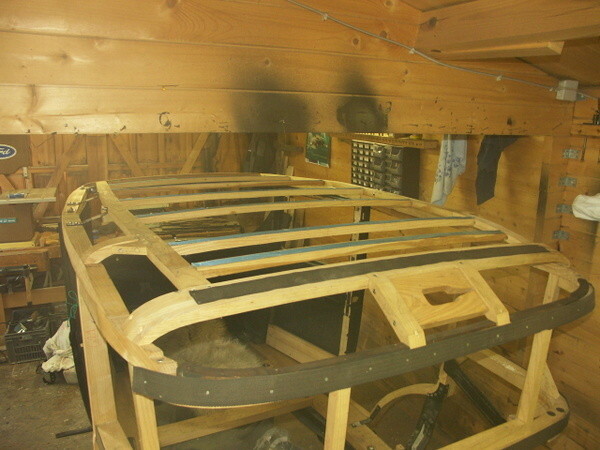 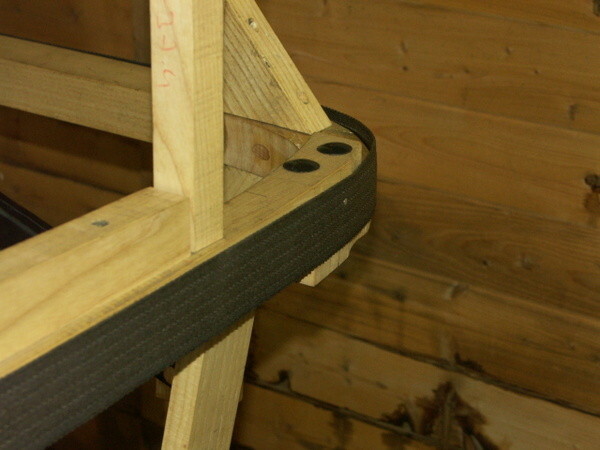 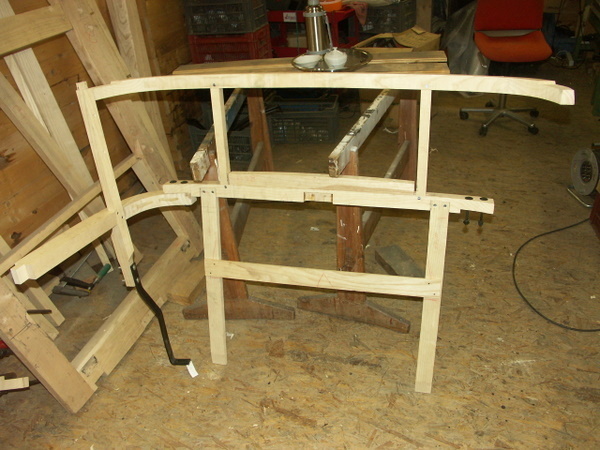 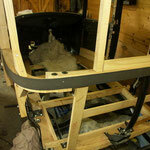 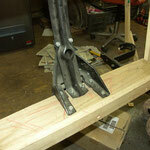 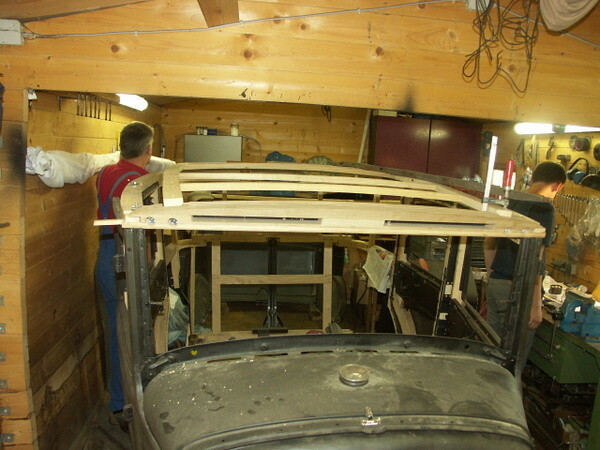 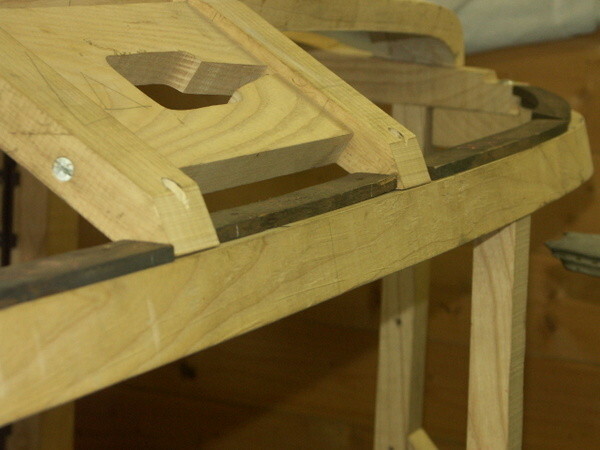 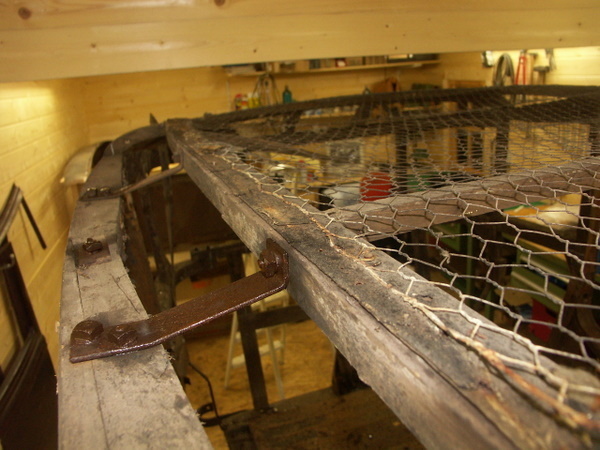 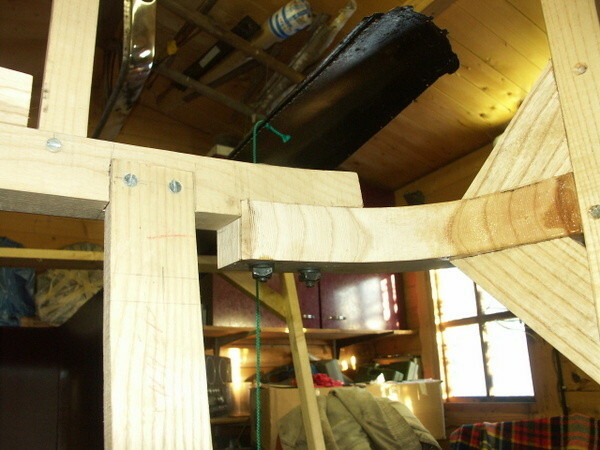 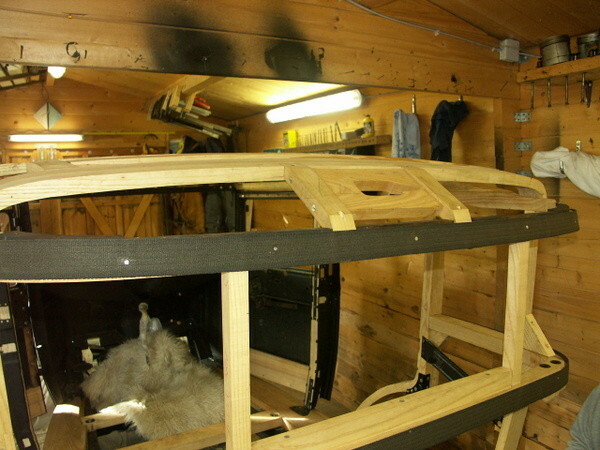 Inner and outer side rails are finished. 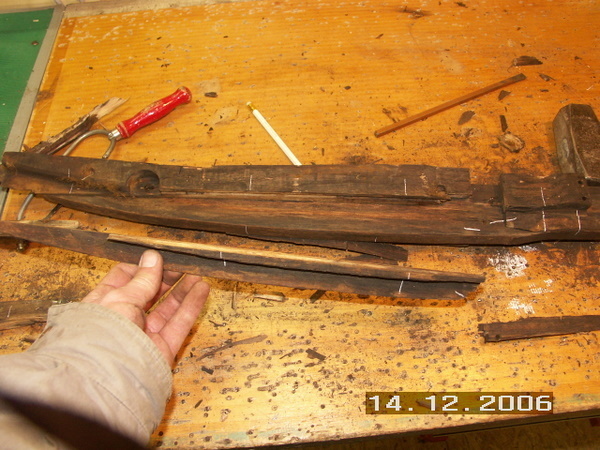 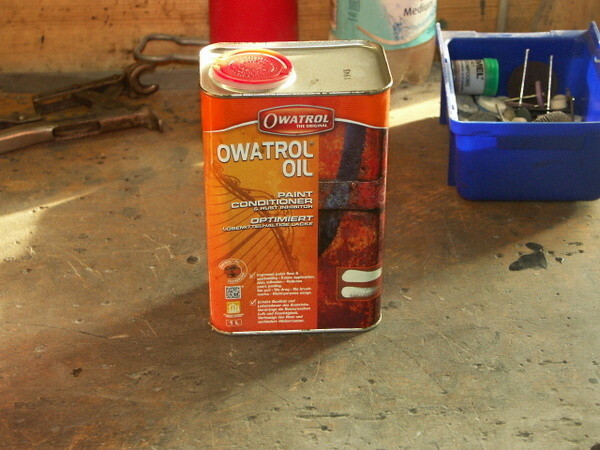 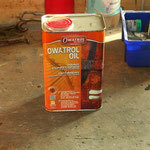 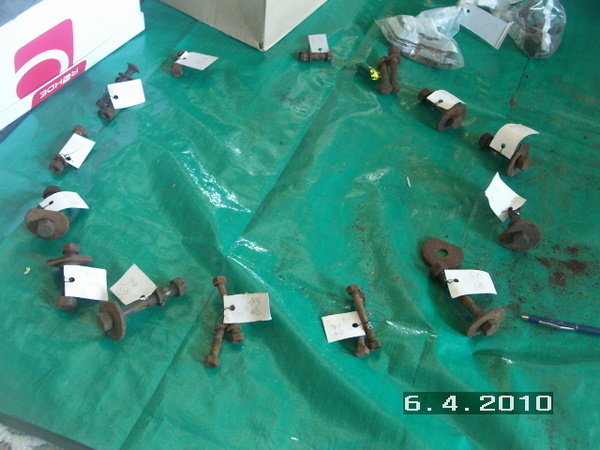 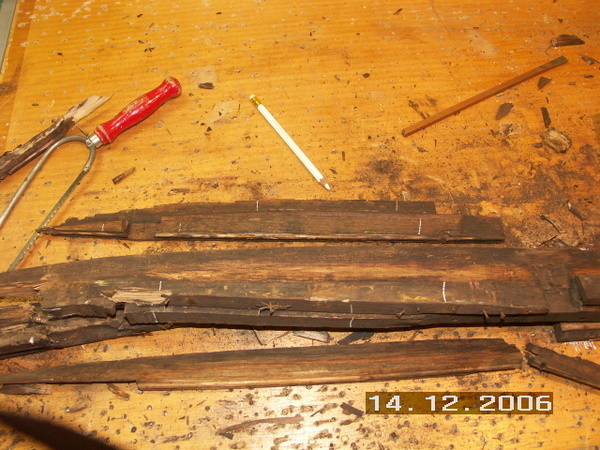 January 4th 2014: Wooden sceleton is finished and painted with ovatrol oil, below you find pictures in detail.